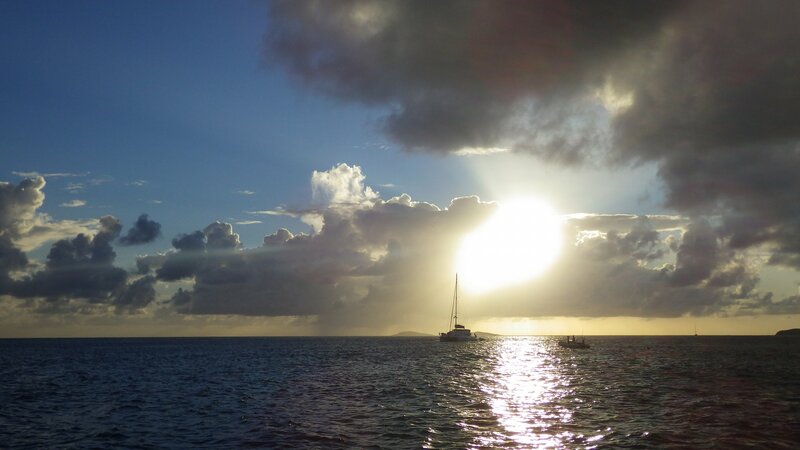 "Life is what happens while we are busy making plans" -- John Lennon. 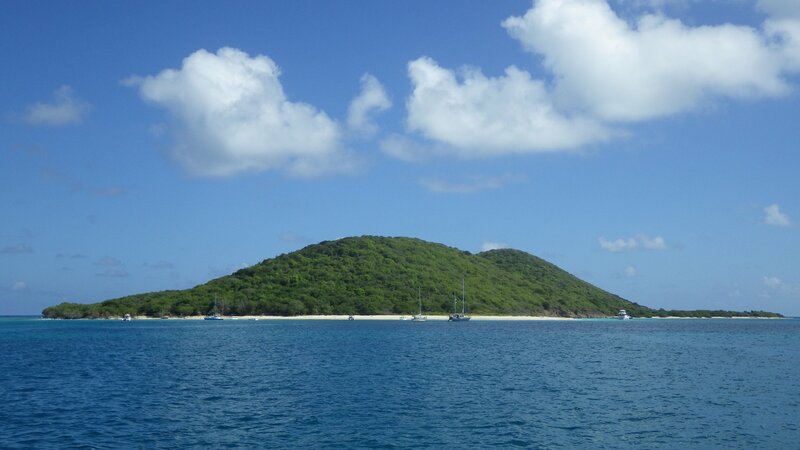 There are three main islands in the US Virgins. 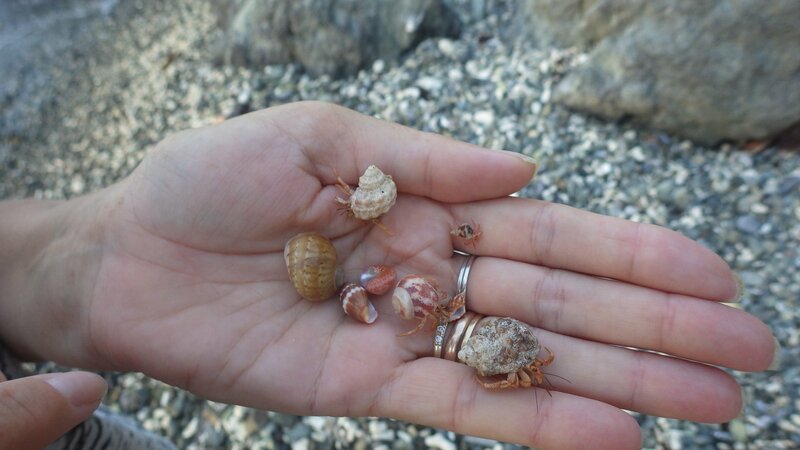 Each has a different history and has developed in a different way. 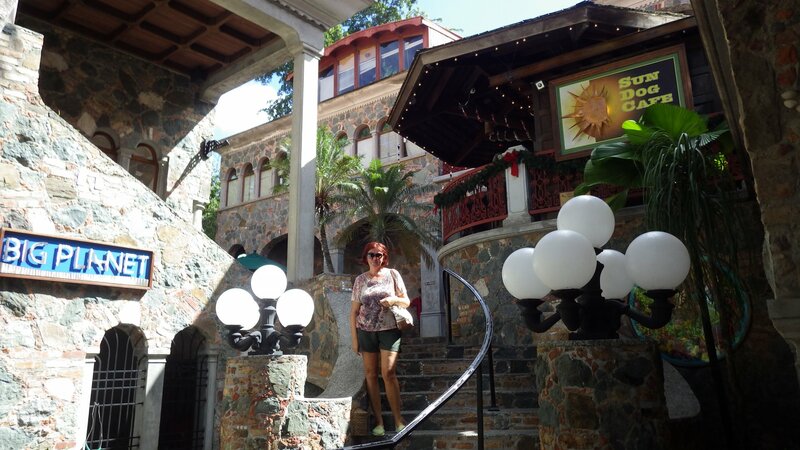 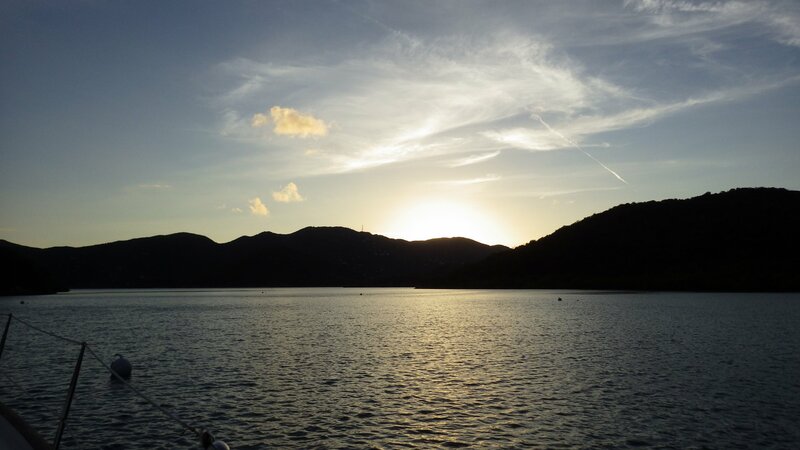 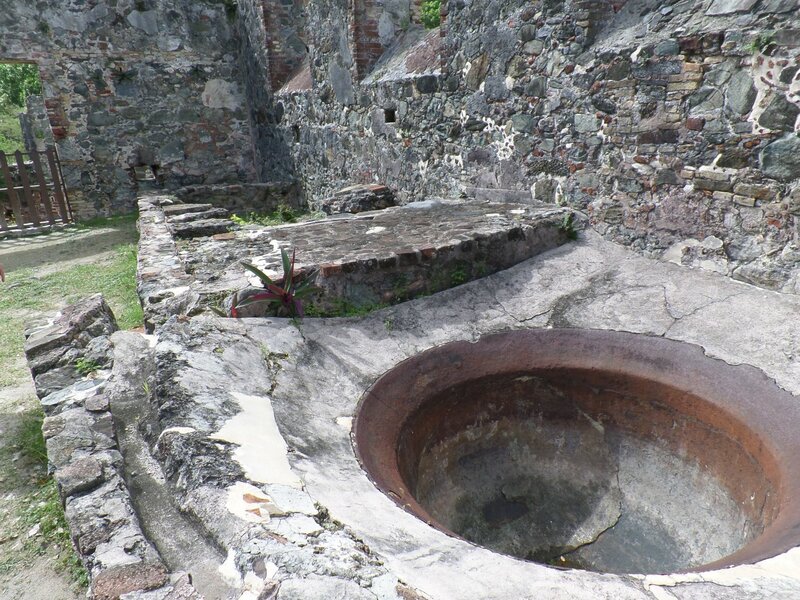 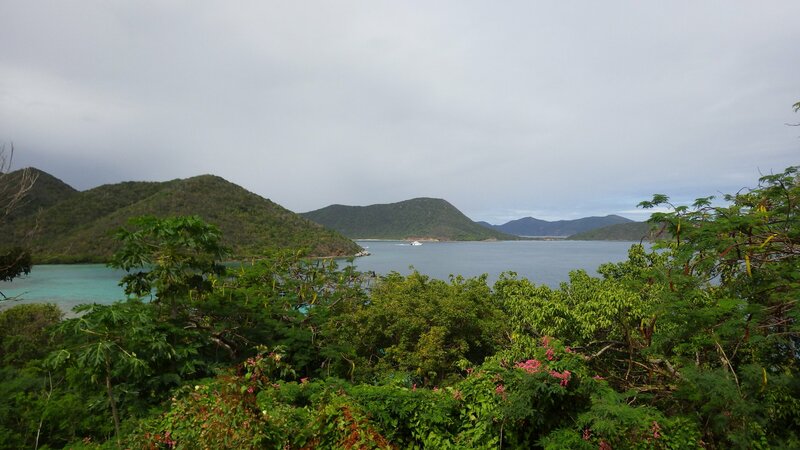 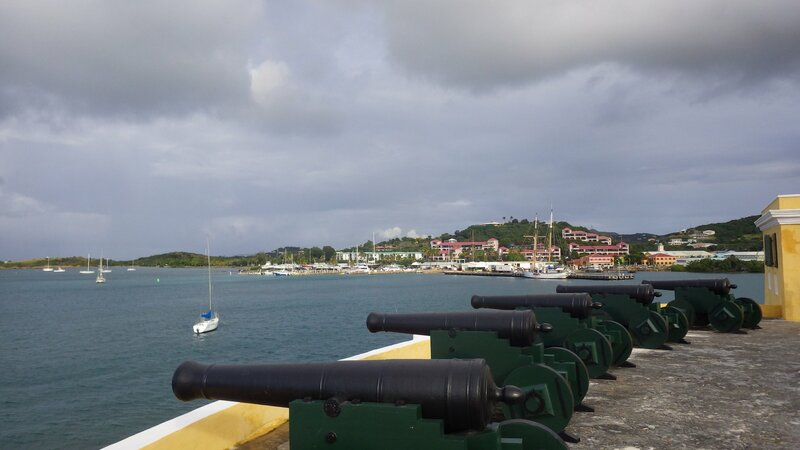 St. Thomas is modern and touristy, St. John is still in an almost untouched natural state and a large part of it is a Natural Park, St. Croix is still living in its colonial past. 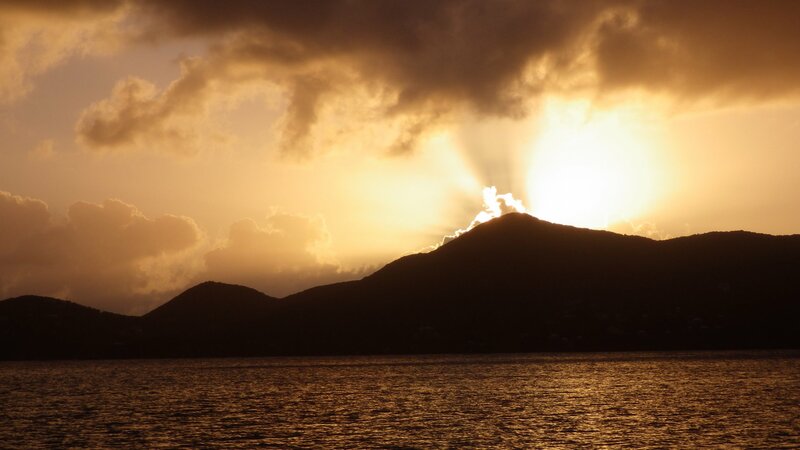 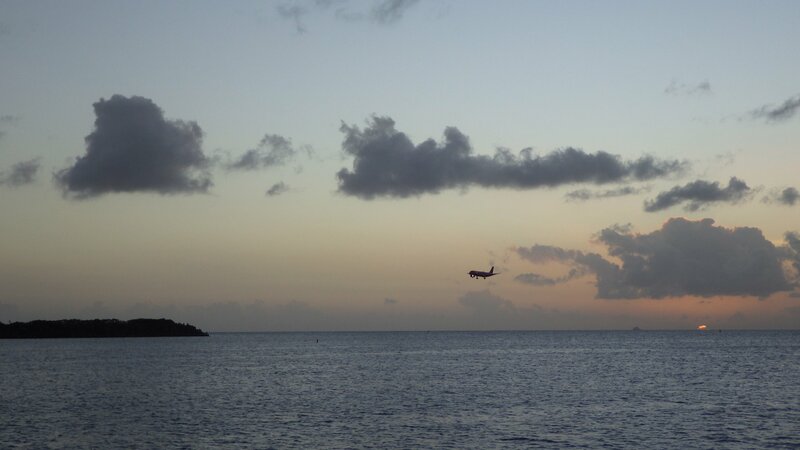 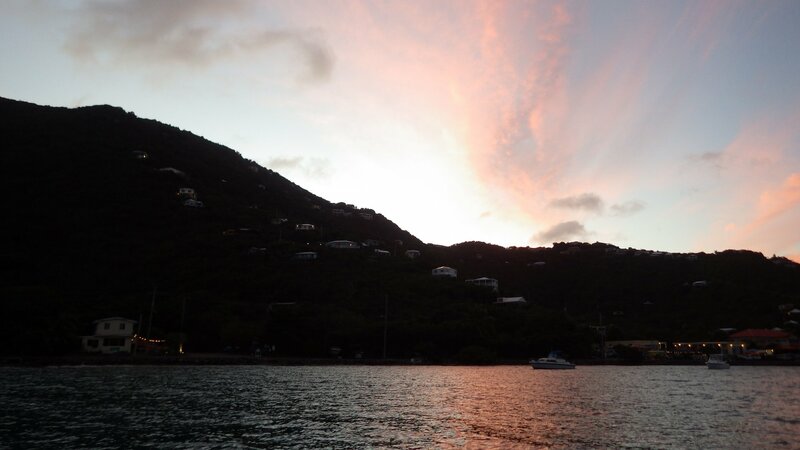 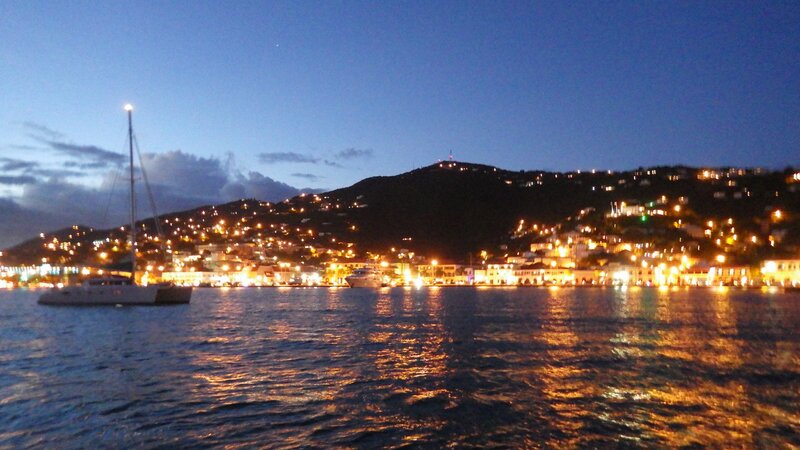 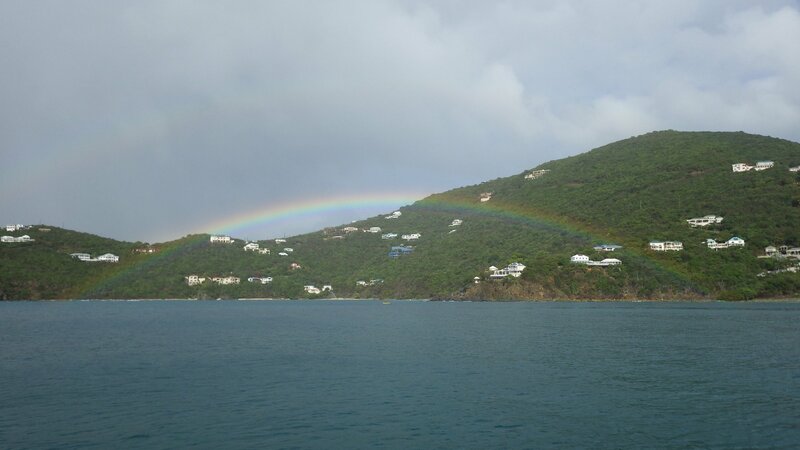 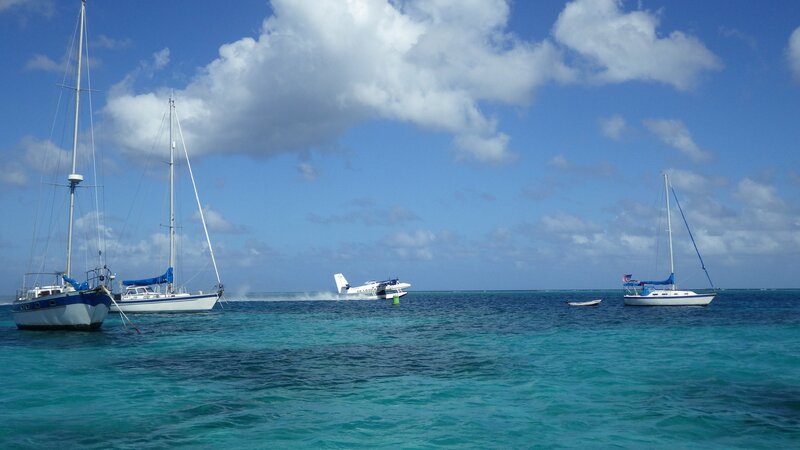 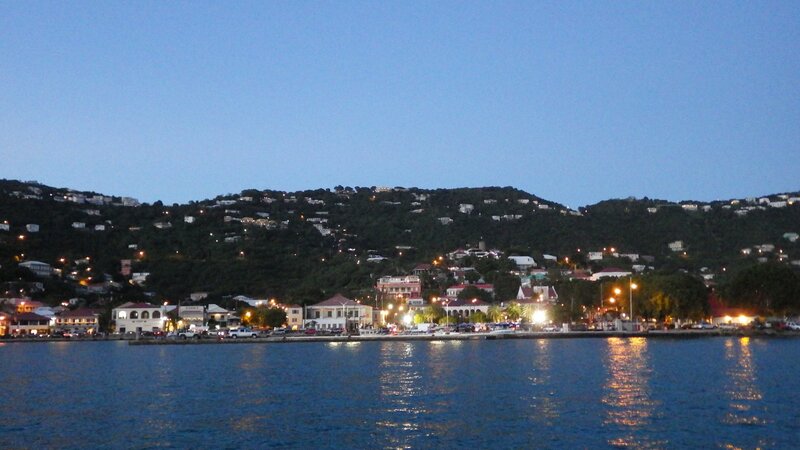 This was our first landing in US Virgin Islands, on the South West side of St. Thomas. 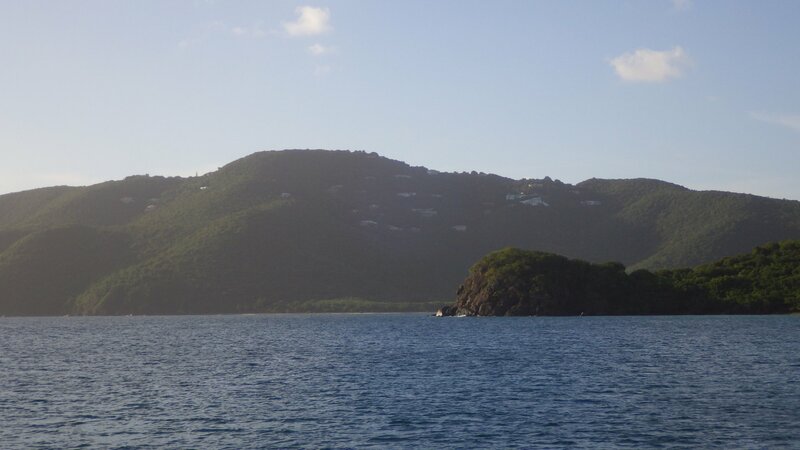 Majestic hills hanging over the bay, lively fish and some pelicans. 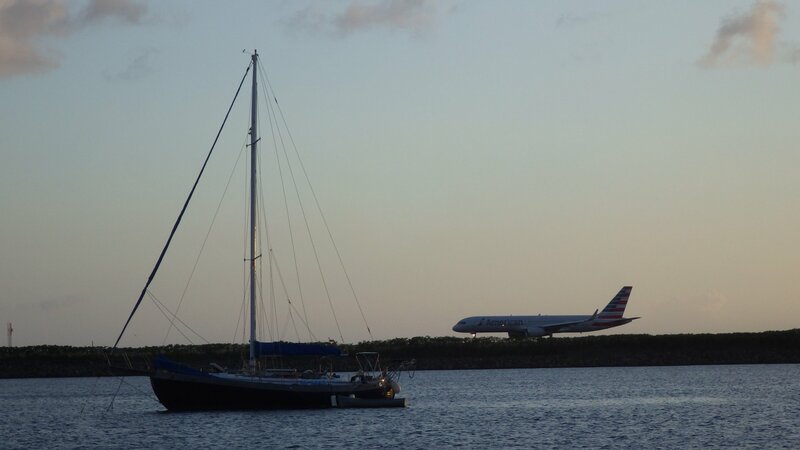 It is a calm and welcoming bay... behind an airport runway. There was a bit if noise from the planes taking off and landing, but strangely it didn't bother us much, rather entertained. 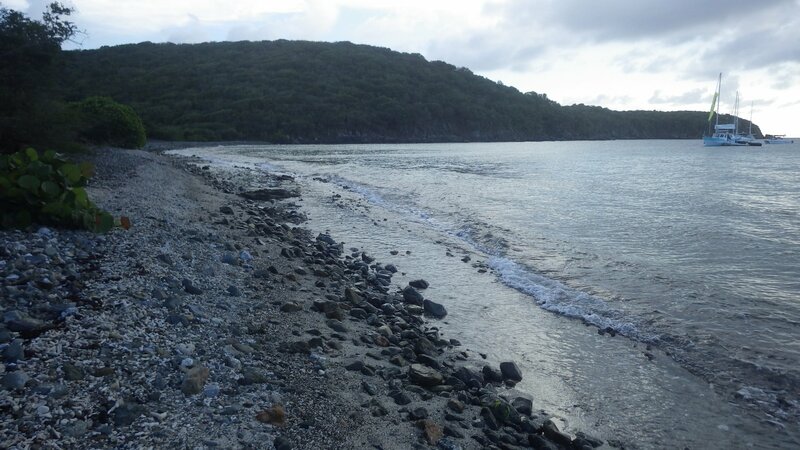 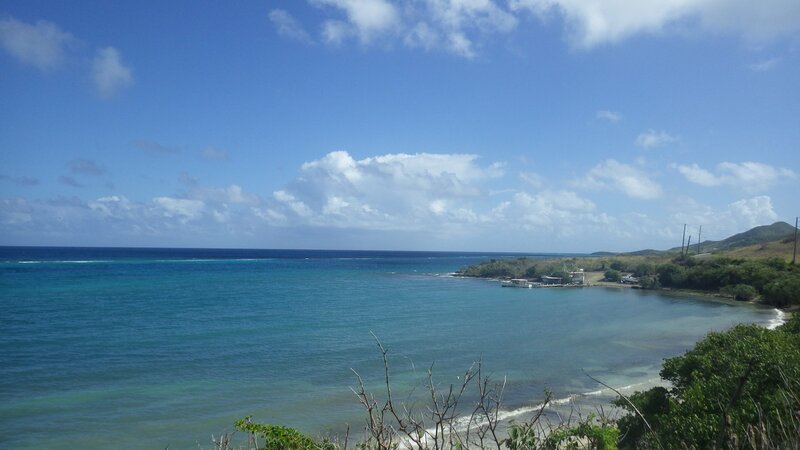 The bay has a nice beach and a short walk to the inexpensive $1 Safari ride to the town and around the island. 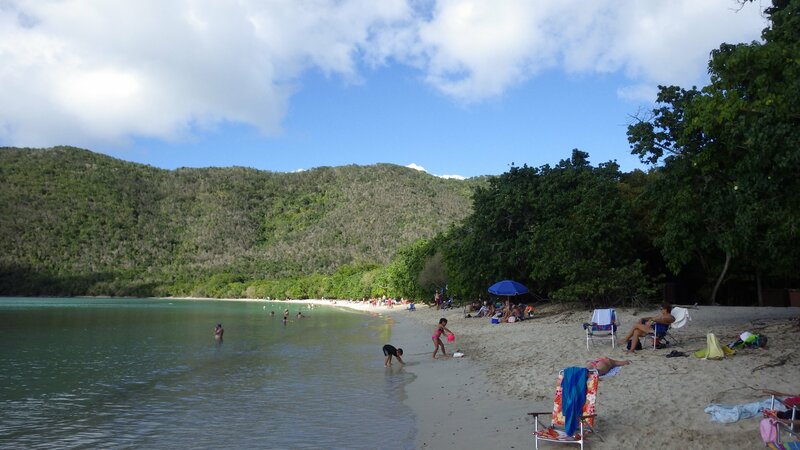 Pretty beach, fun place, but very crowded at times. 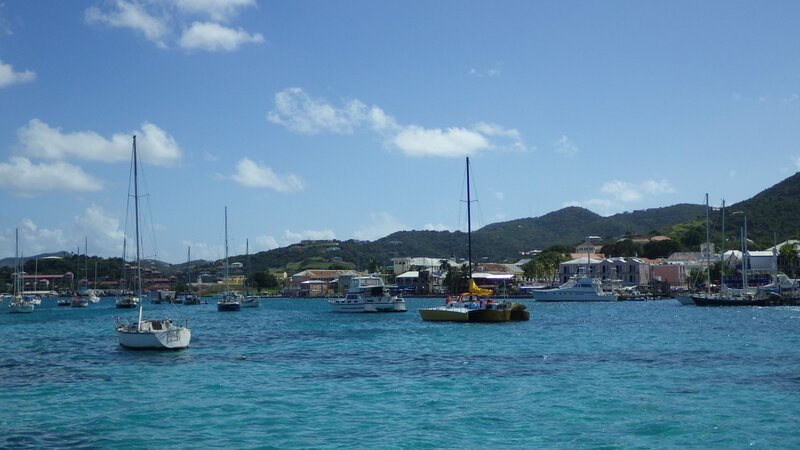 Excursion boats bring tourist to the beach all day, water traffic, and quite rolly. 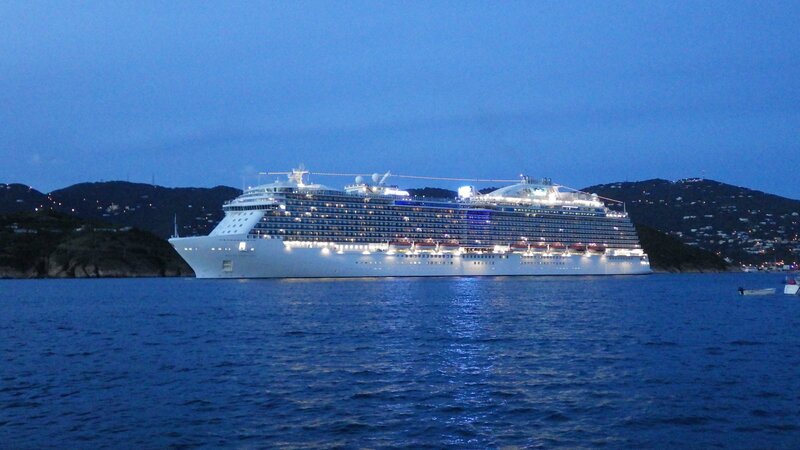 View of cruiseships leaving at night. 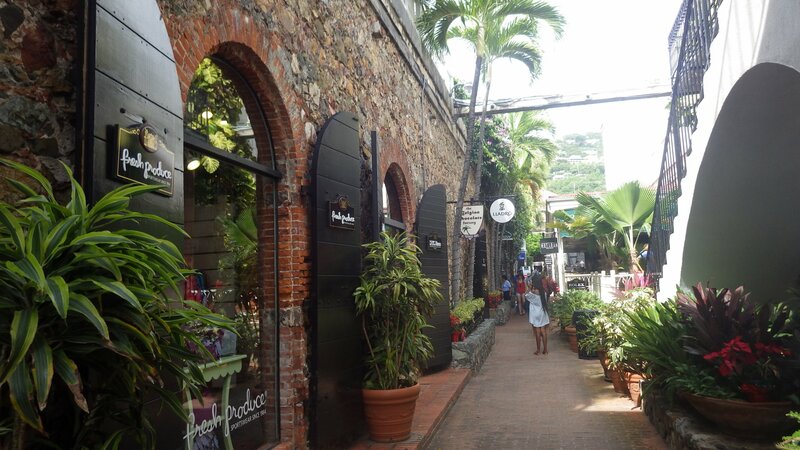 A modern, very touristy and busy. 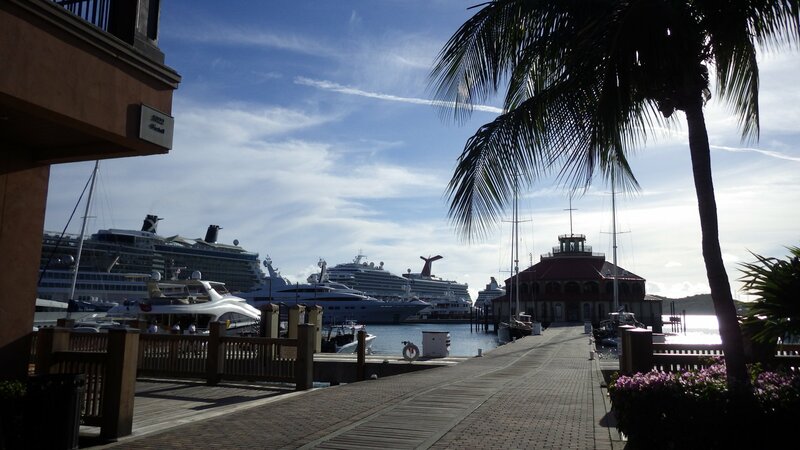 Huge cruiseships bring waves of tourists to separate them from their money at numerous attractions, restaurants, jewelry and boutique shopes. 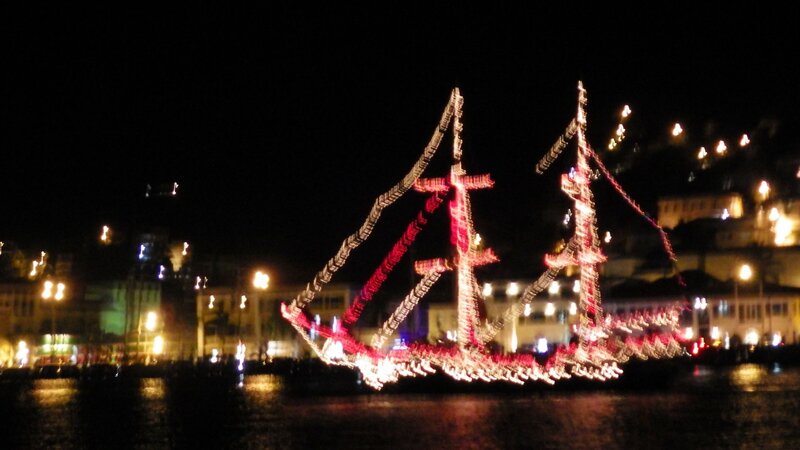 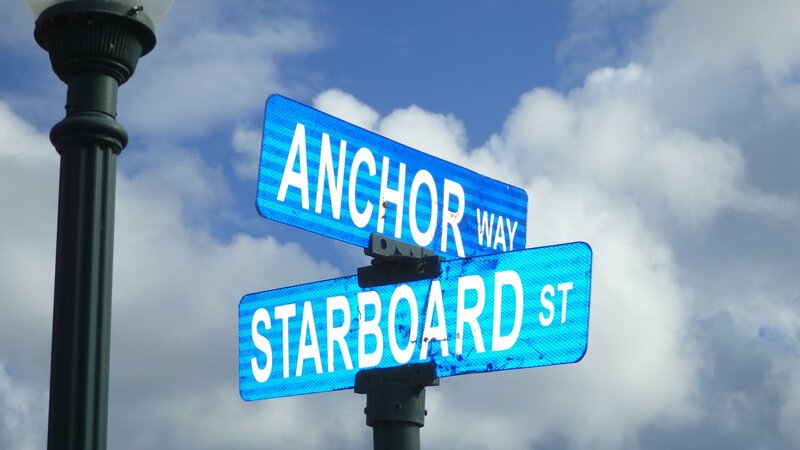 We have planned our stay here to be around an annual Christmas time Miracle on Main Street nautical parade. 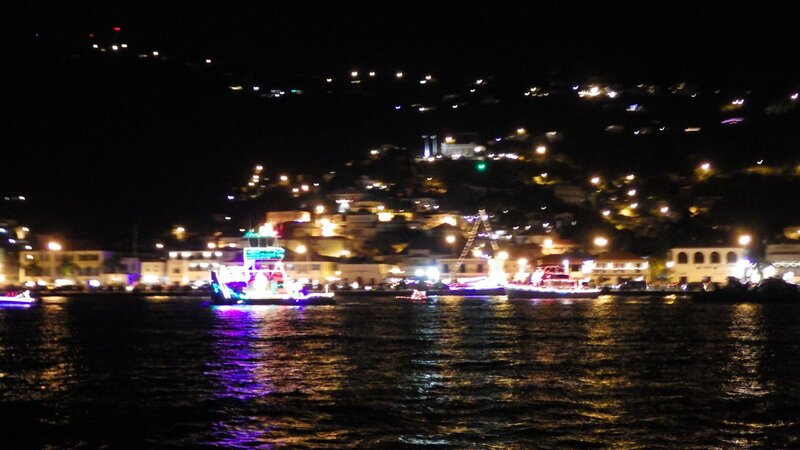 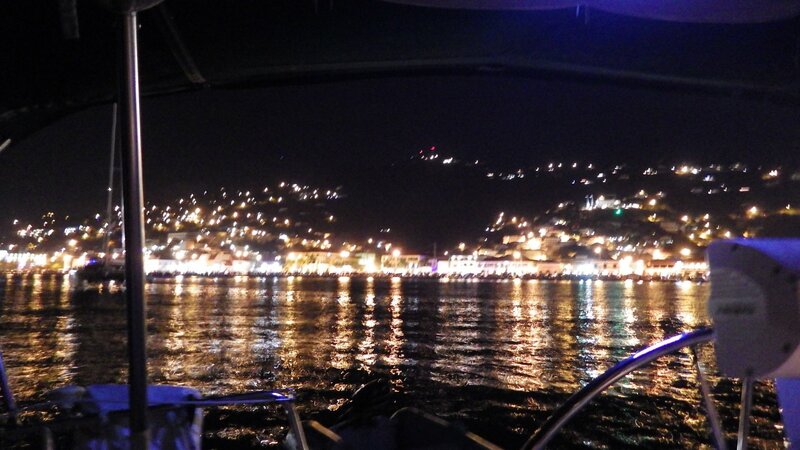 Enjoyed the event from the cockpit of our yacht anchored at the shorefront � quite beautiful and festive. 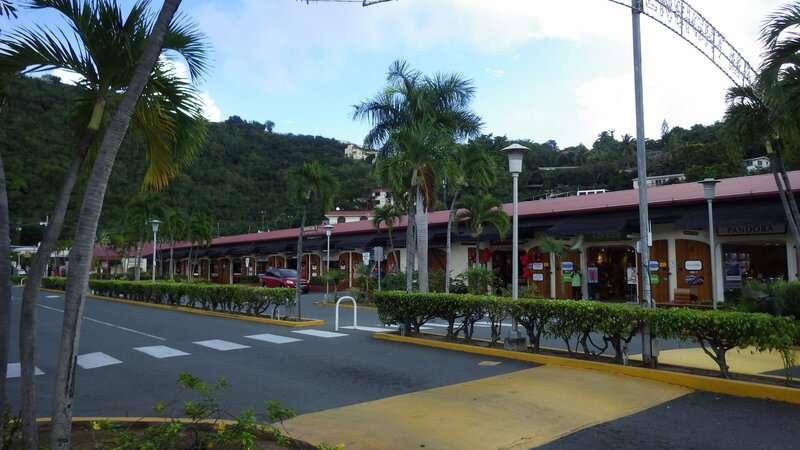 Lots of history (pirate free port in the past), nice parks, good stores, etc. 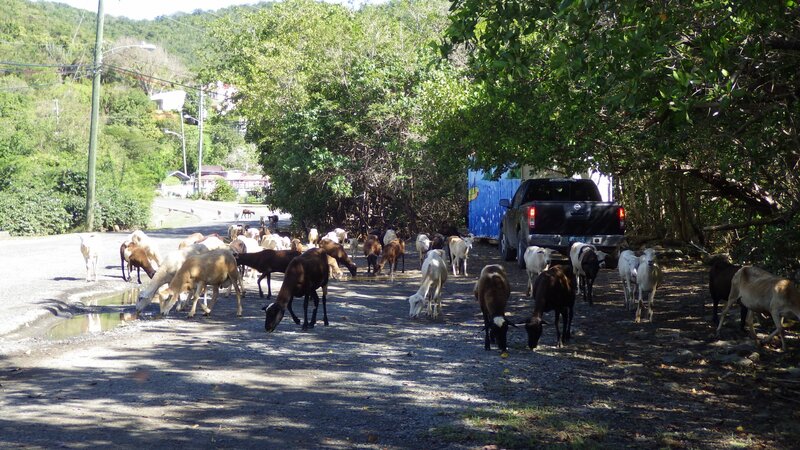 A $1-2 Safari bus can take you all around the island. 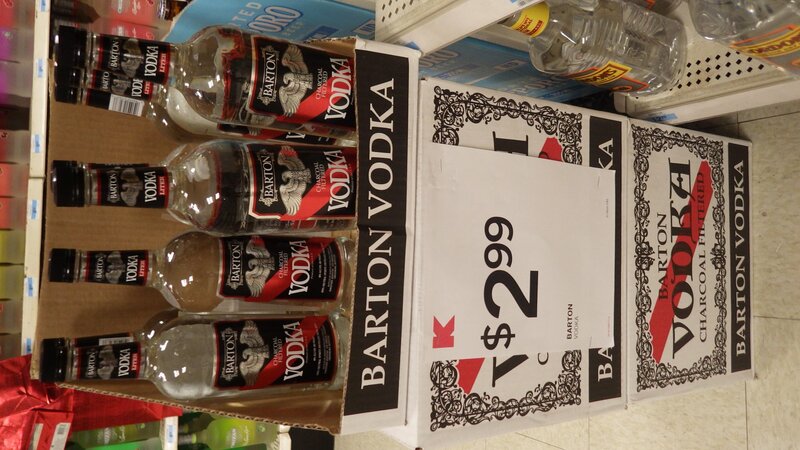 Alcohol is cheapest we have ever seen (for example, a bottle of vodka is USD $3, comparing to $20+ at home in Ontario). 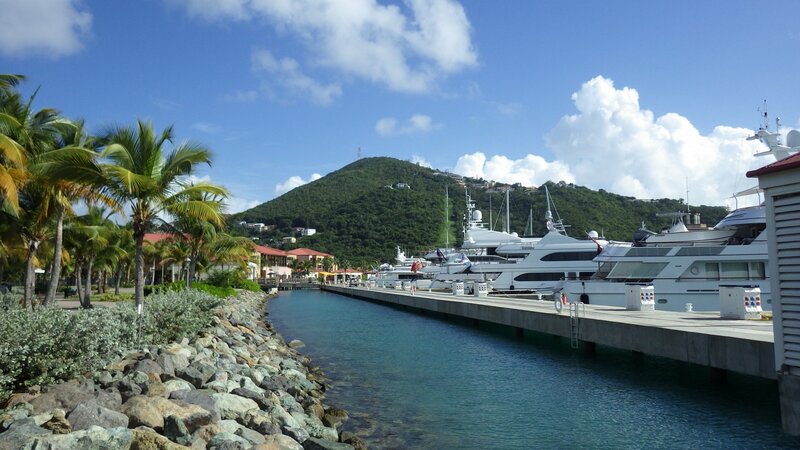 When leaving, we needed to fill our fresh water tanks, and had to wait couple hours in line at the front of the marina entrance. 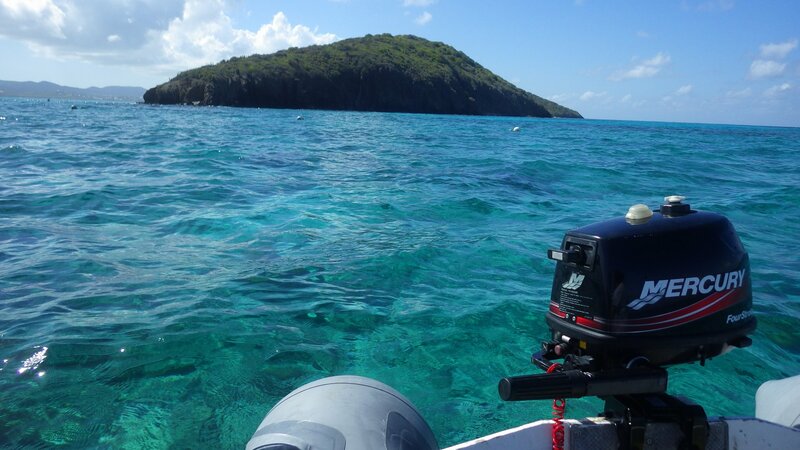 Since beginning of our cruising, we have filled water ranging from $0.00 to $0.50 per gallon, but it's a real chore to go around and hunt for it. 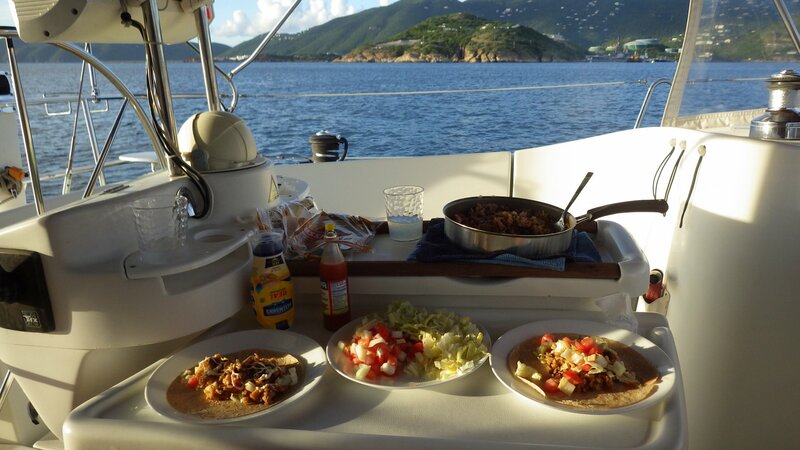 Being on a sailboat (not much fuel use), well stocked (except fresh produce) and have sufficient solar electricity, we are pretty much self sufficient � except for the fresh water. 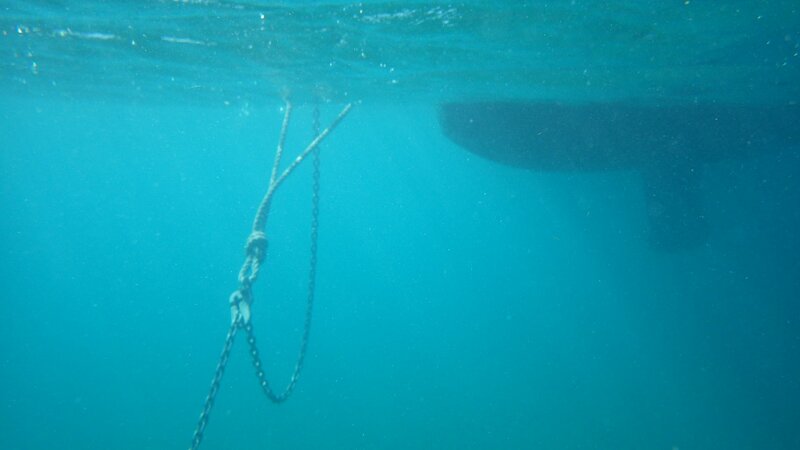 Our tanks can hold up to 2 weeks supply and then we have to fill up. 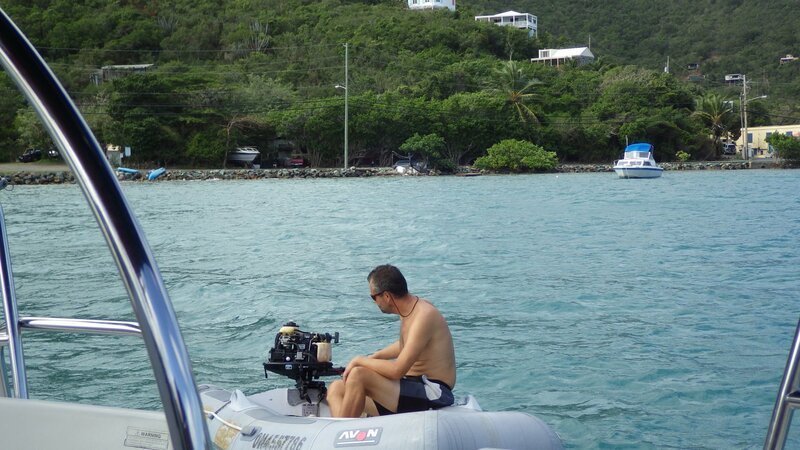 I am starting to really envy cruisers who have installed watermakers/desalinators onboard. 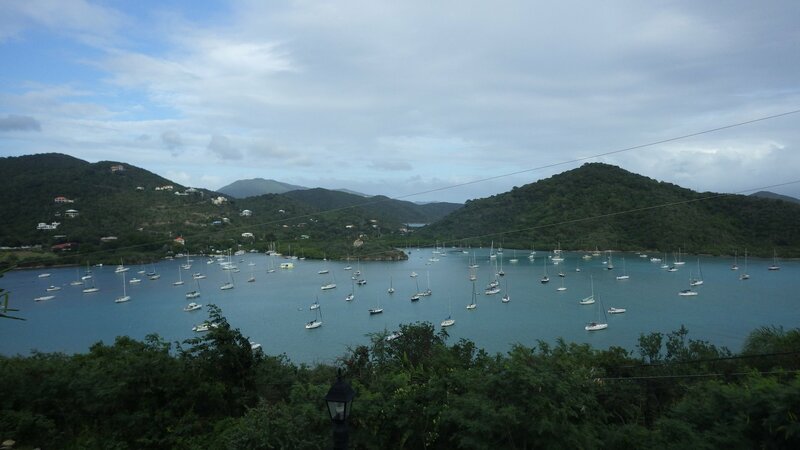 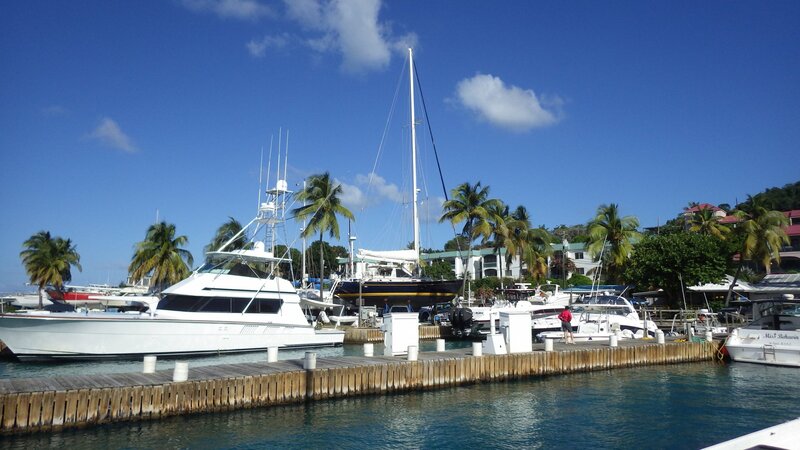 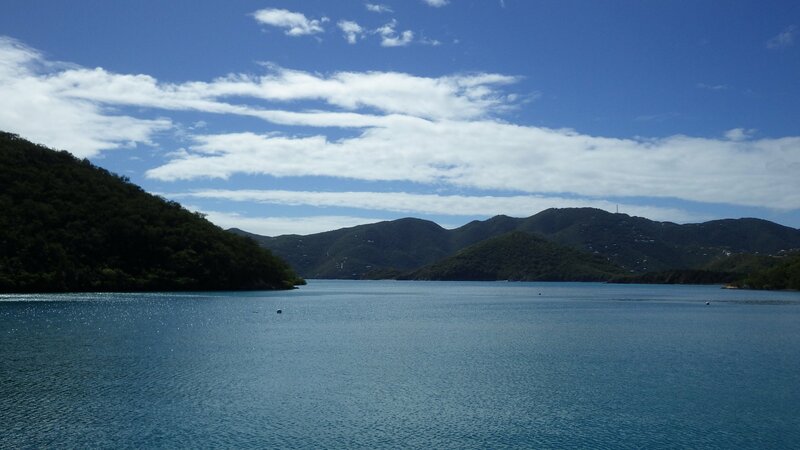 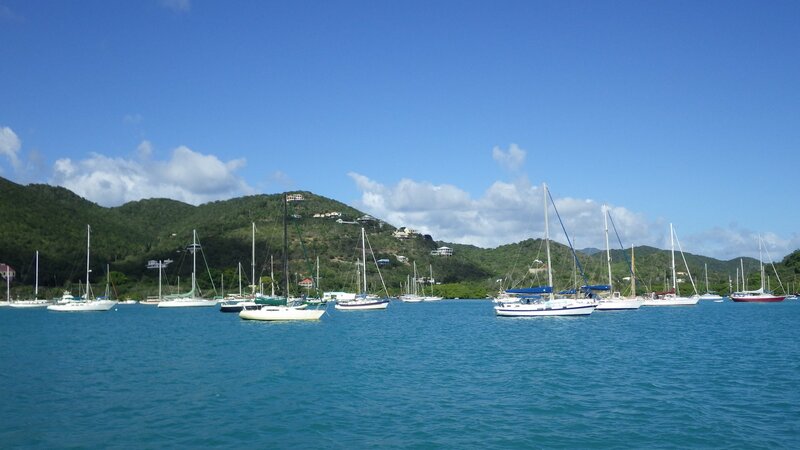 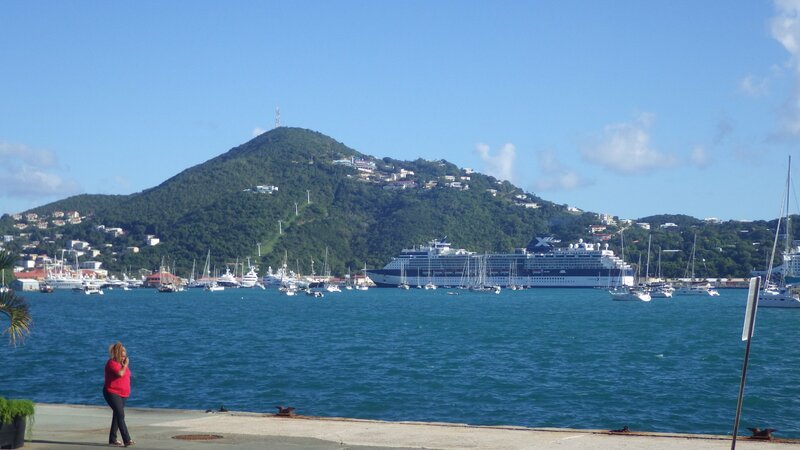 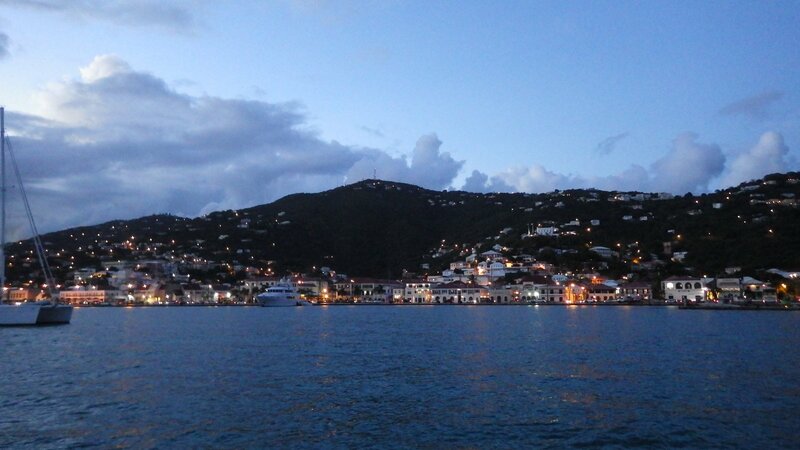 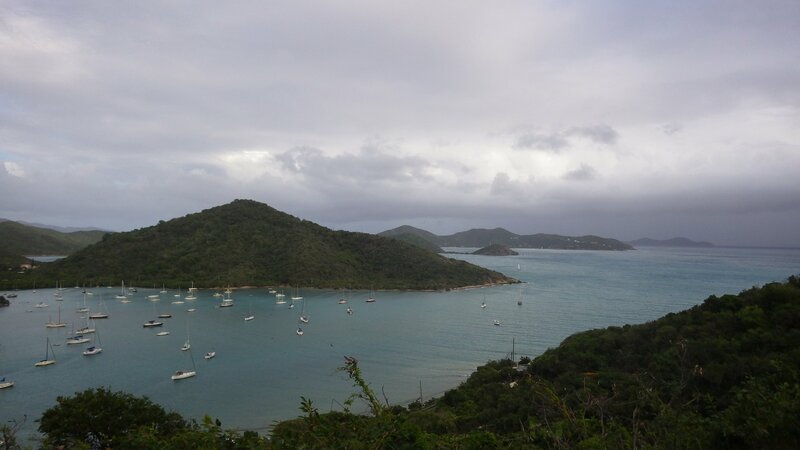 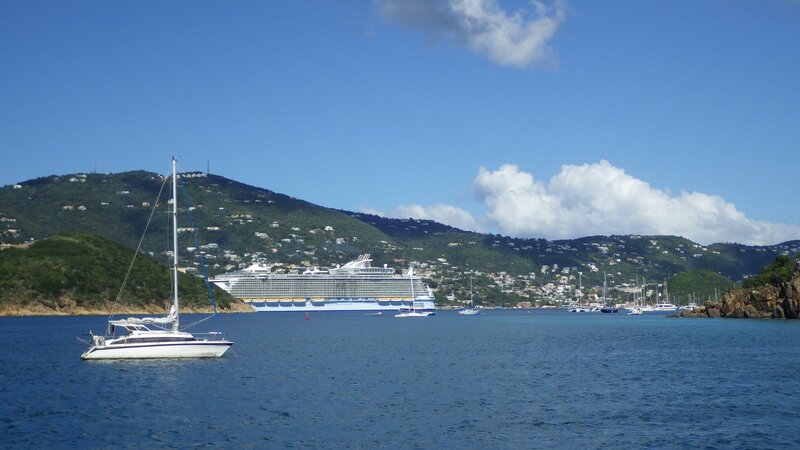 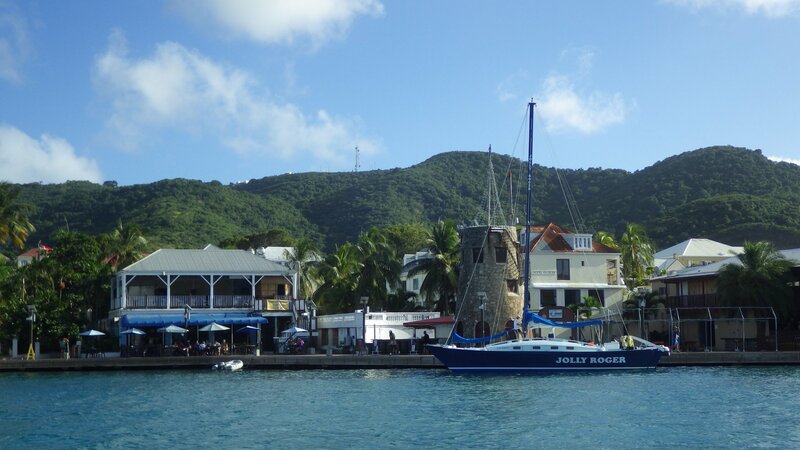 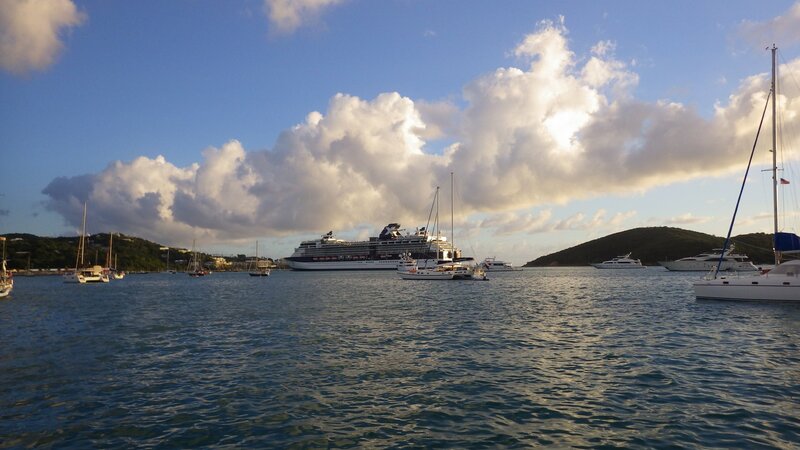 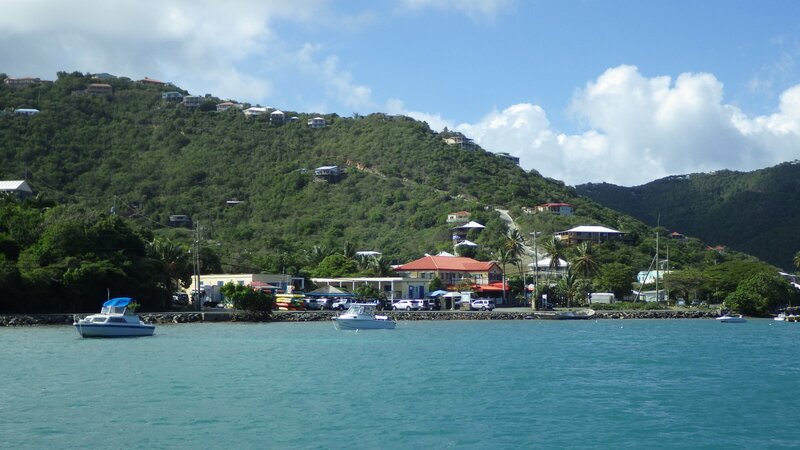 This is a popular stop for boats traveling between St Thomas and St. John islands, with traffic passing nearby � charter boats, ferries, excursions. 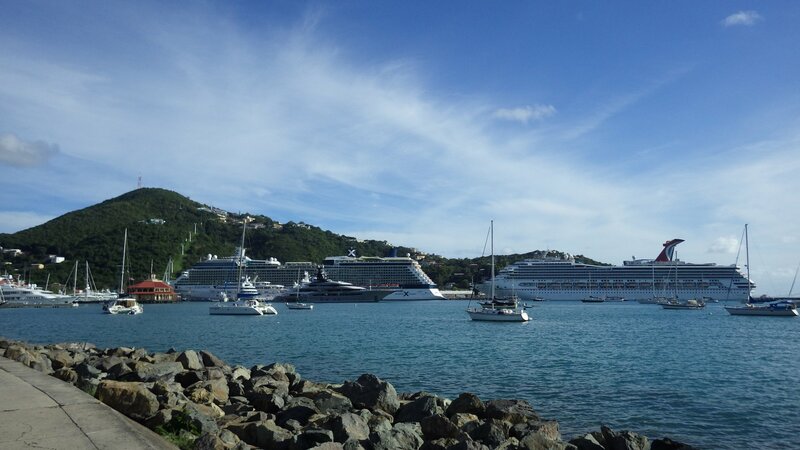 Fairly busy. 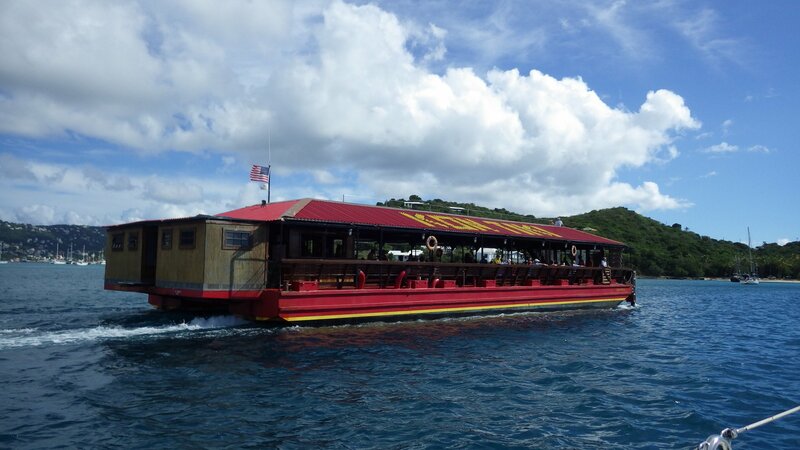 There is a floating pizza boat in the cove, but we didn't try it. 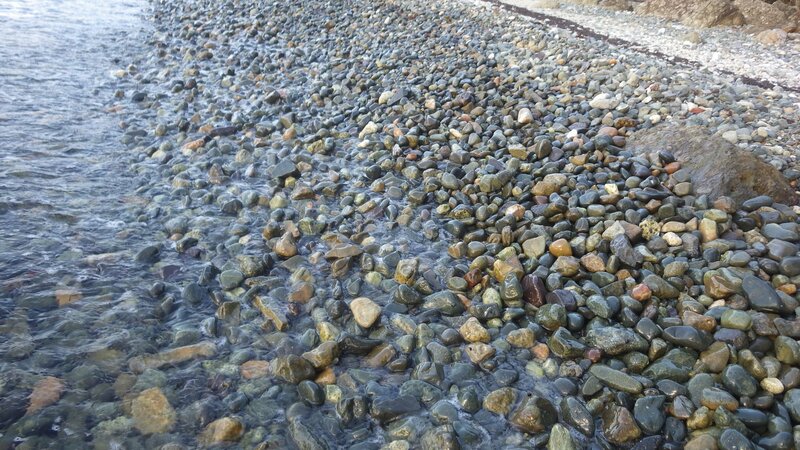 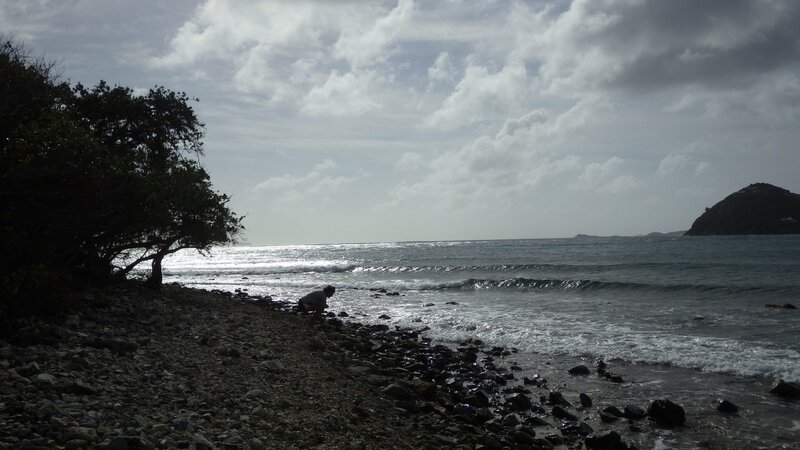 Walked on a small pebble beach, swim, worked on some boat projects. 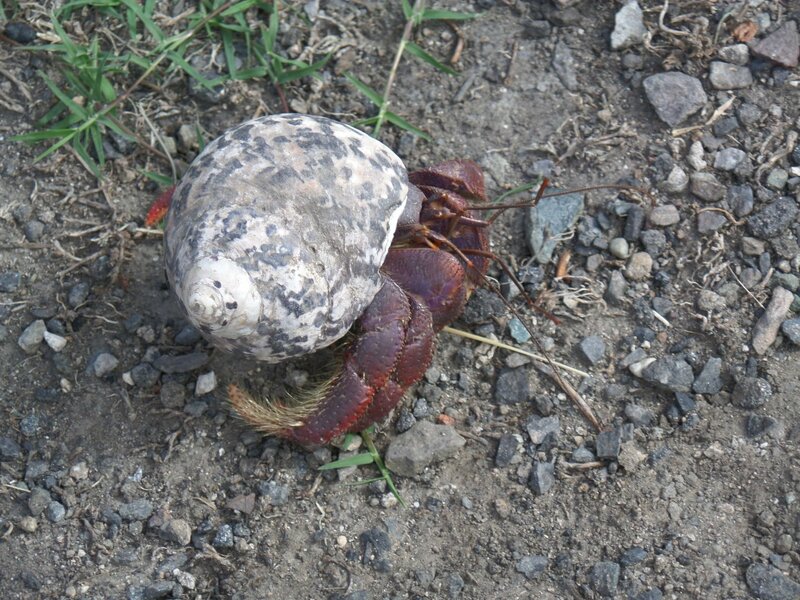 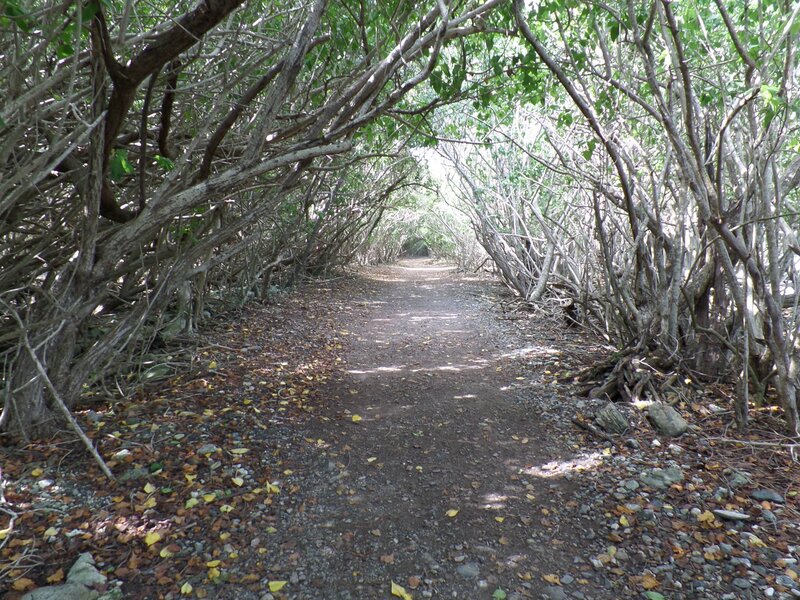 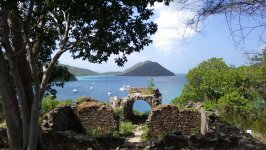 When visiting St. John Island, I decided to explore its South shore instead of more popular North shore. 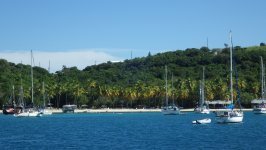 Among other reasons, we wanted to be ready to sail off South to St. Croix Island as soon as a suitable weather window arrives. 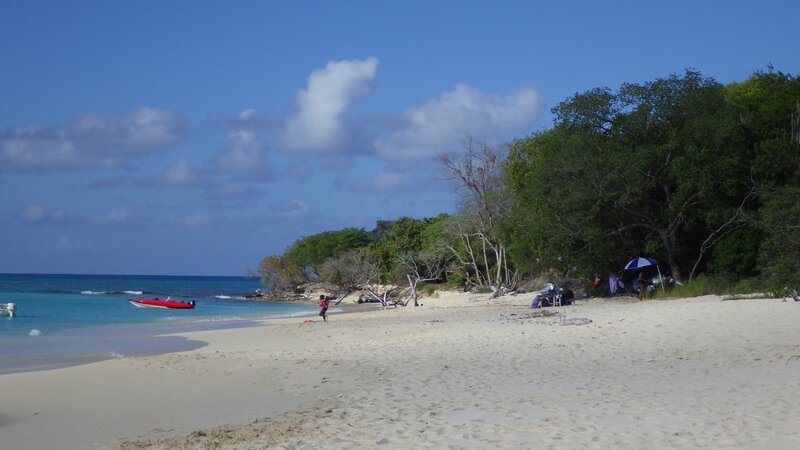 St. John's Rendezvous Bay is an off-the-beaten track place on the South coast of St. John. 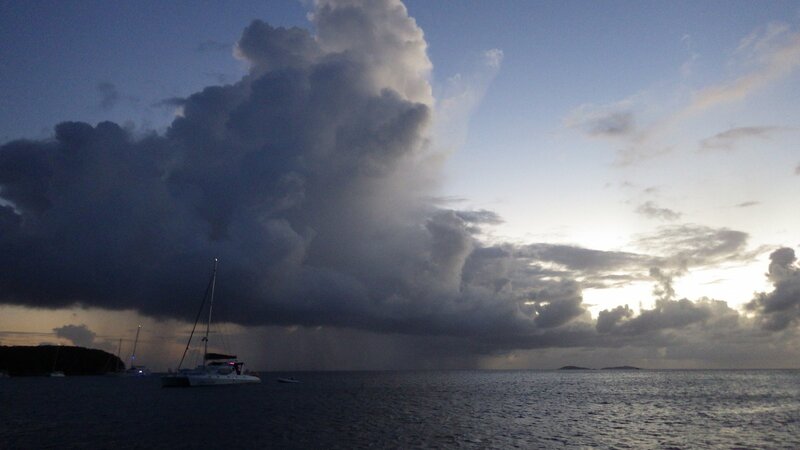 It was suitable to ride out strong easterly winds and squalls we had during that time. It is a fairly quiet place. 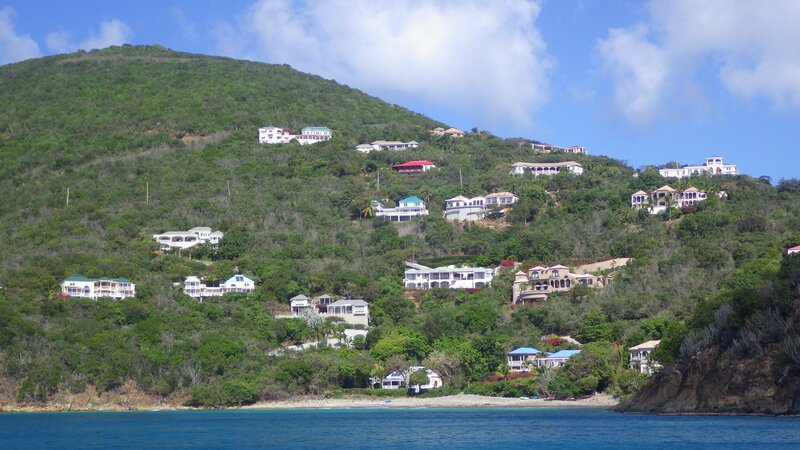 There are few small beaches and nice houses on the hills overlooking the bay. 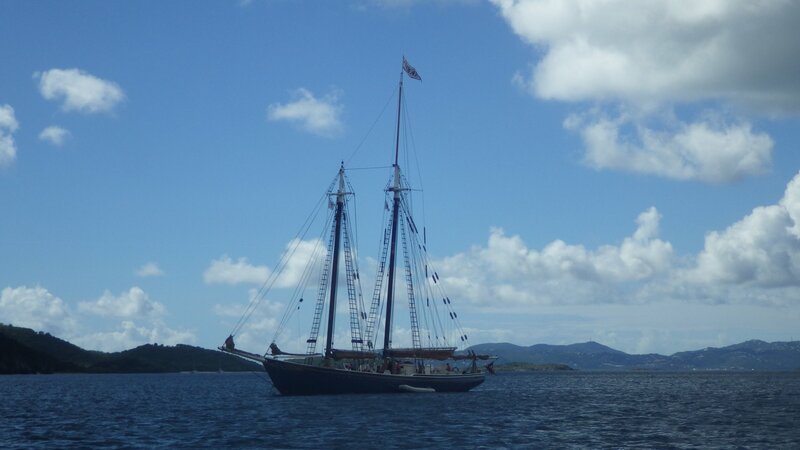 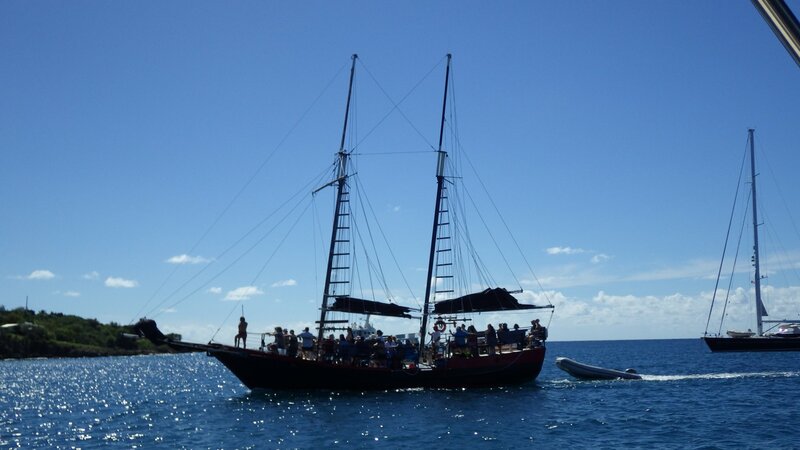 We shared the bay with few other boats, including a beautiful tallship. 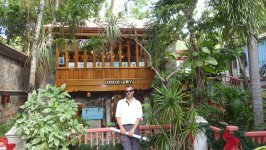 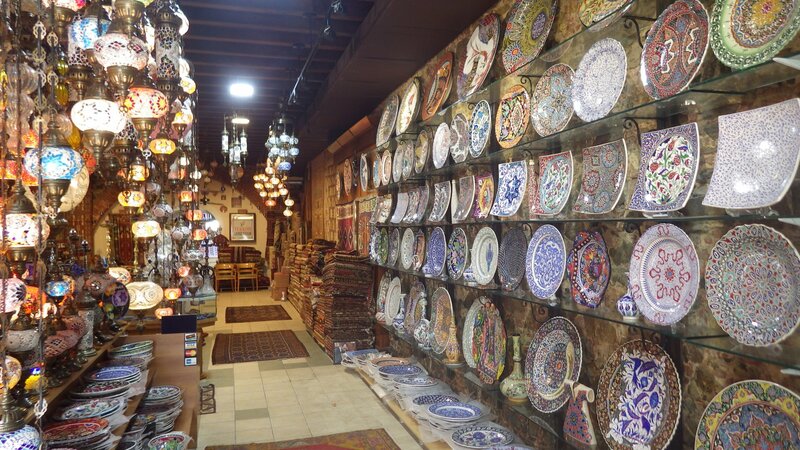 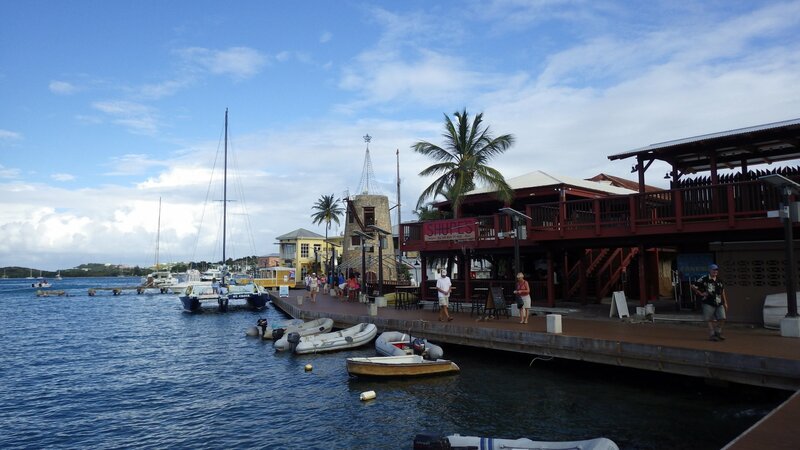 It is an "eclectic" place � a mix of locals, expats, tourists and liveaboards. 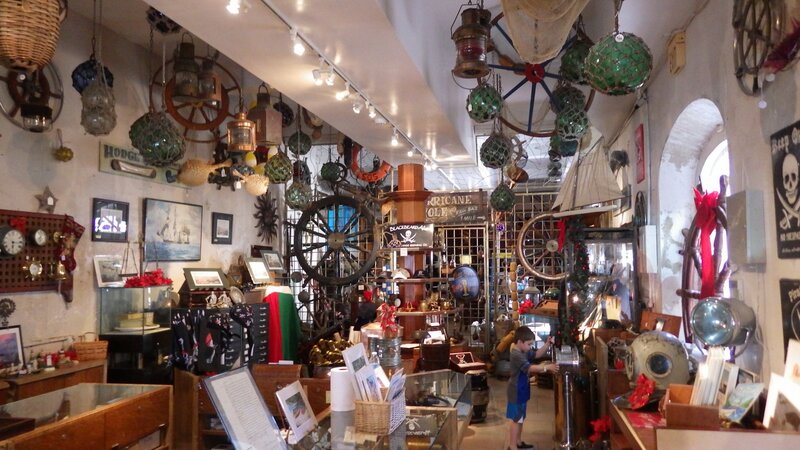 Not much in terms of services, but I guess that is the charm of this place, which seems to be stuck in time. 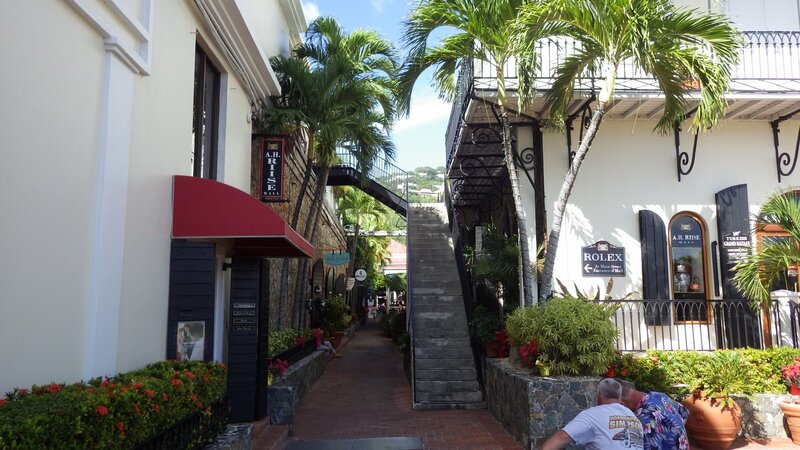 There are several restaurants and basic (expensive) stores. 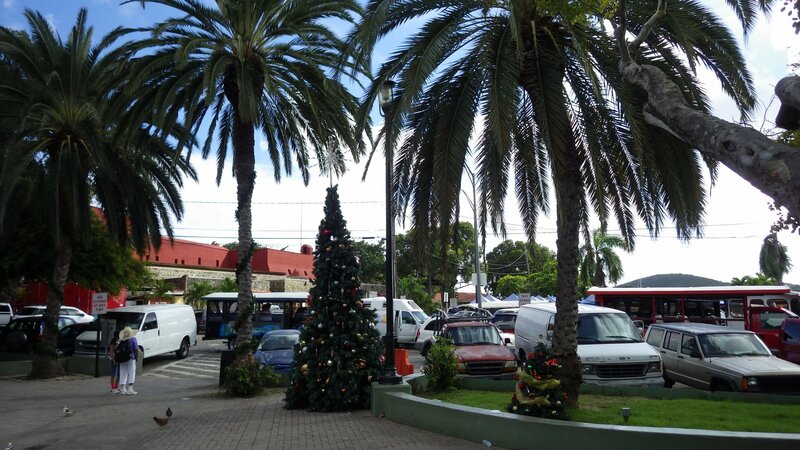 Many day tourists in rental Jeeps are passing by. 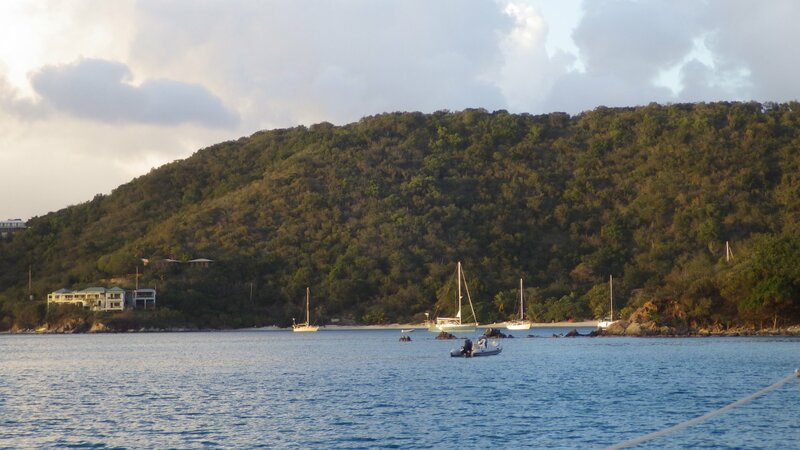 The anchorage is quite crowded � it was fairly difficult to find a spot to drop the hook. 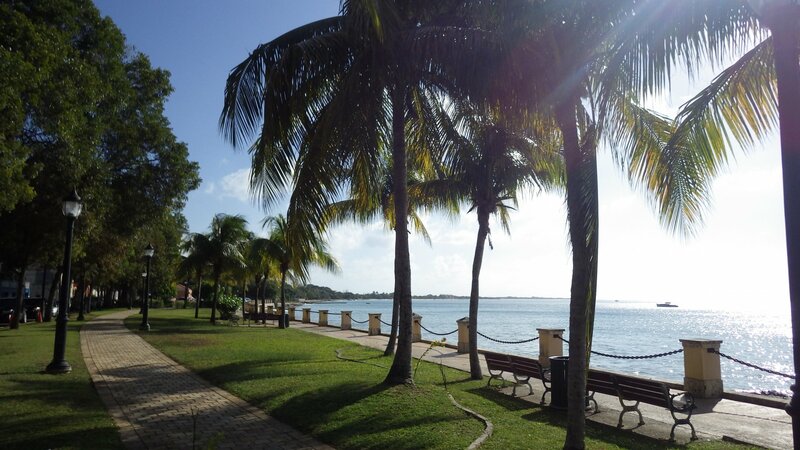 And we had a good Christmas Holidays here - humble, quiet, without snow, just two of us. 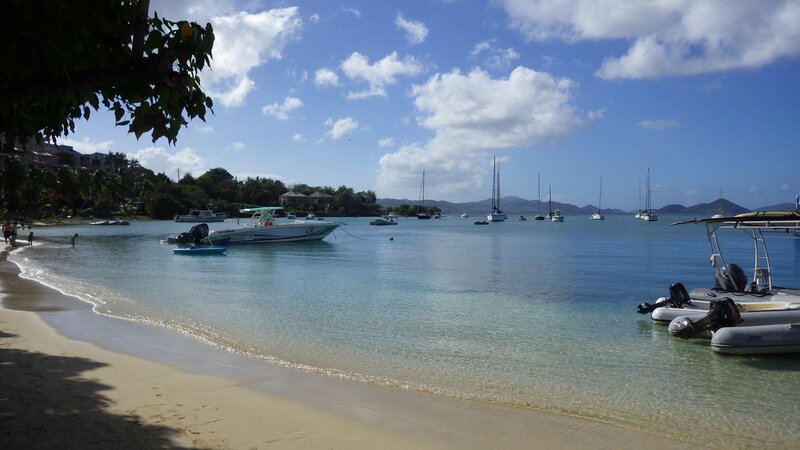 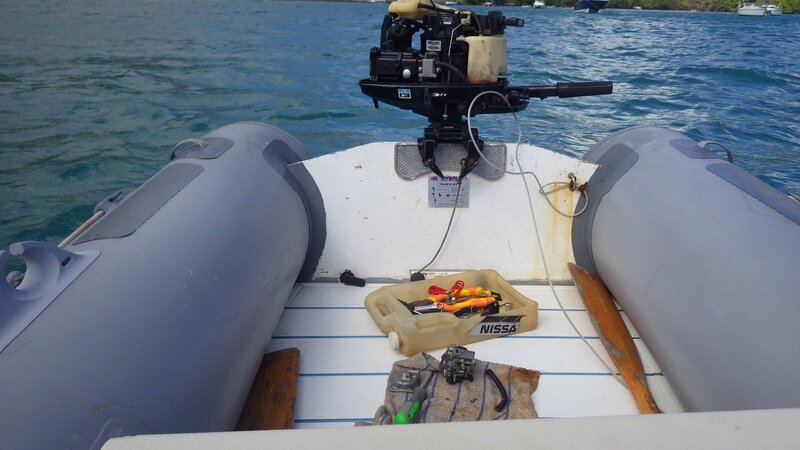 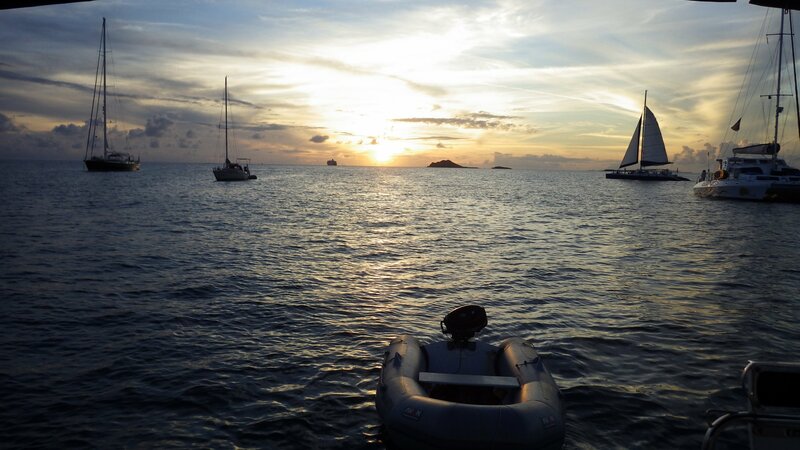 Still having problems with the dinghy's outboard engine � repairs, repairs... 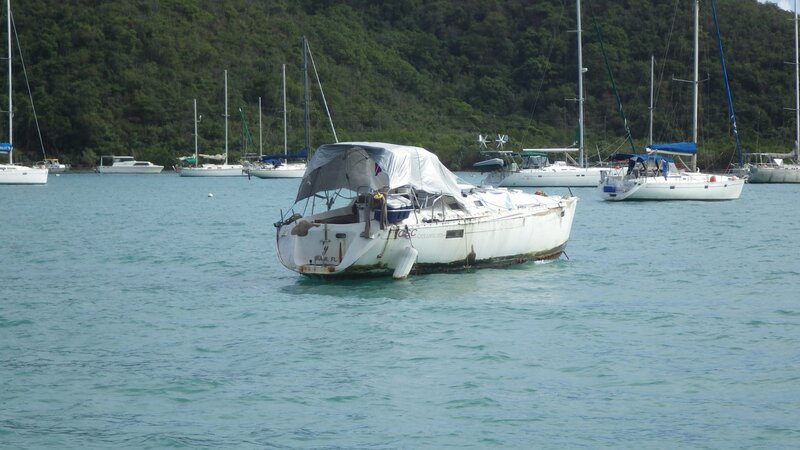 I am becoming a mechanic, but that is the part of the deal - "cruising is fixing boats in exotic places". 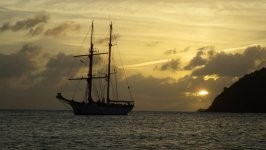 The weather remains quite windy to sail out comfortably - they call it "Christmas Winds" - so we are staying in the area for some short term. 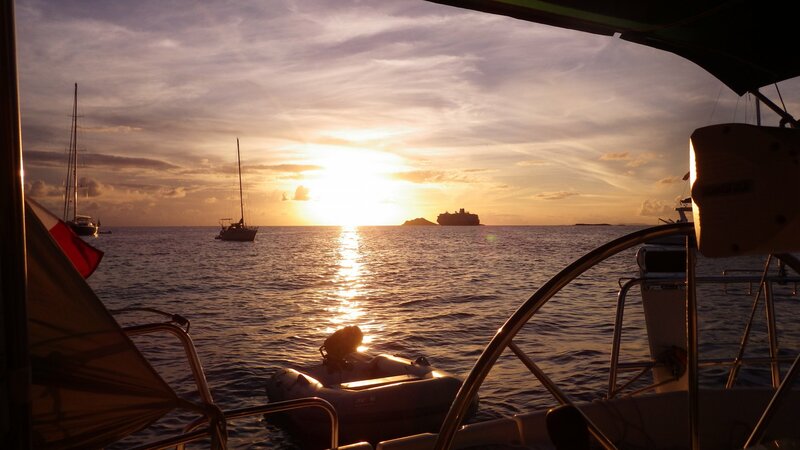 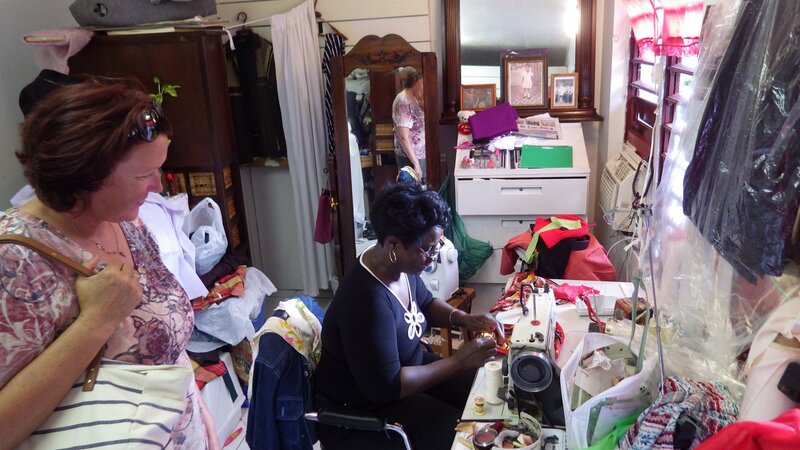 And we are not complaining � it is a slow cruise after all. 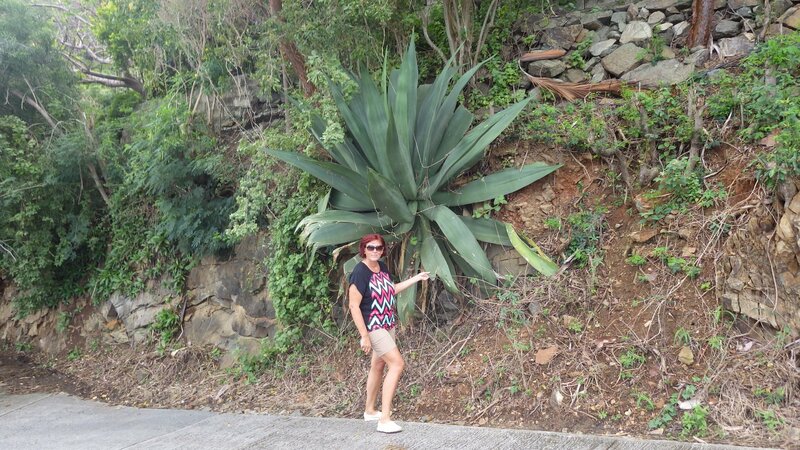 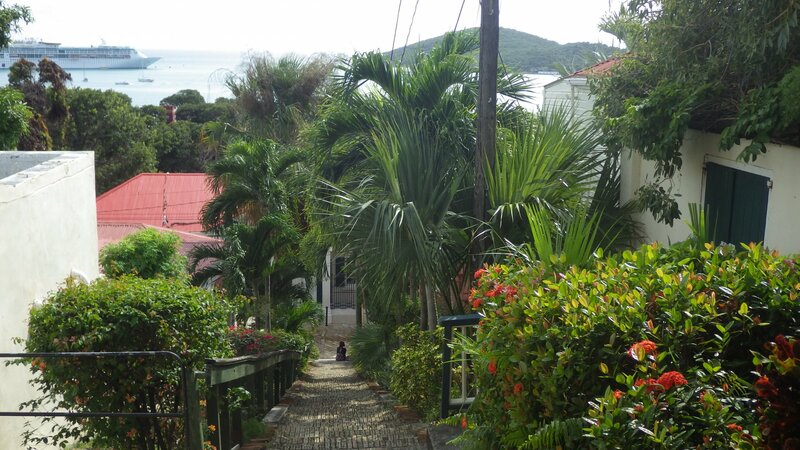 We hiked the steep mountain streets, looked at the interesting homes and enjoyed great views of the bay. 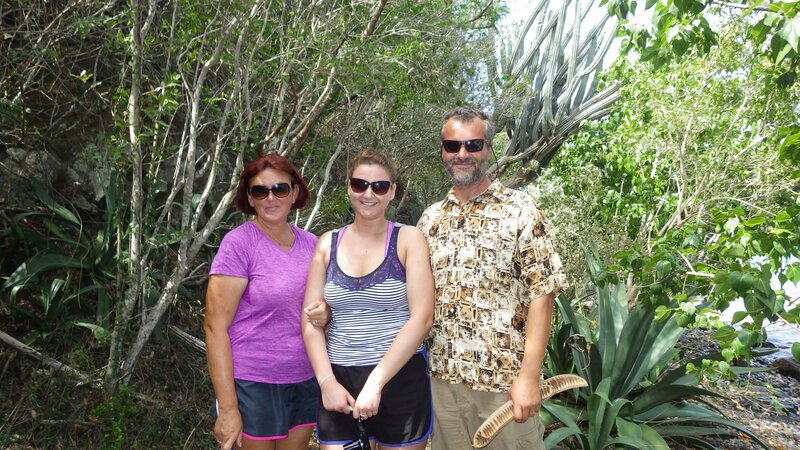 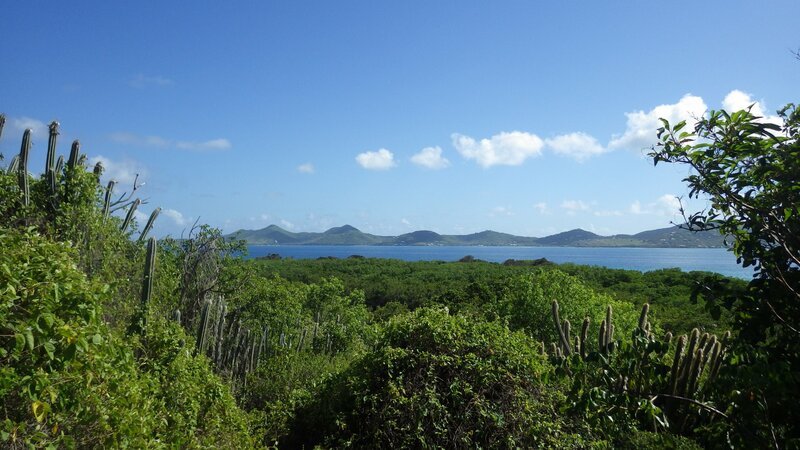 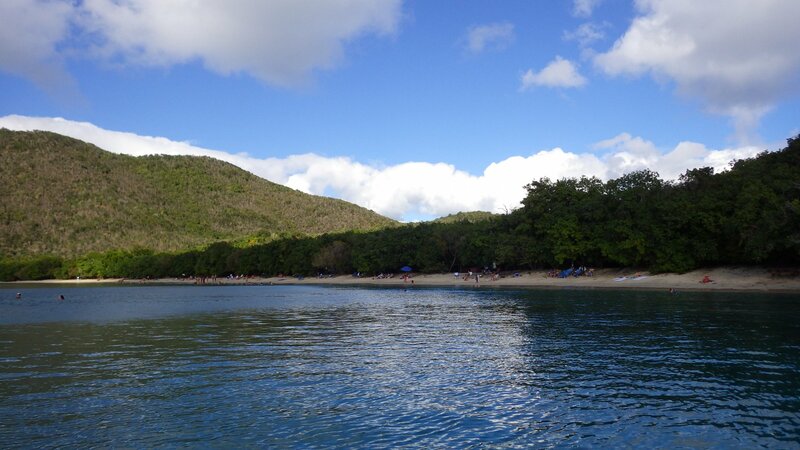 We had a day trip to Cruz Bay on the western side of St. John island. 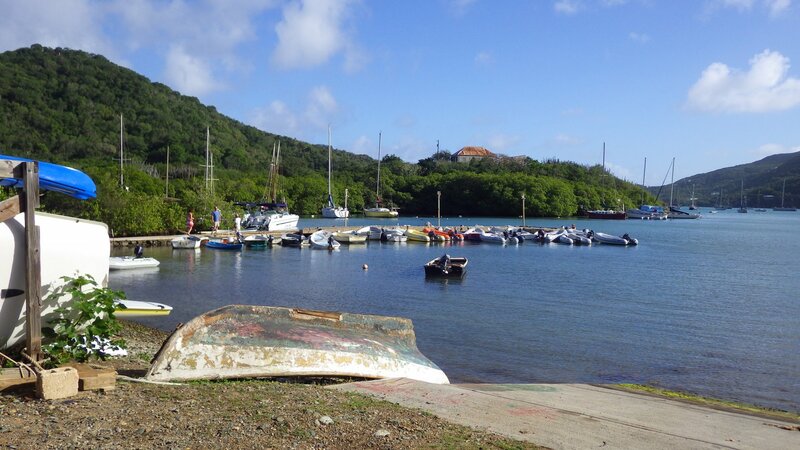 Visiting the place by boat would be difficult � the bay is small and filled with local moorings. 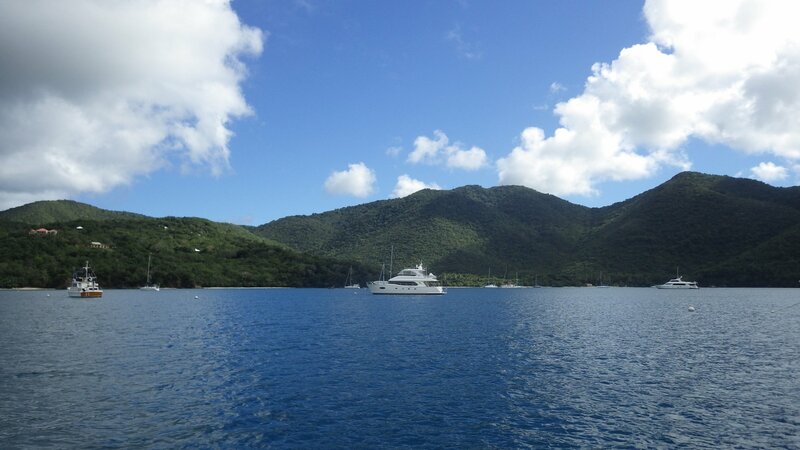 We would have to anchor couple miles away and dinghy to visit the town - not a feasible option with our tender. 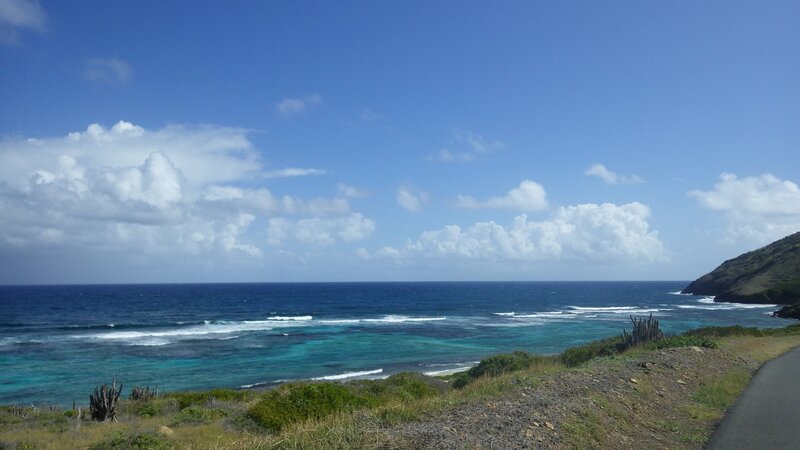 So a road trip from Coral Bay while waiting for the weather was a good opportunity, especially when the decent local bus service across the island costs USD $1 per person. 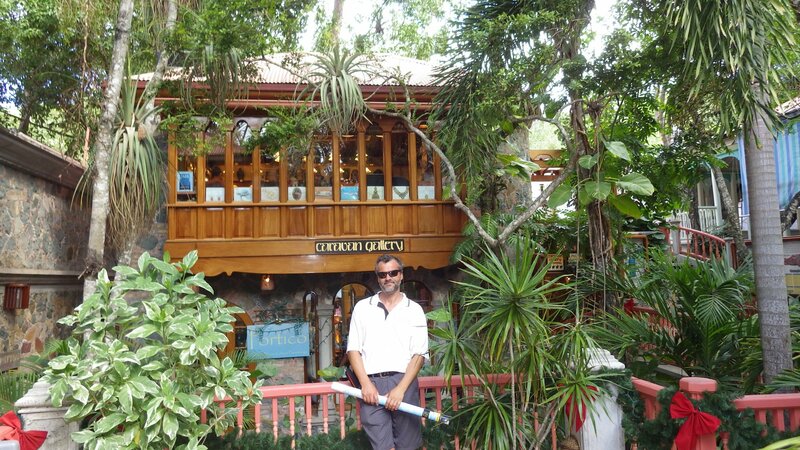 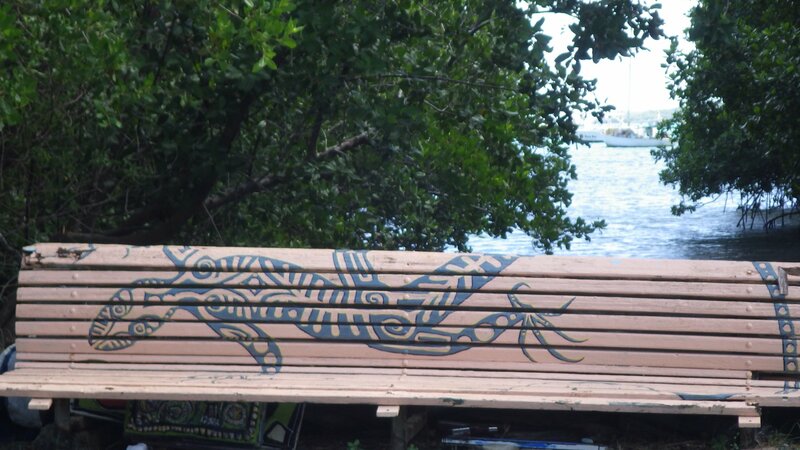 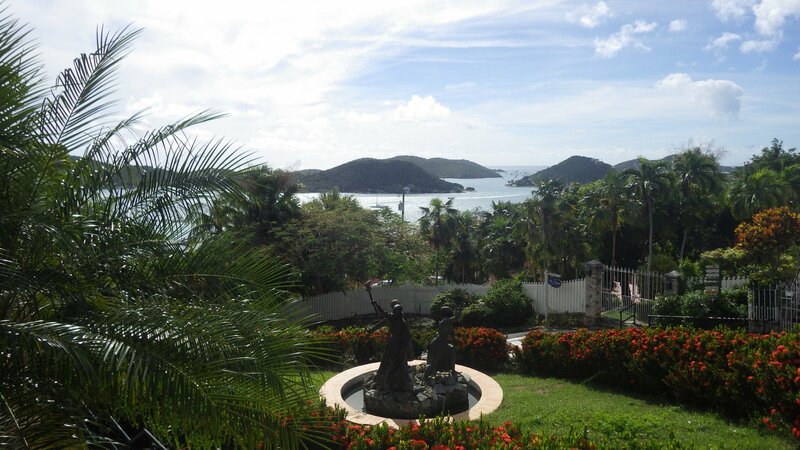 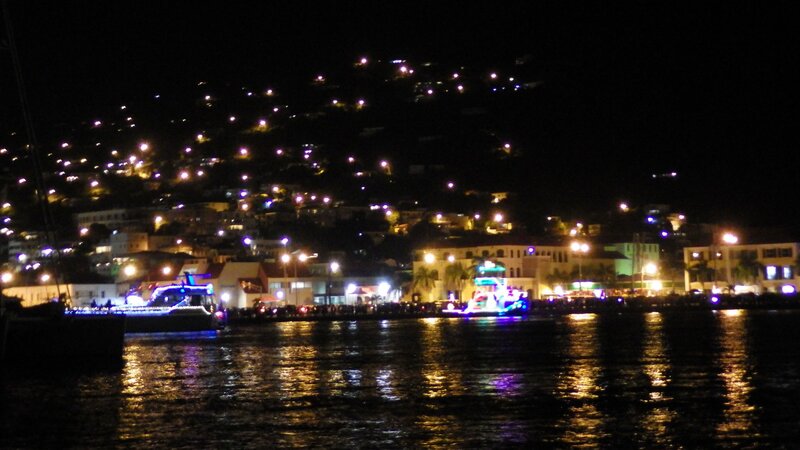 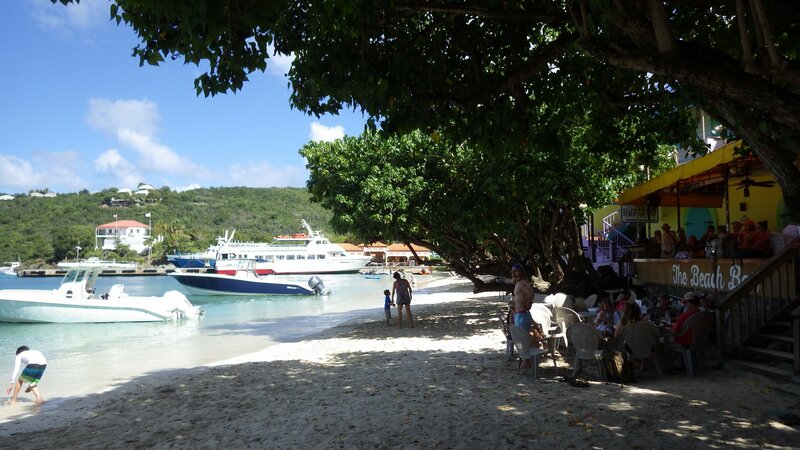 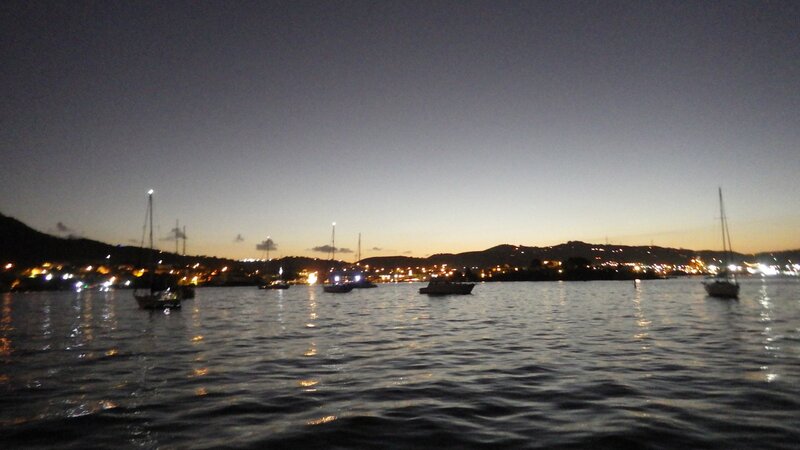 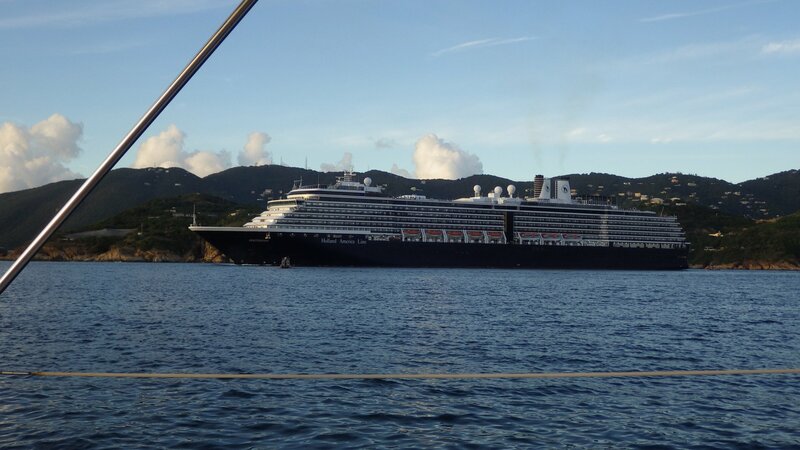 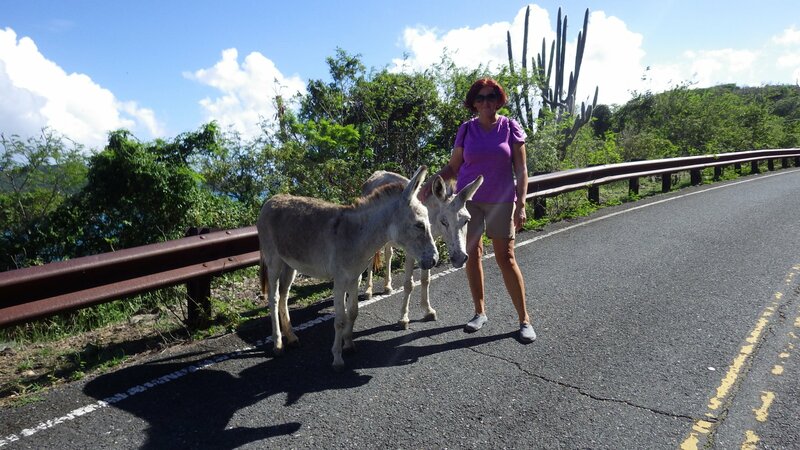 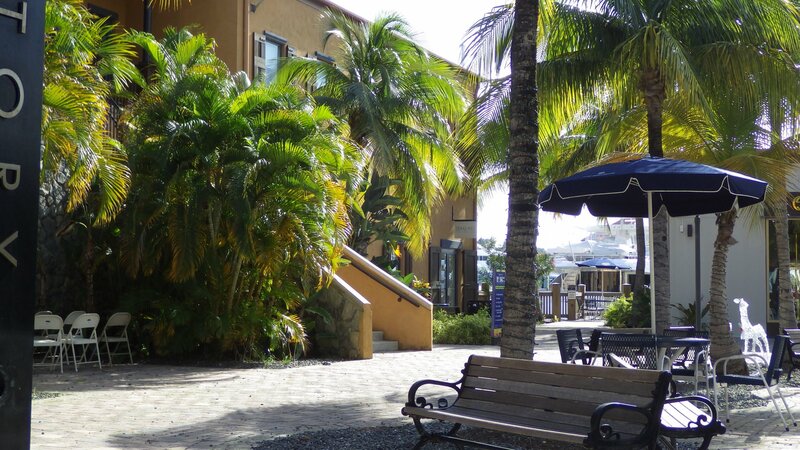 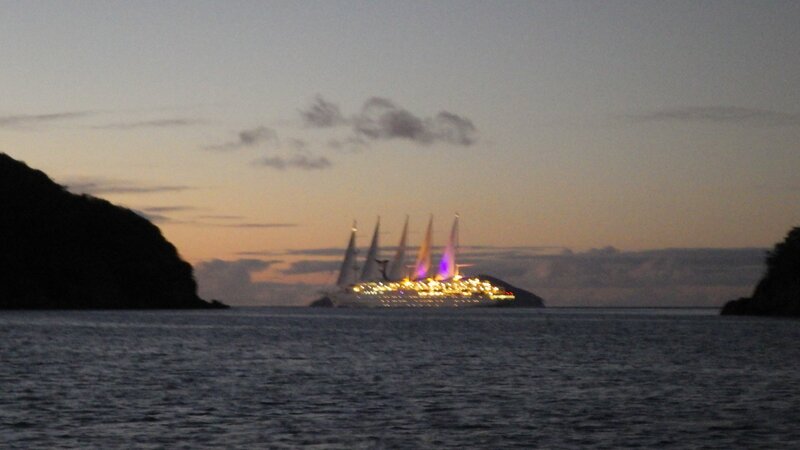 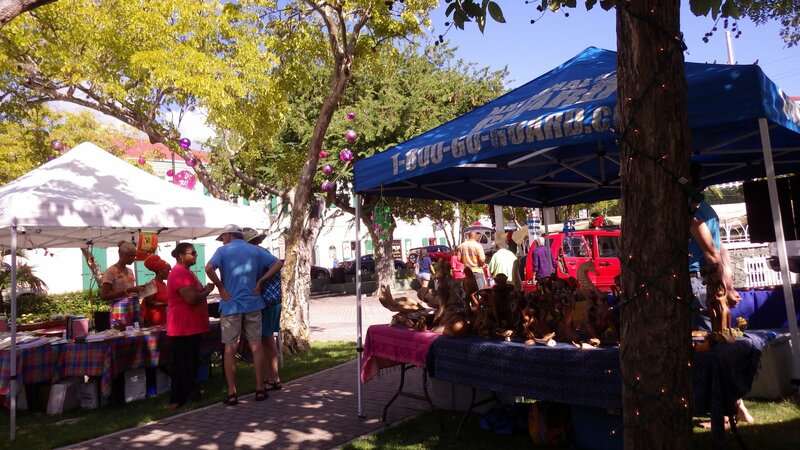 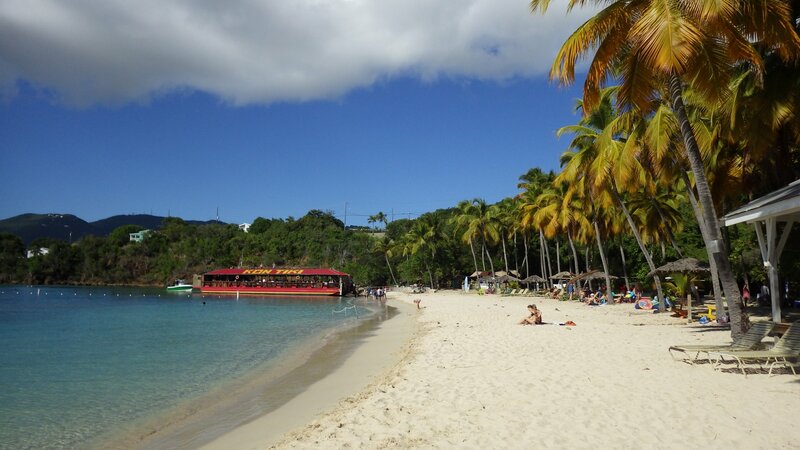 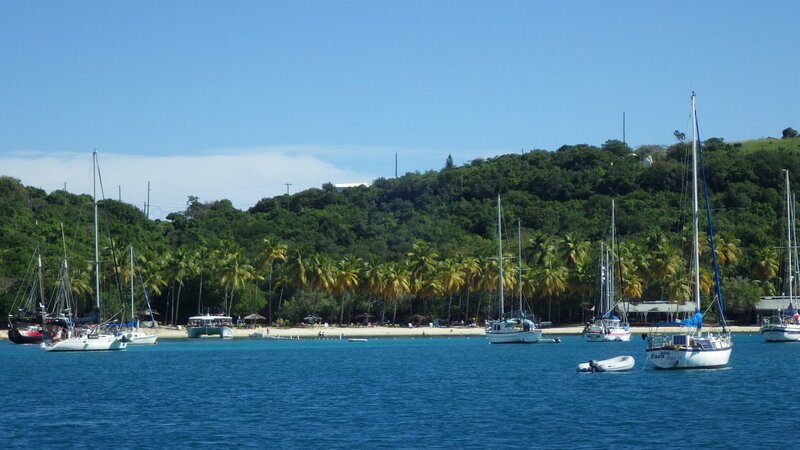 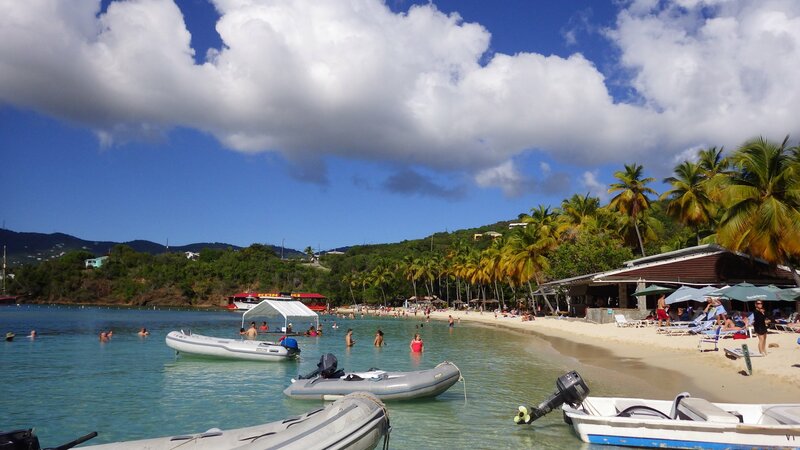 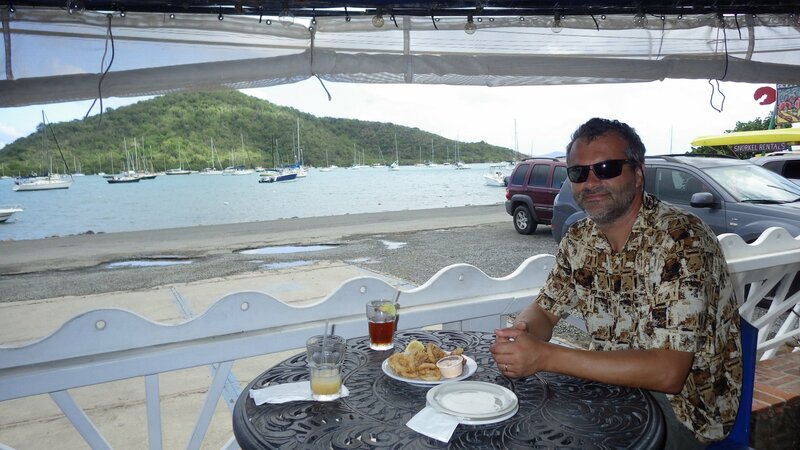 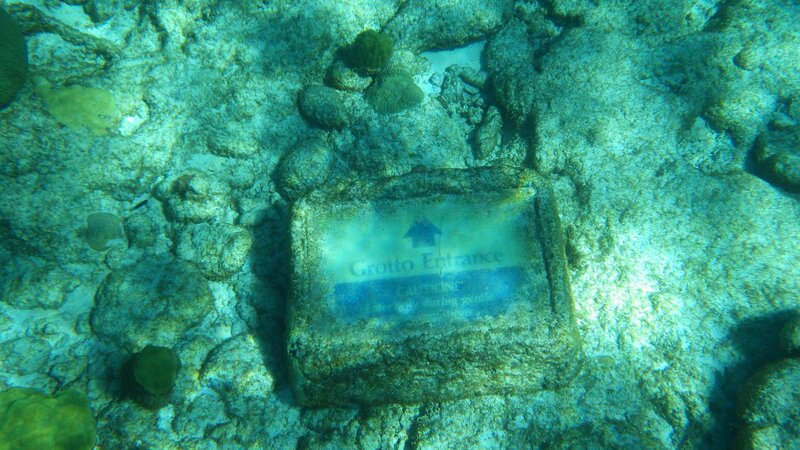 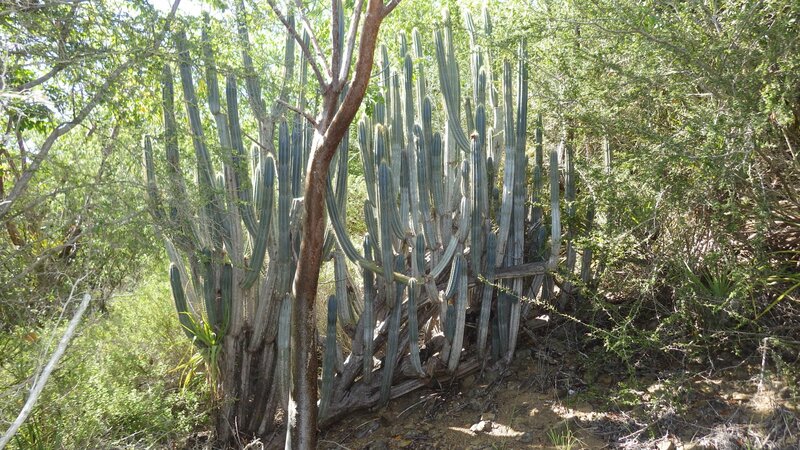 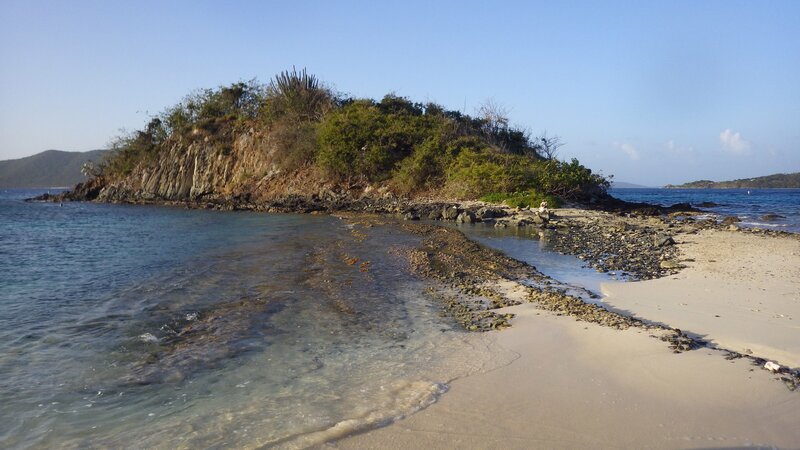 Cruz Bay is US VI� port of entry and another tourist trap. 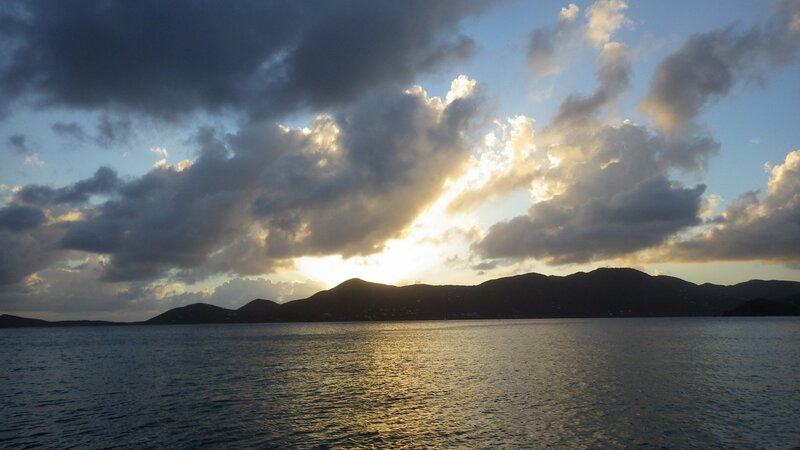 One day was just enough here. 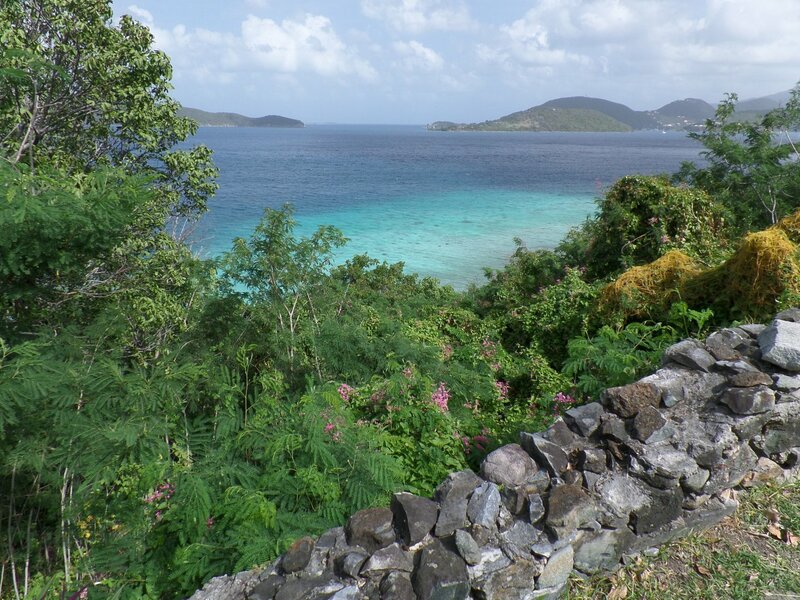 Princess Bay is a part of a larger Coral Bay / Hurricane Hole area of St. John Island, and a National Park. 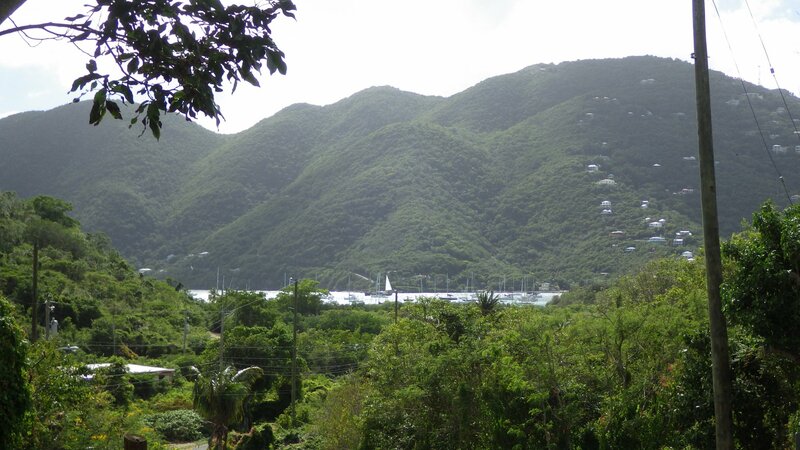 No development here, just lush hills and several mooring balls. 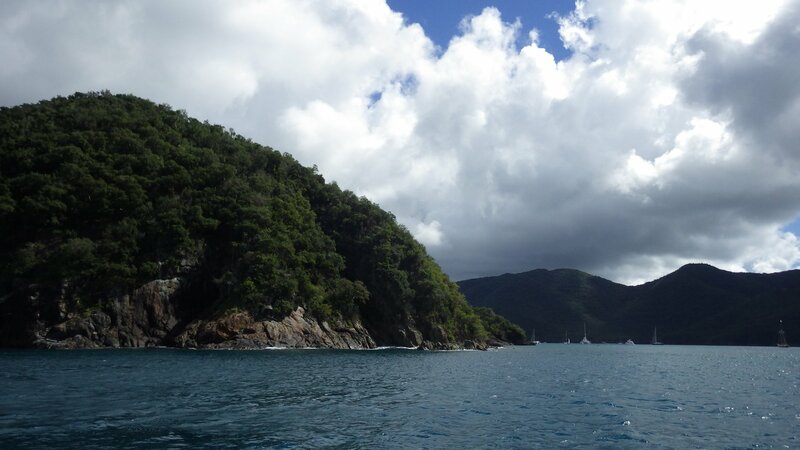 The wind swirls oddly at times coming from and between the hills, occasionally moving boat in unexpected directions. 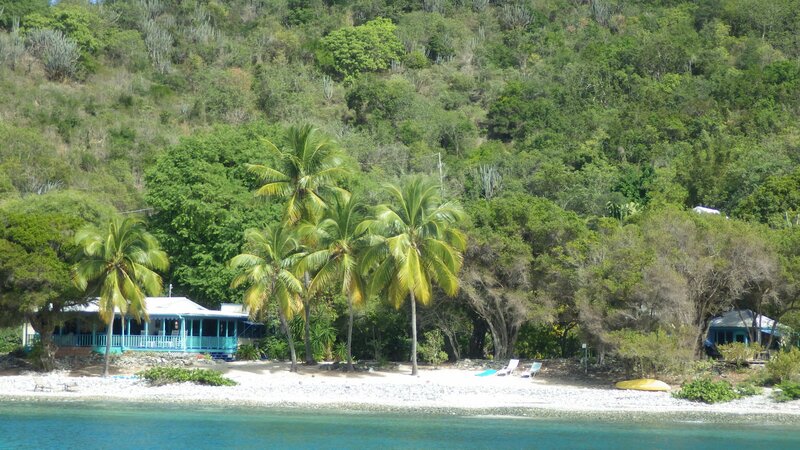 We have spent a New Year Eve here. 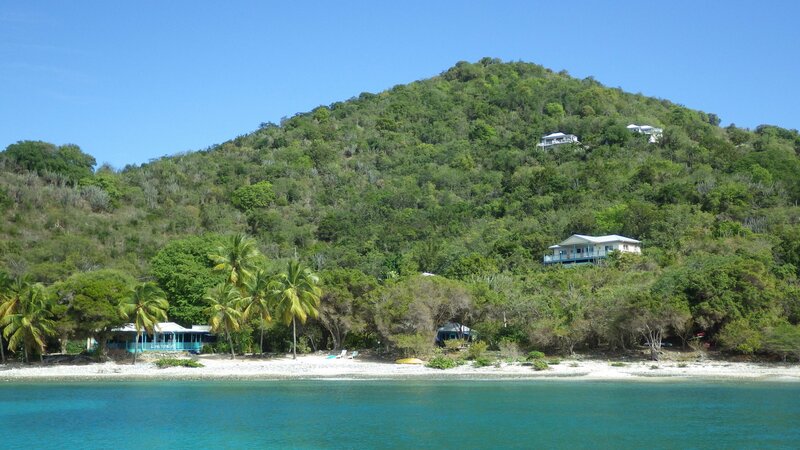 Mostly relaxing, watching movies, playing games, swimming, shelling on a small beach. 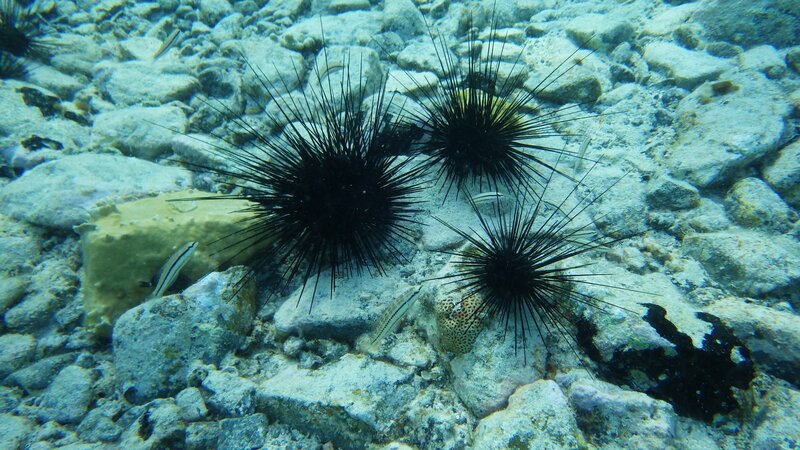 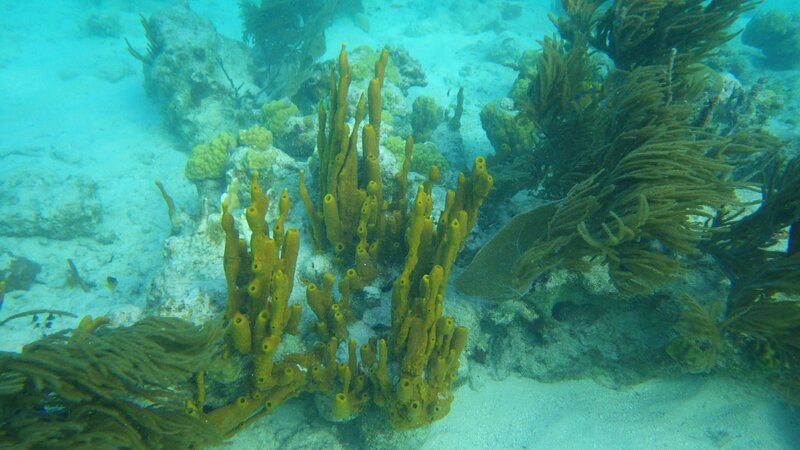 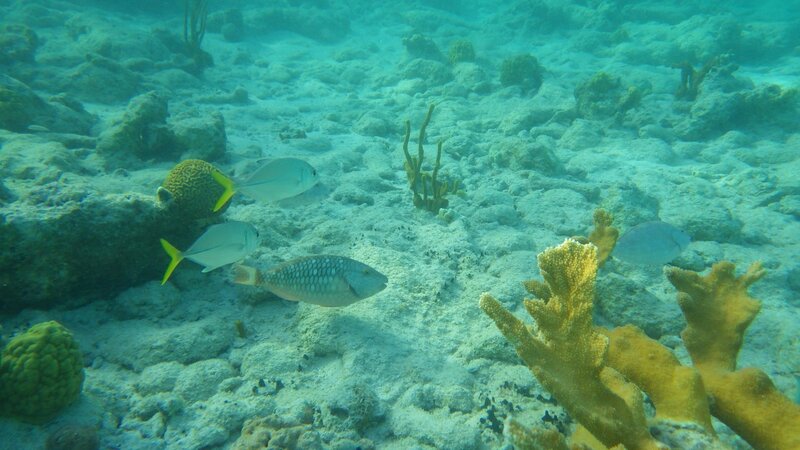 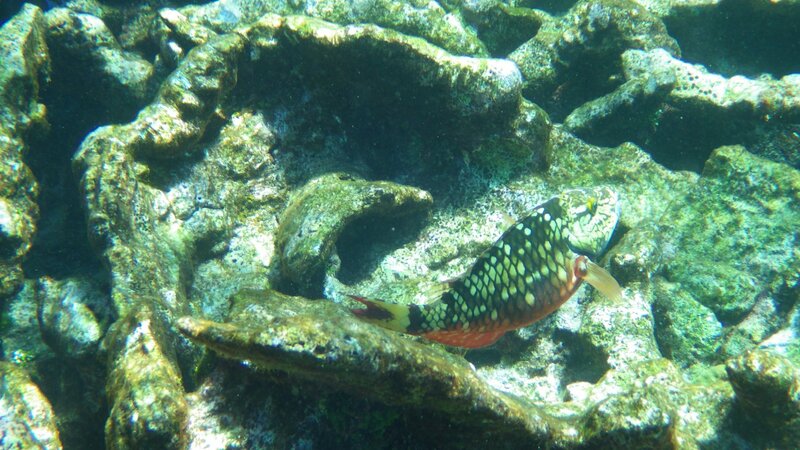 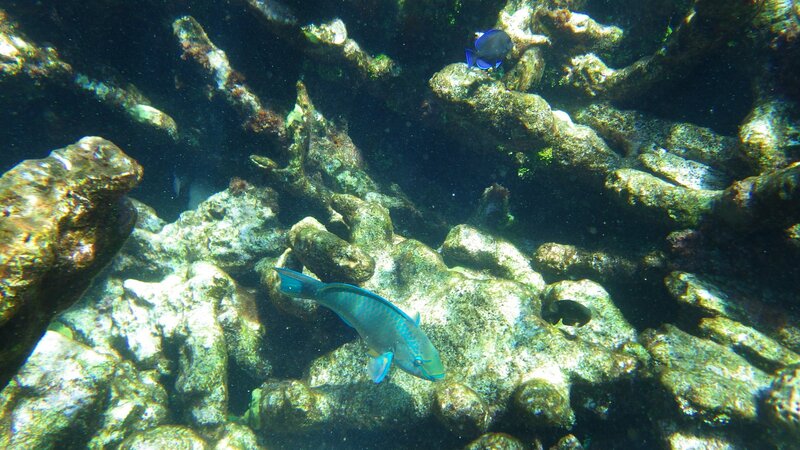 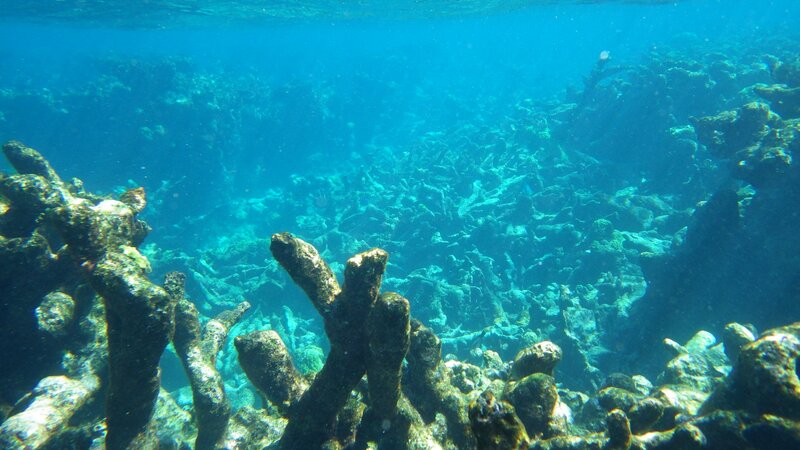 I also snorkeled a little � seen lots of pretty fish, but forgot to take my camera. 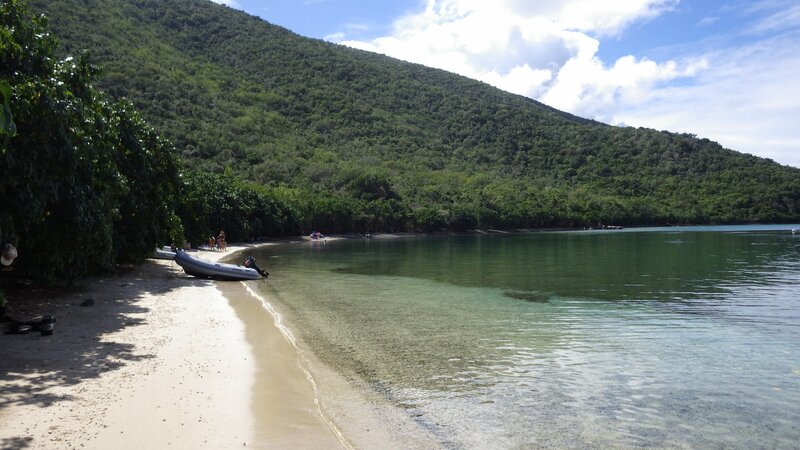 Except for a short visit by a small boat, we had this bay to ourselves. 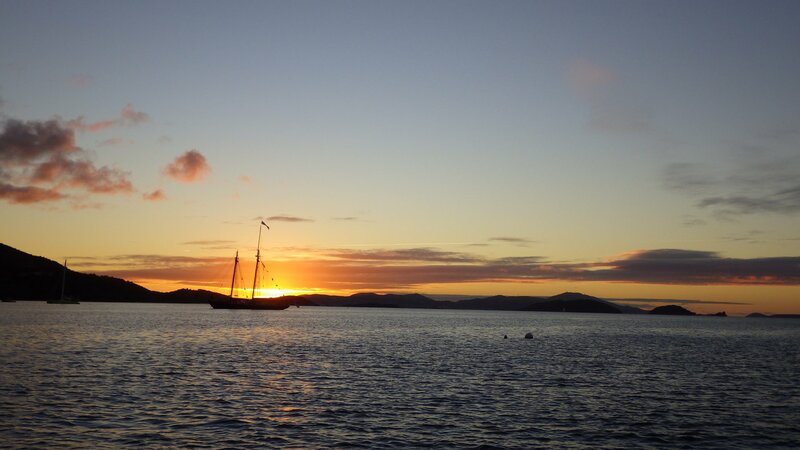 This was just a one night stop staging our early departure to St. Croix Island. 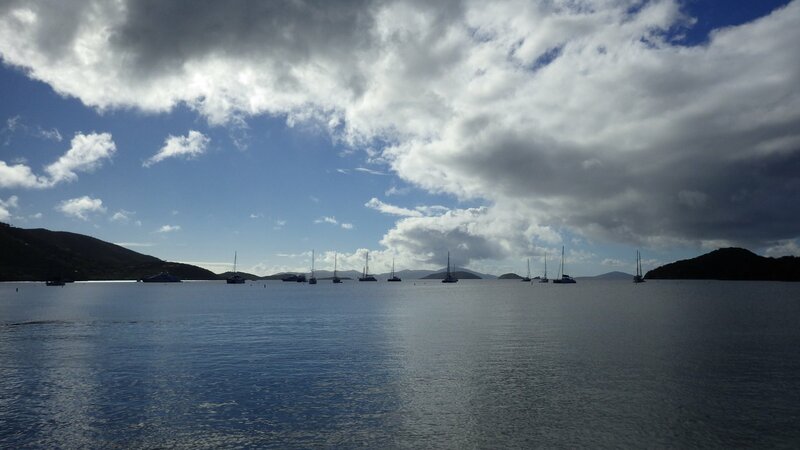 The winds finally started to come down, presenting suitable sailing conditions for the day long passage. 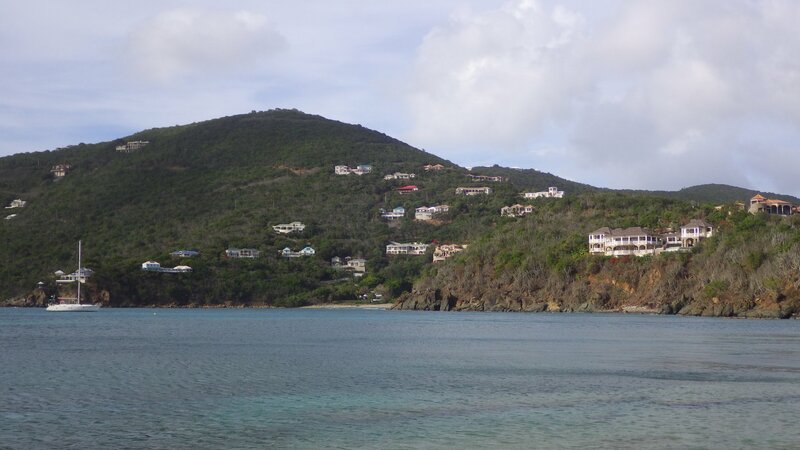 This small bay has pretty cottages at the shore and on the hills, few people on the beach. 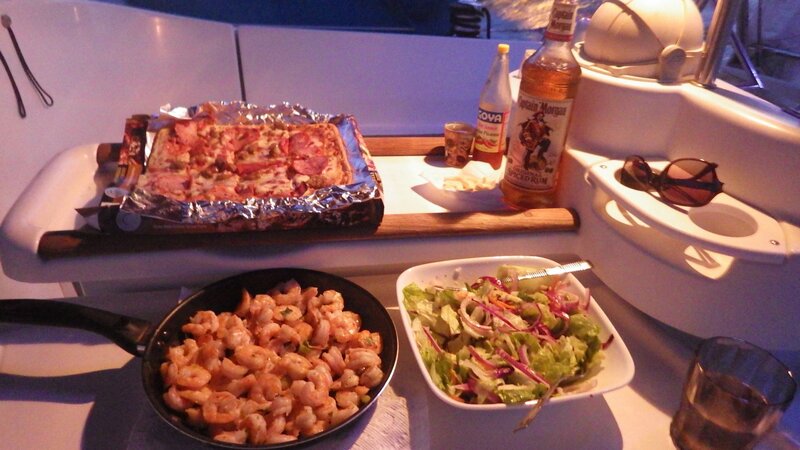 Larysa have caught 2 fish, so we had a nice seafood dinner. 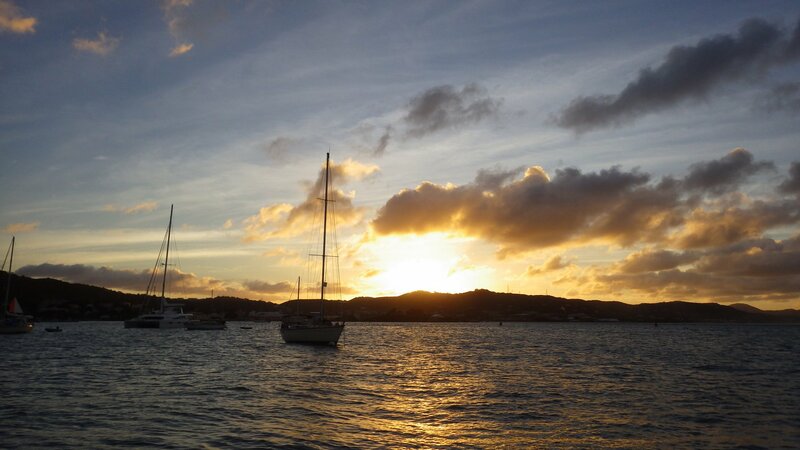 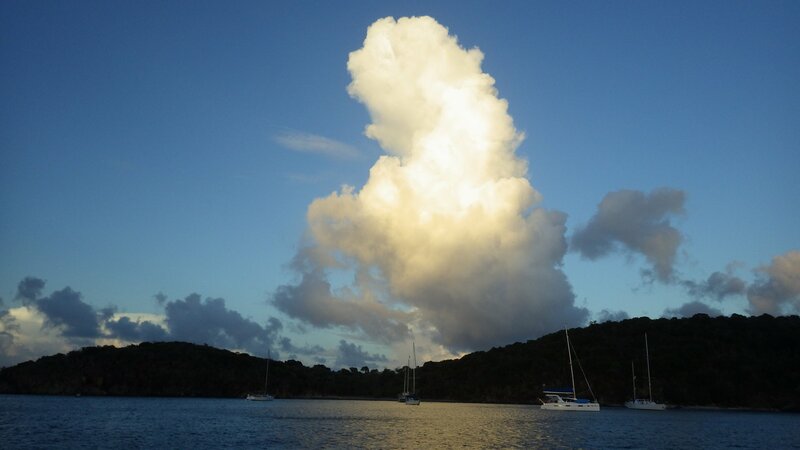 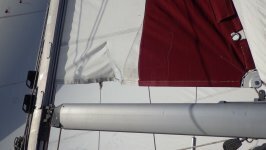 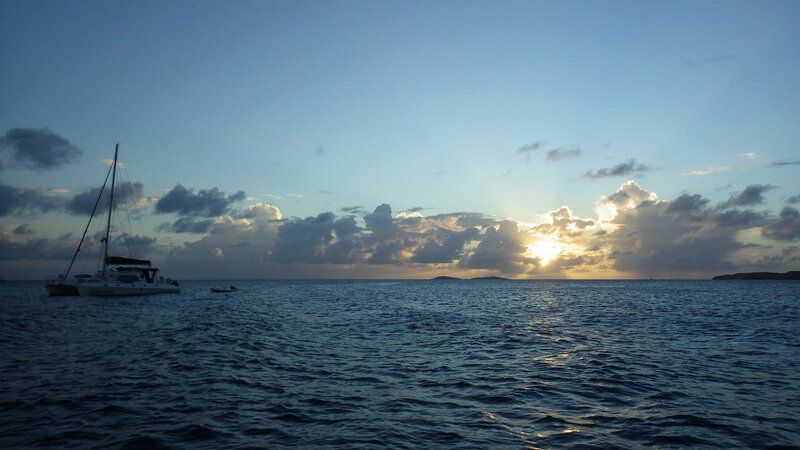 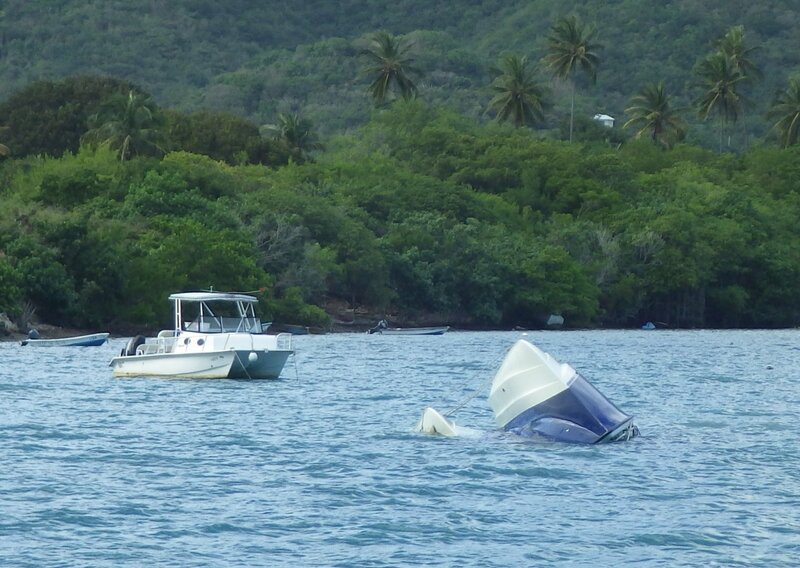 We had a brisk beam reach sailing from St. John to St. Croix, in winds 17-25 knots and seas 5-8 ft.
At the start, my old mainsail was torn while I was pulling it out from the in-mast furling. 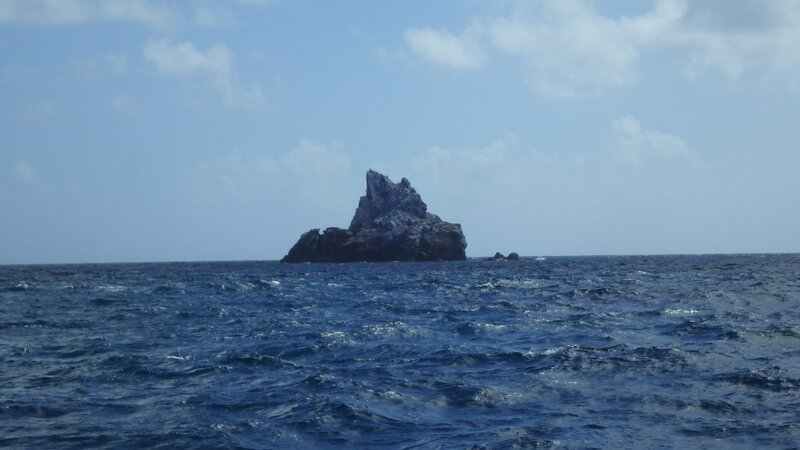 It is the original sail (? 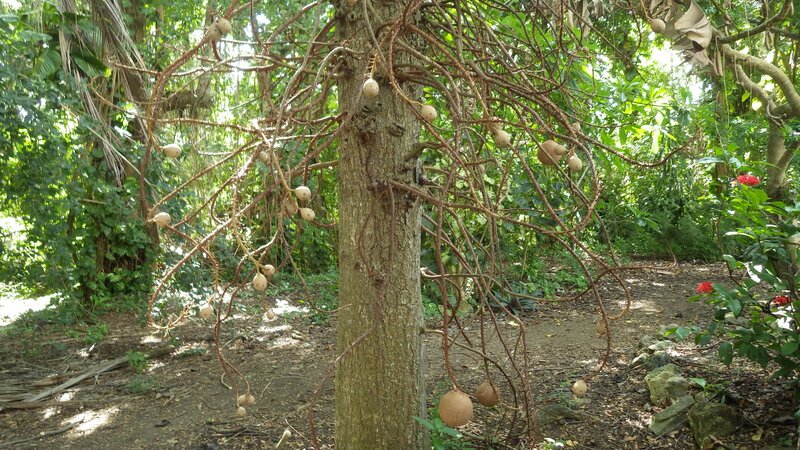 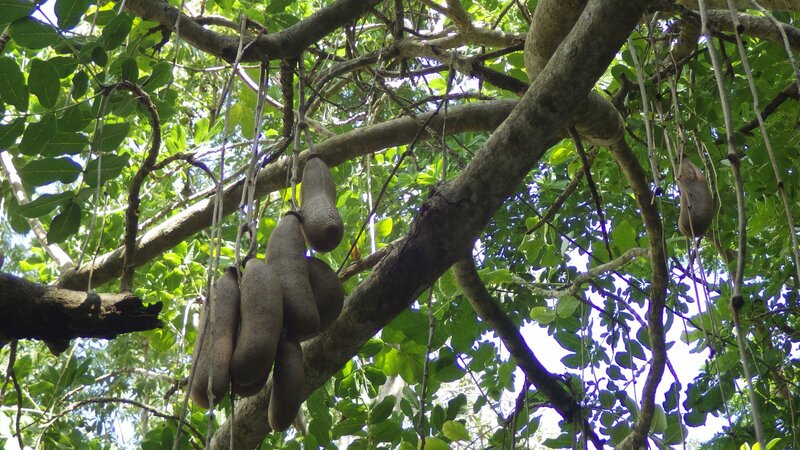 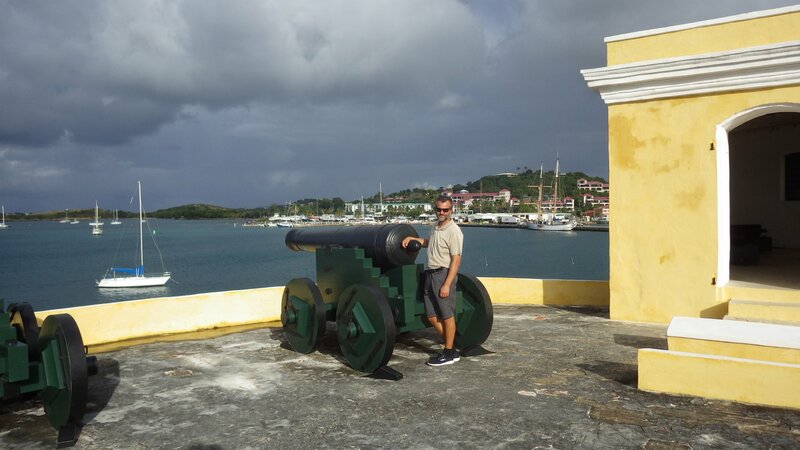 ), more than decade old and was definitely out of shape � i.e., the material in the middle stretched with time so much that it would jam the in-mast furling every time it was used. I was postponing getting new sails as much as possible, but now there is no choice, as reparing it would be a waste. 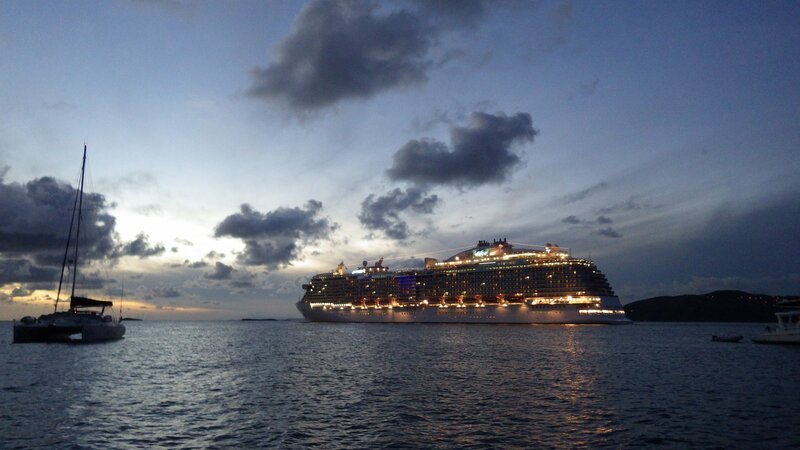 This is going to make a tear in my cruising budget. 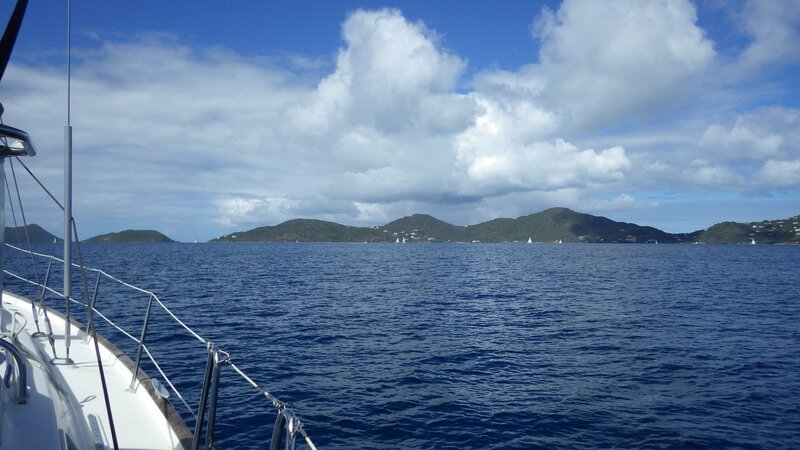 Nevertheless, we have managed to maintain speed up to 7.5 knots on one sail. 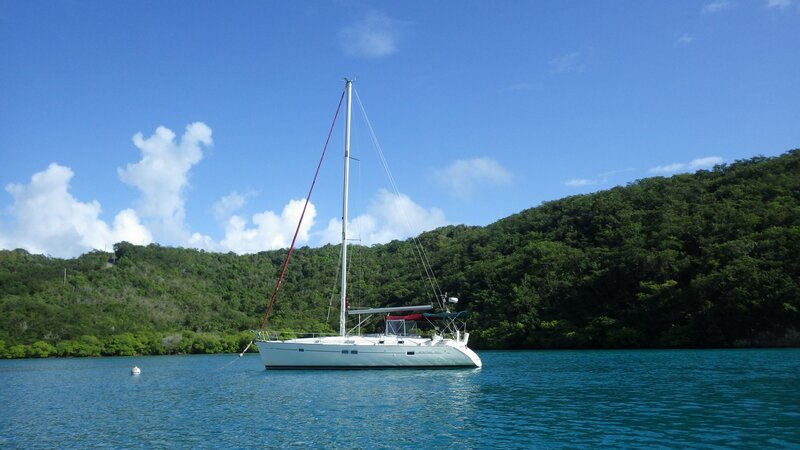 While sailing we have encountered a high-end tender boat floating adrift with no one on board. 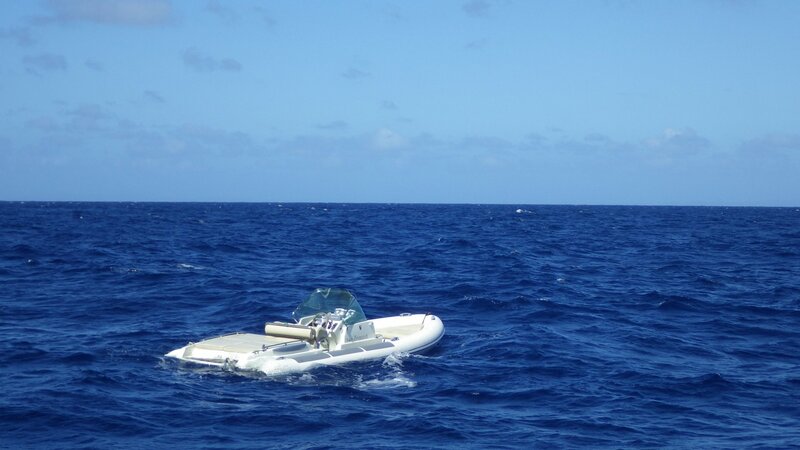 We have reported the sighting to the Coast Guard over the VHF radio. 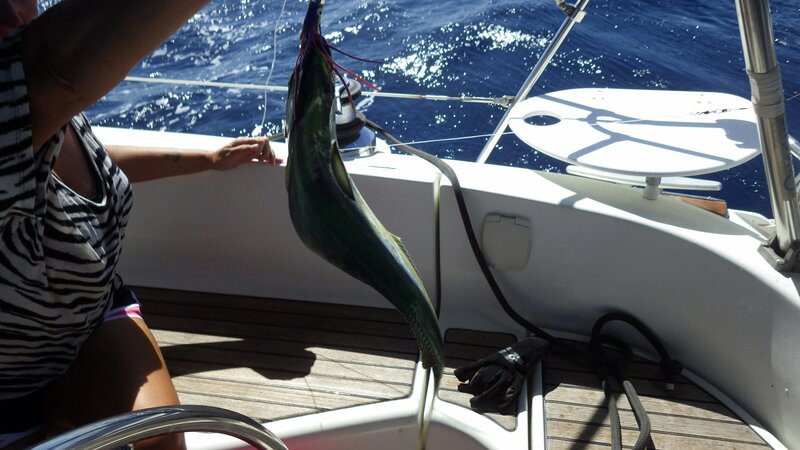 We also caught a beautiful mahi-mahi on this passage. 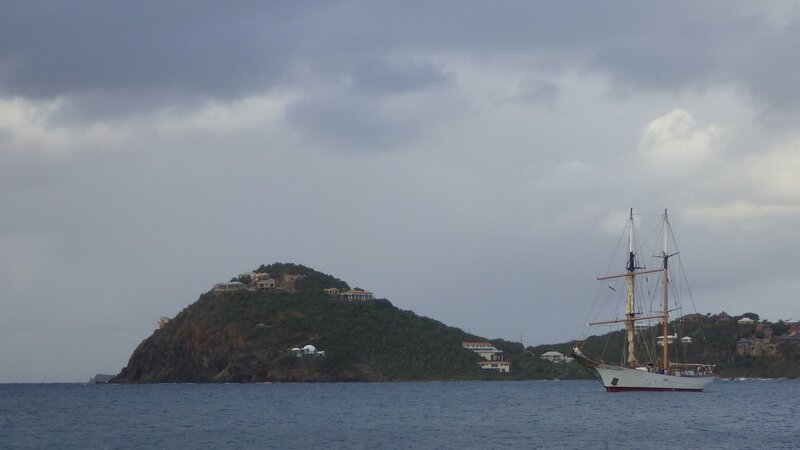 So it was an eventful day sail. 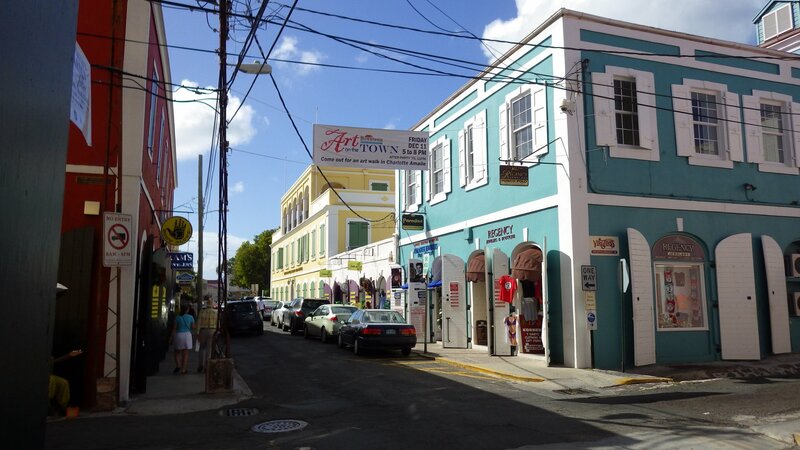 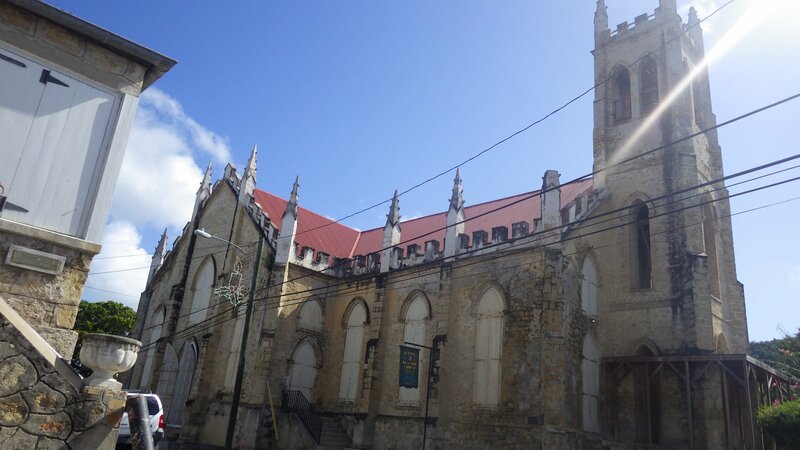 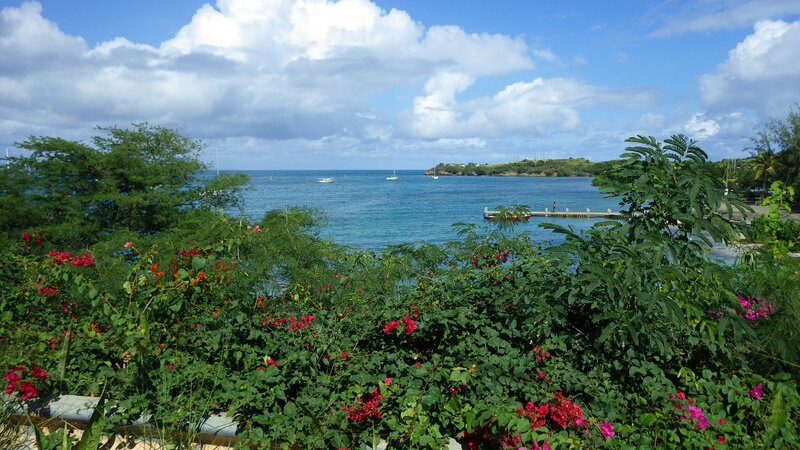 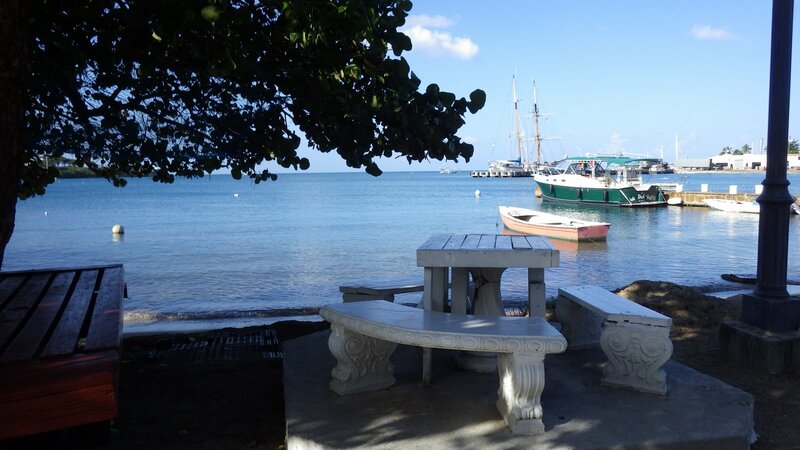 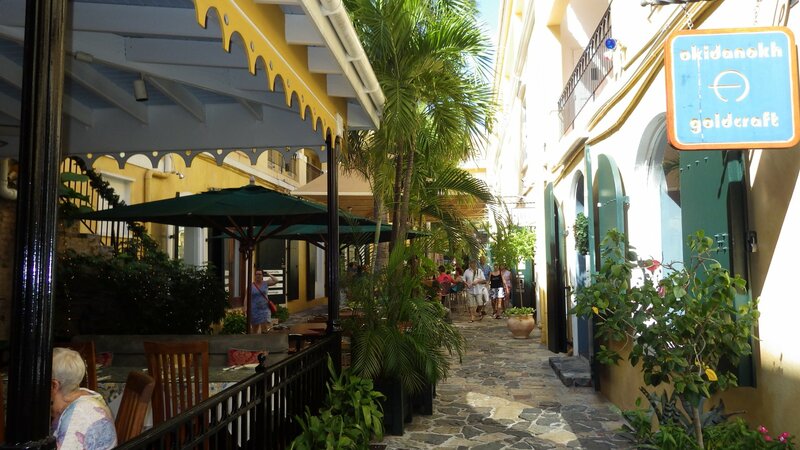 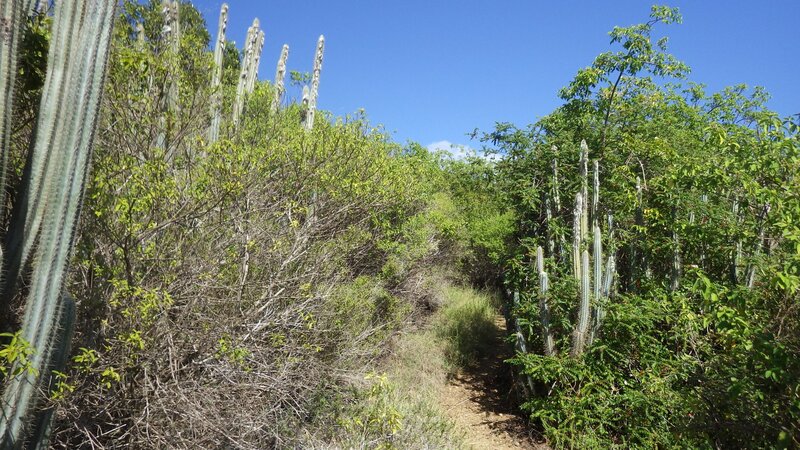 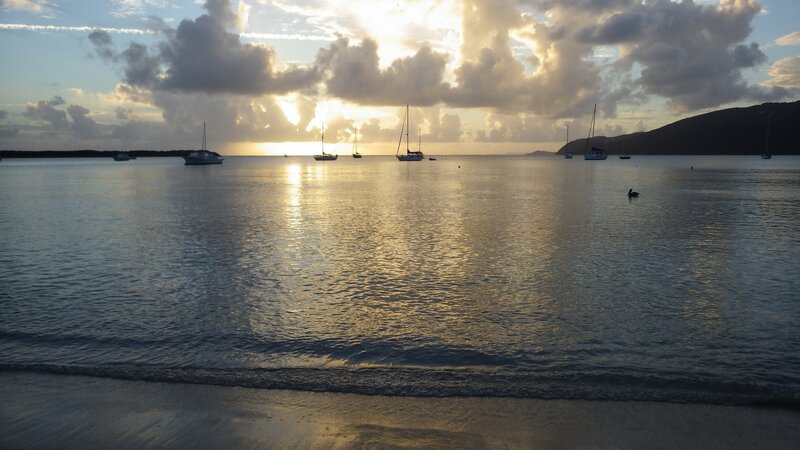 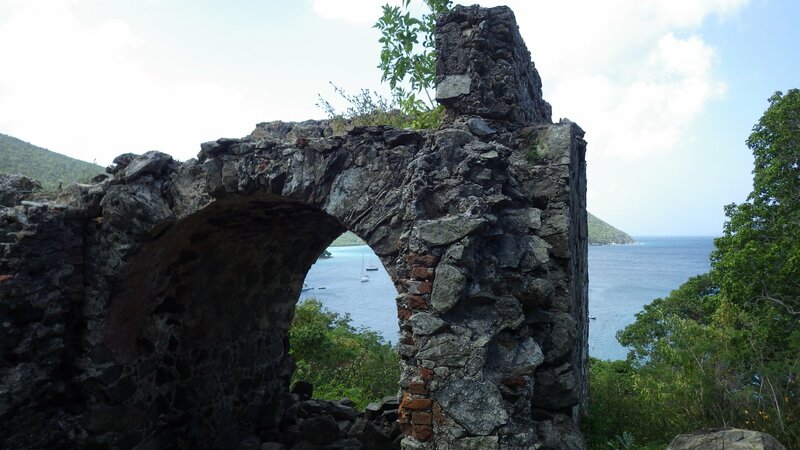 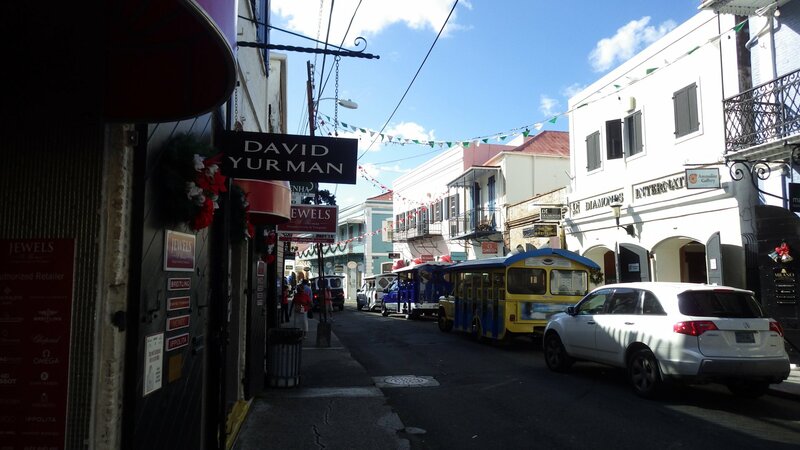 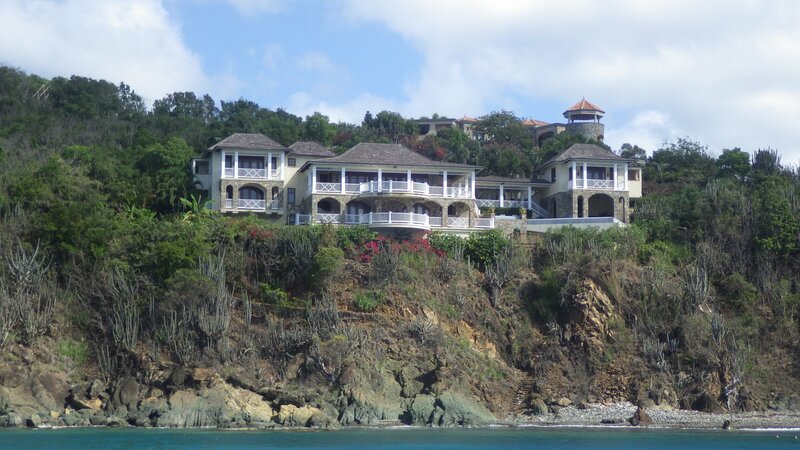 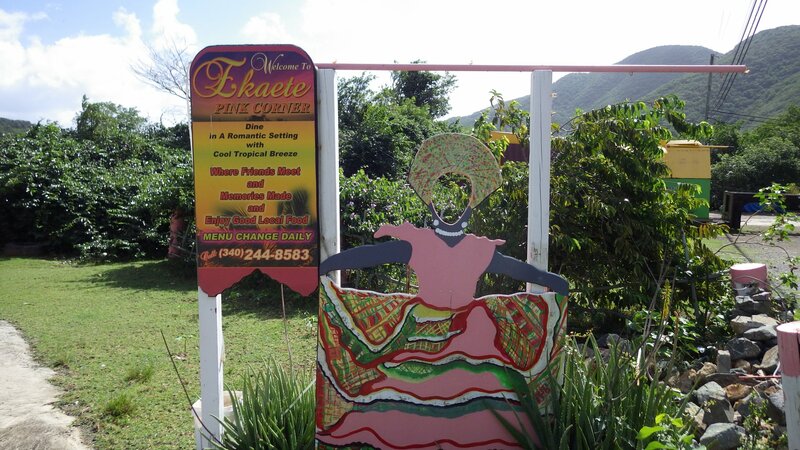 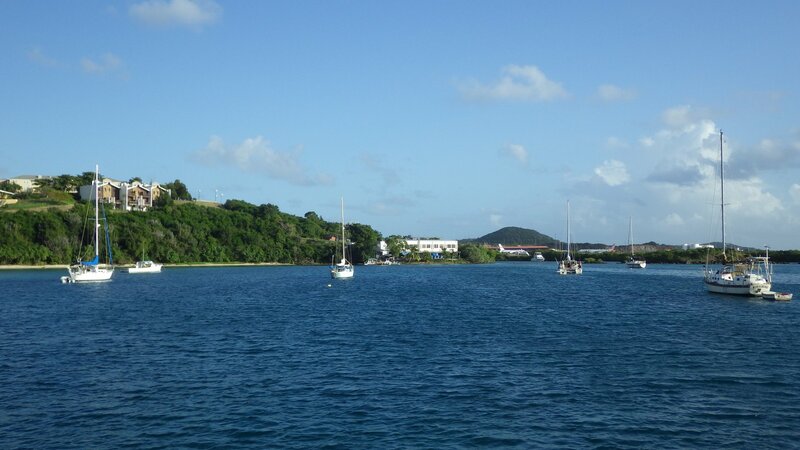 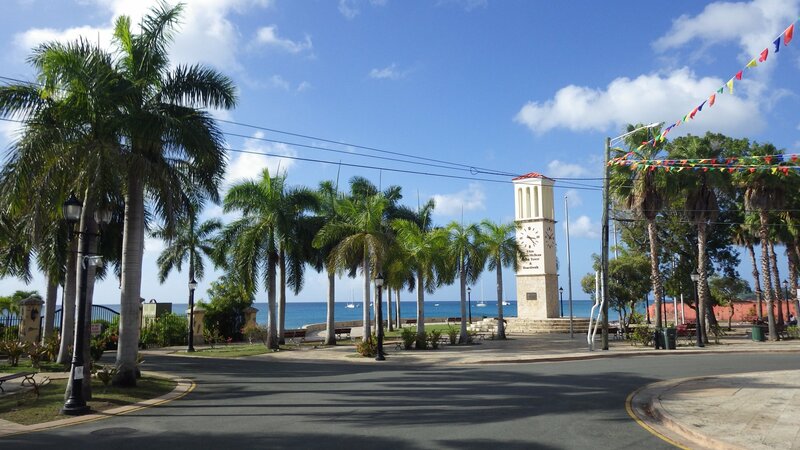 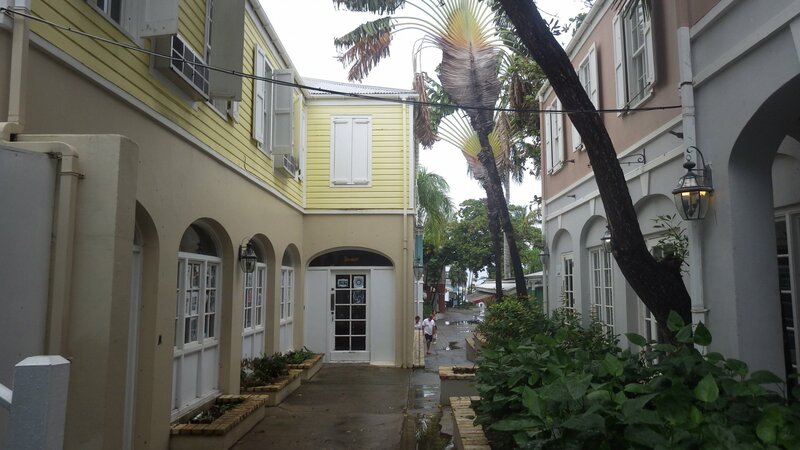 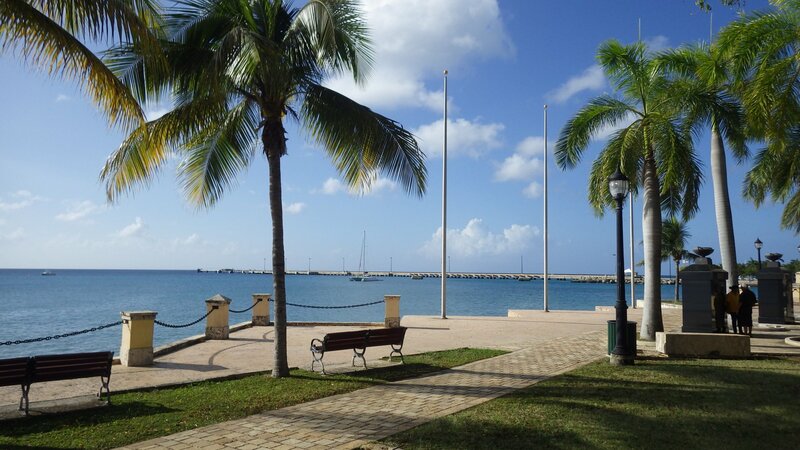 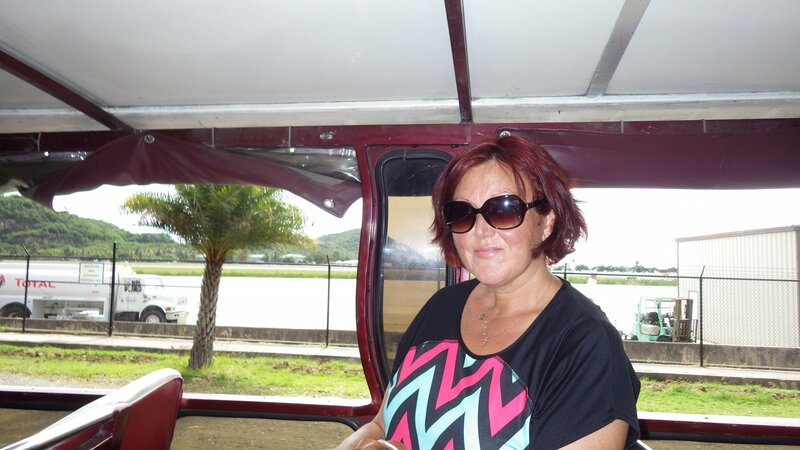 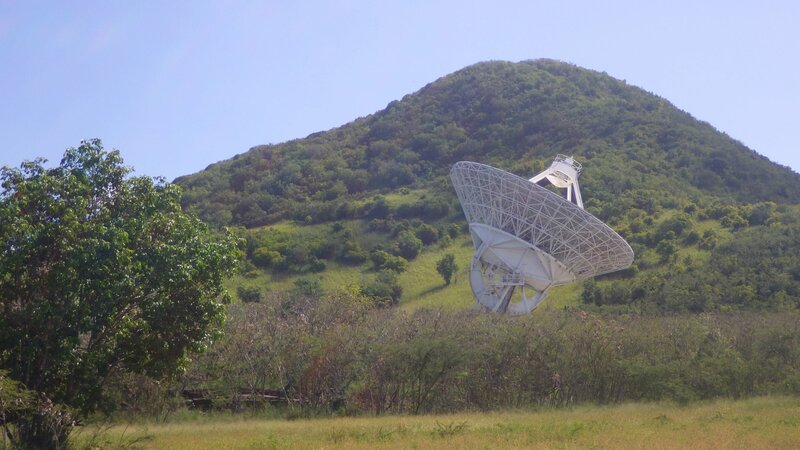 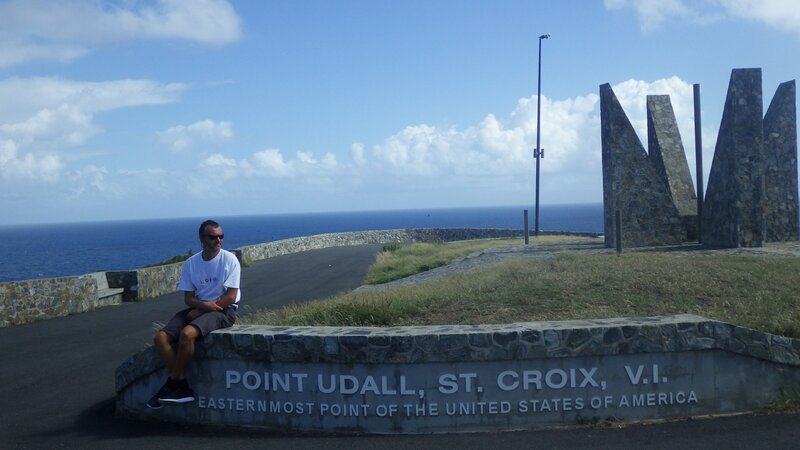 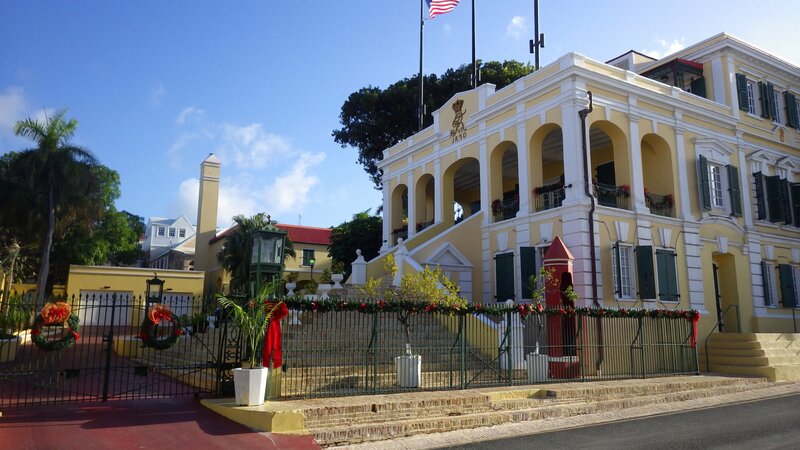 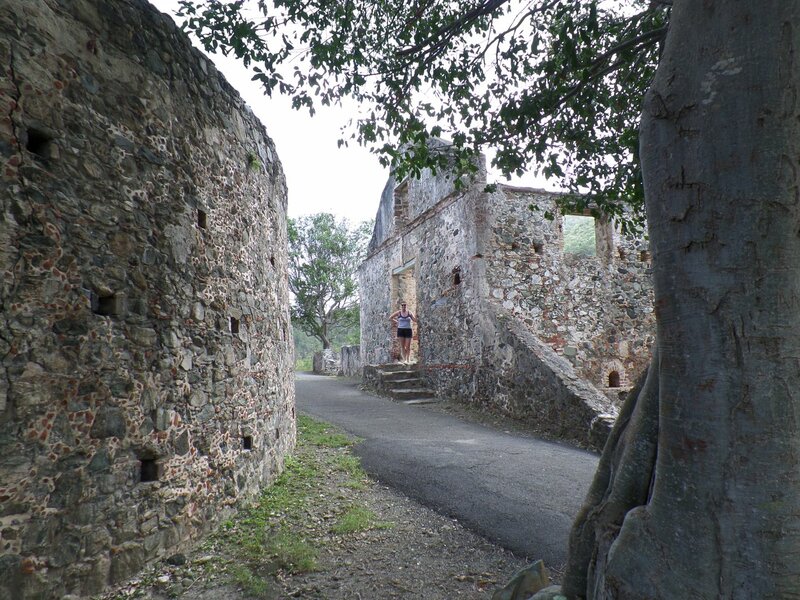 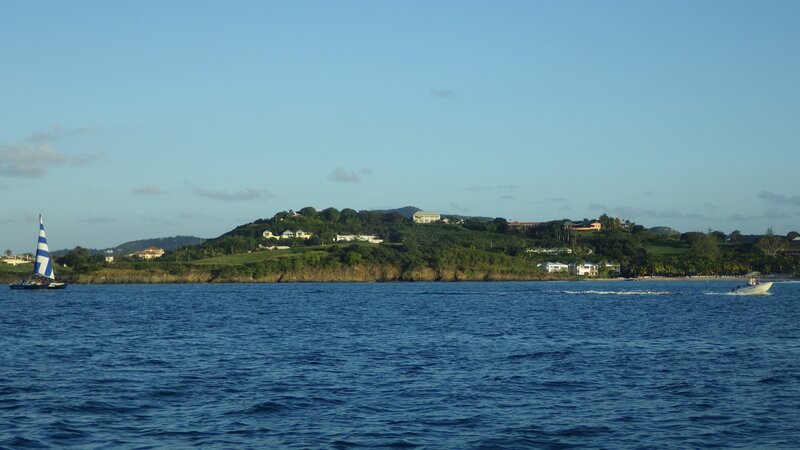 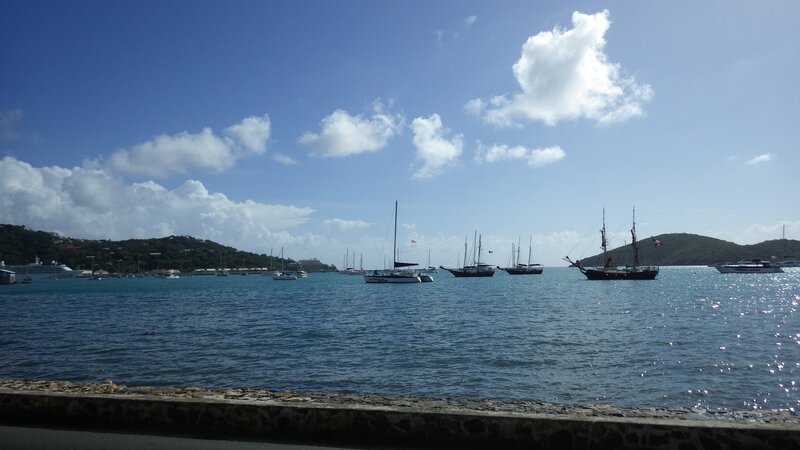 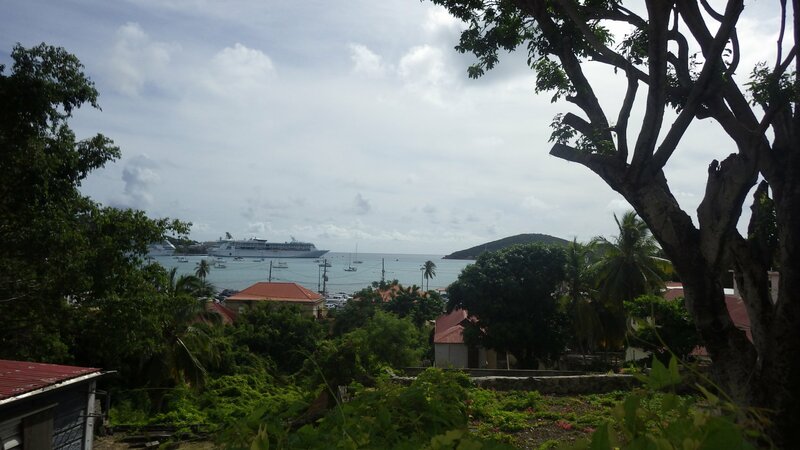 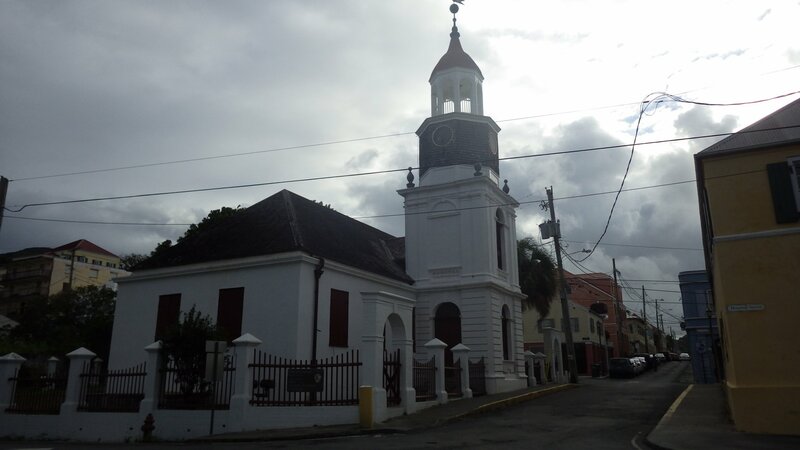 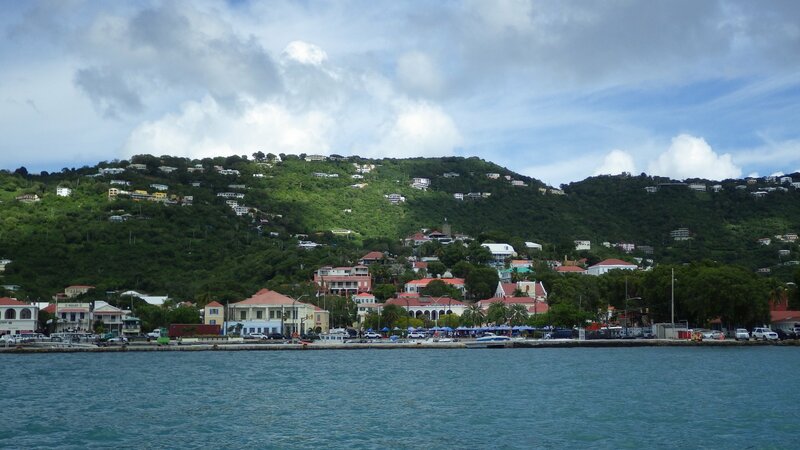 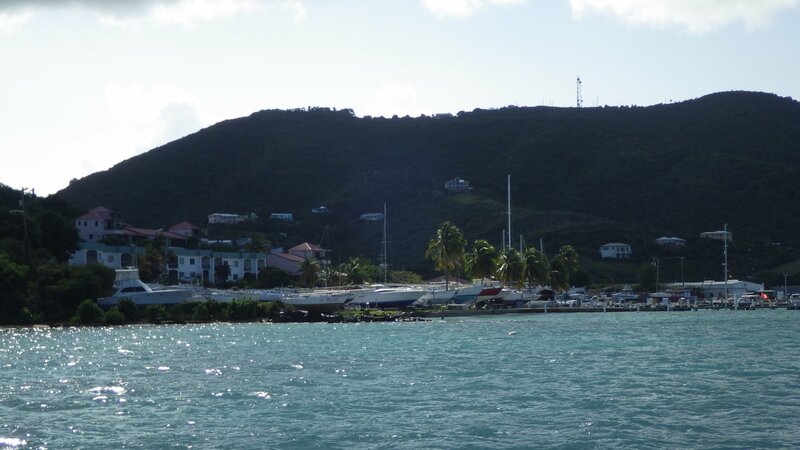 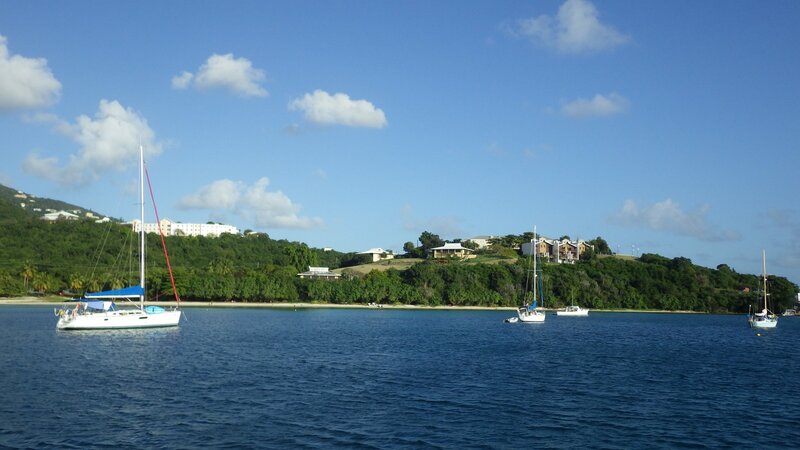 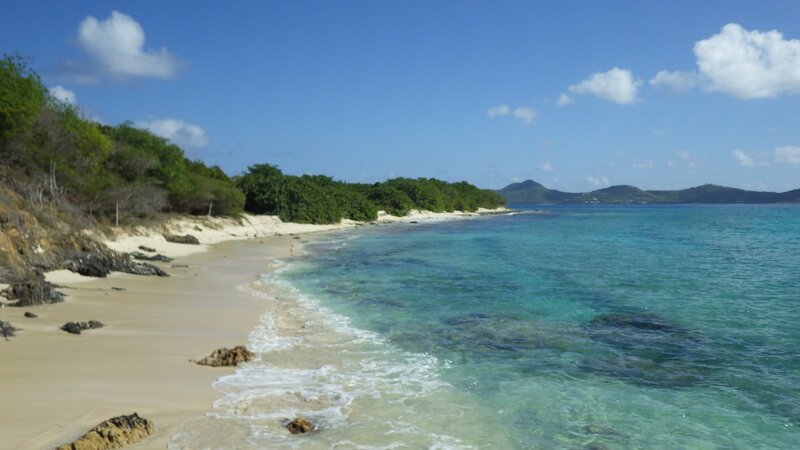 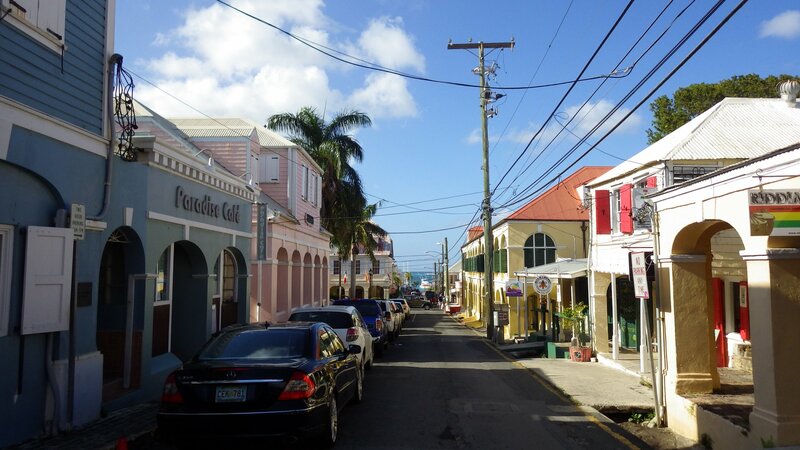 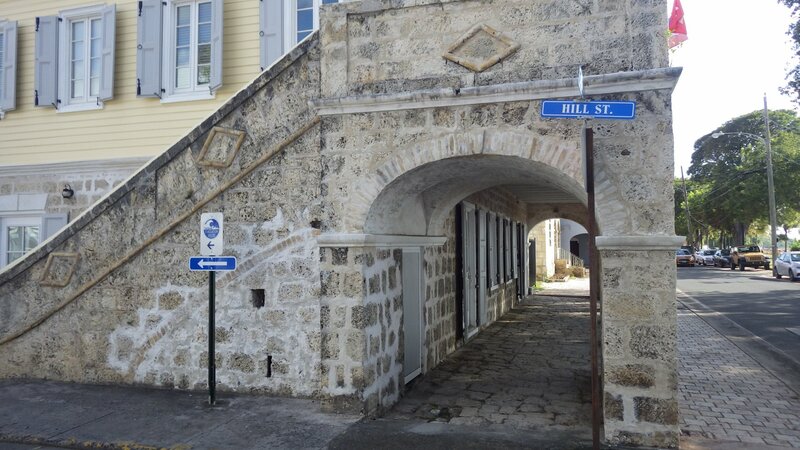 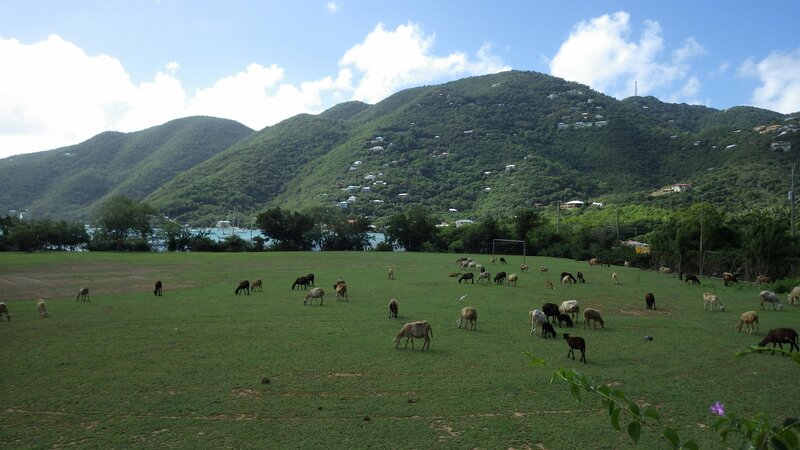 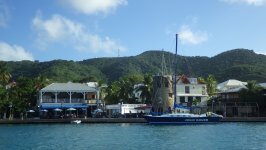 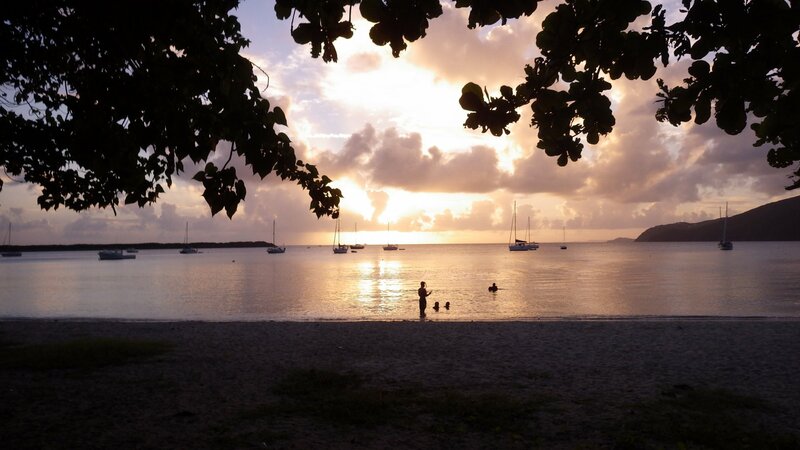 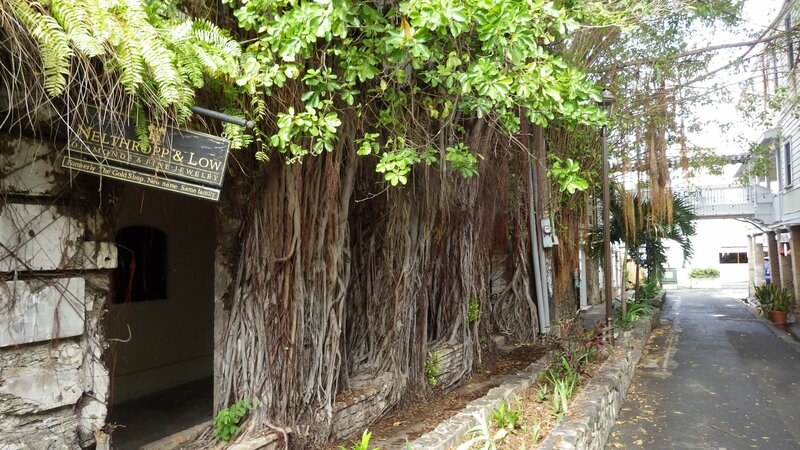 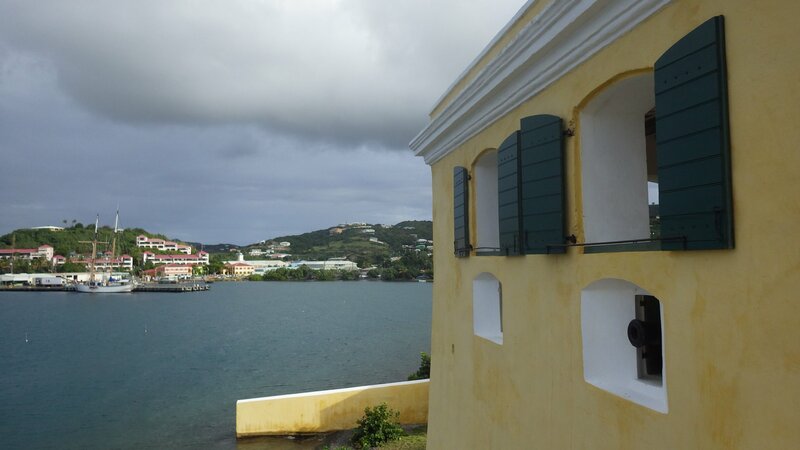 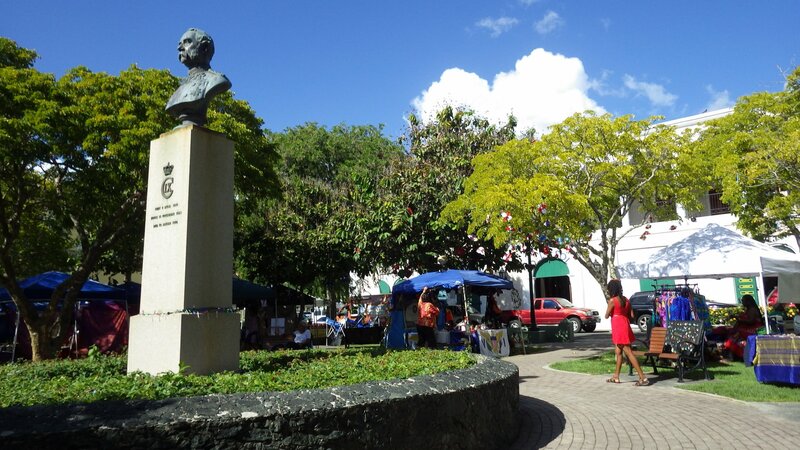 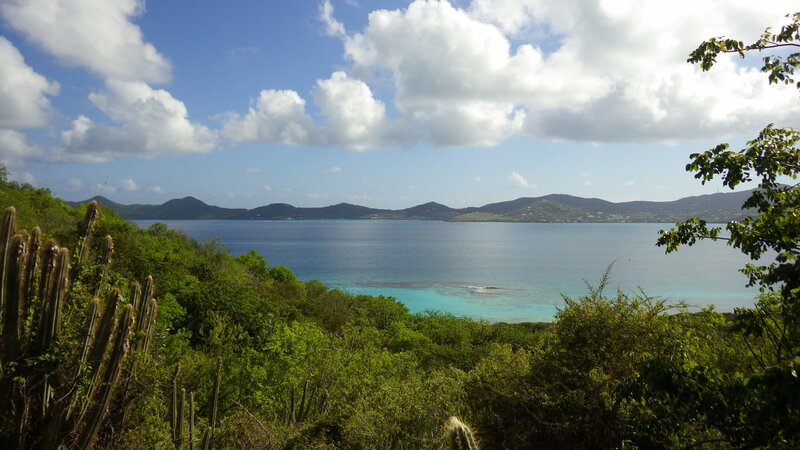 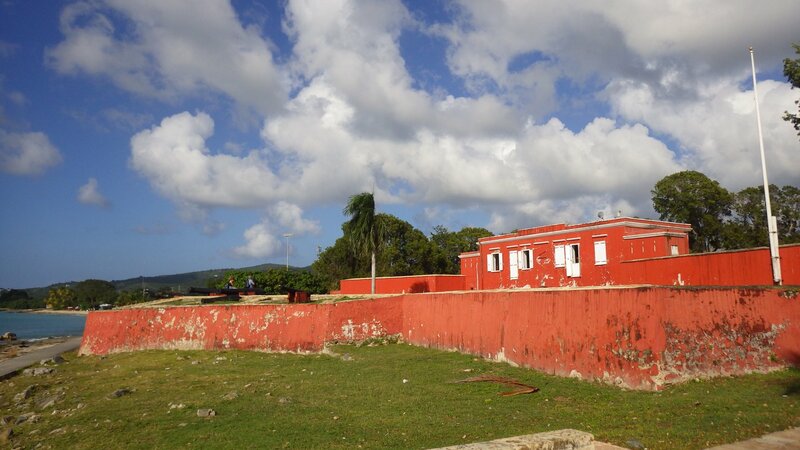 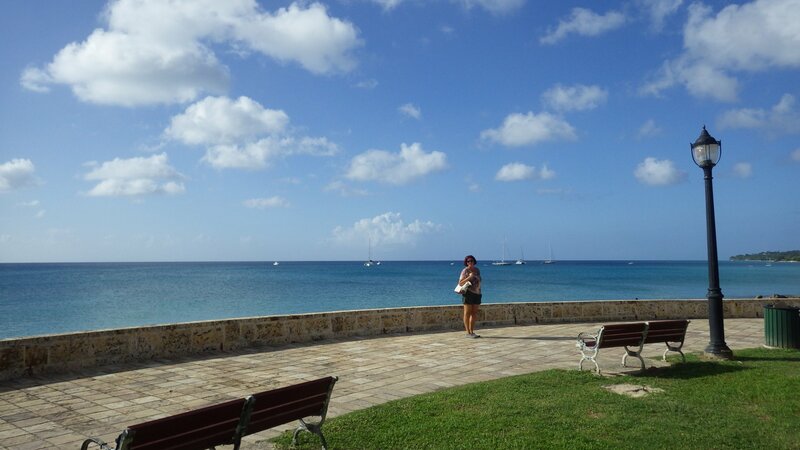 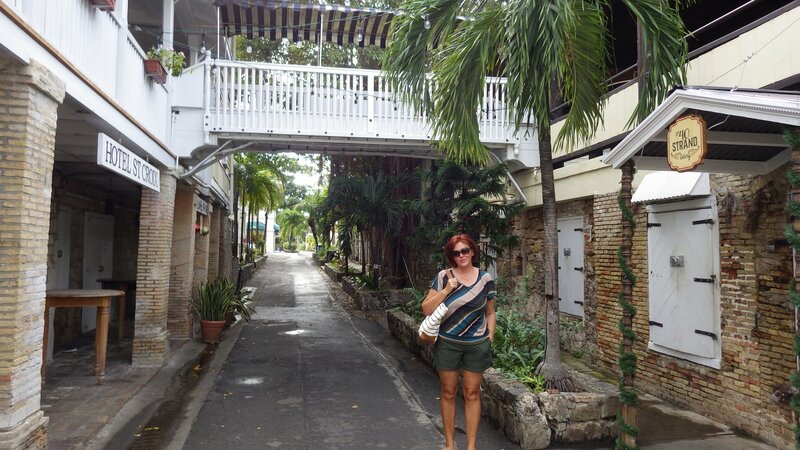 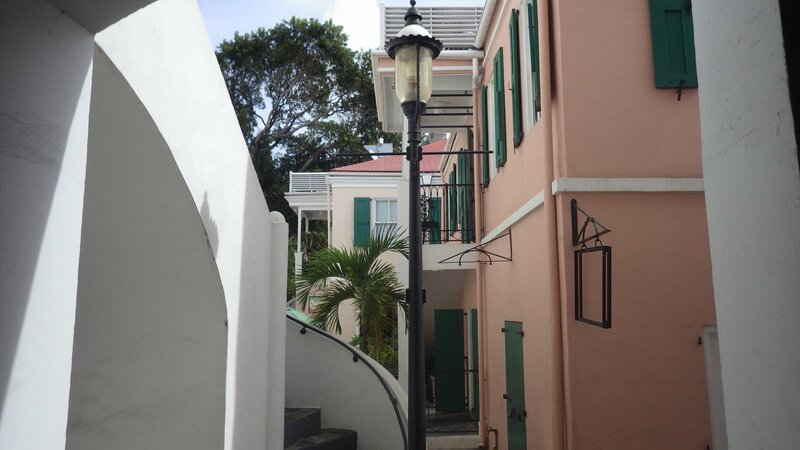 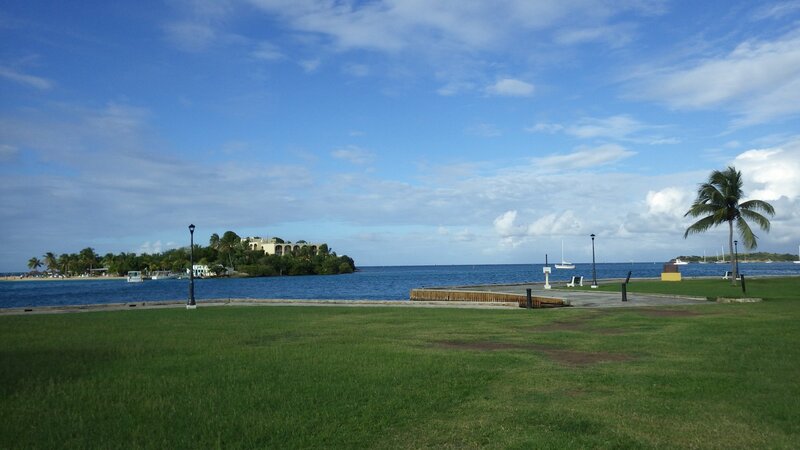 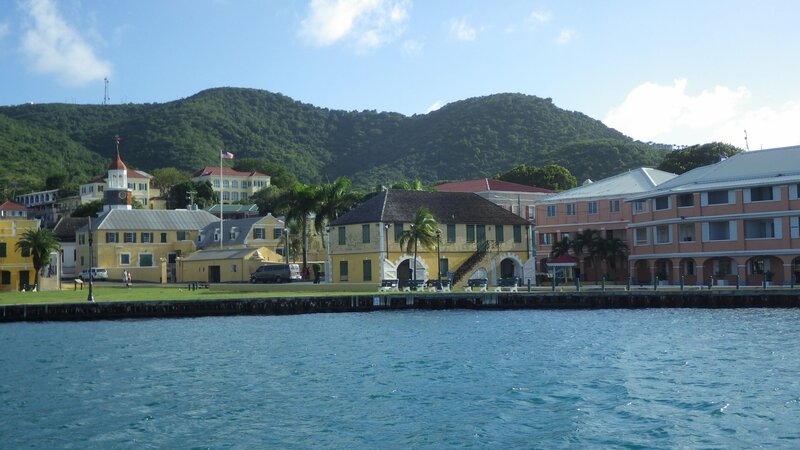 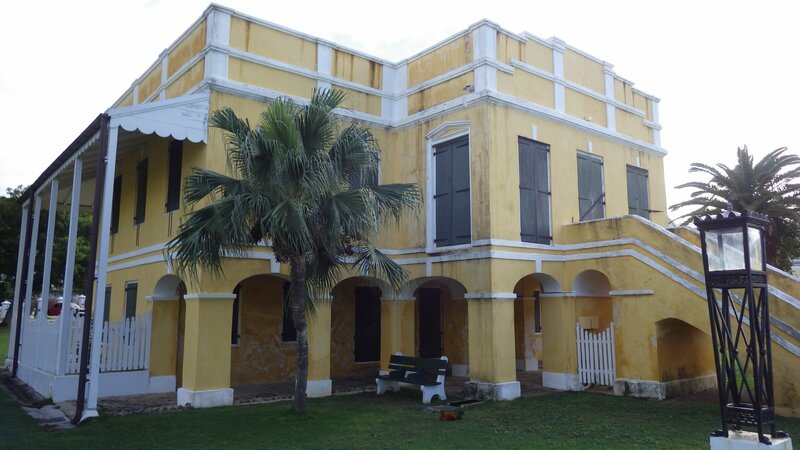 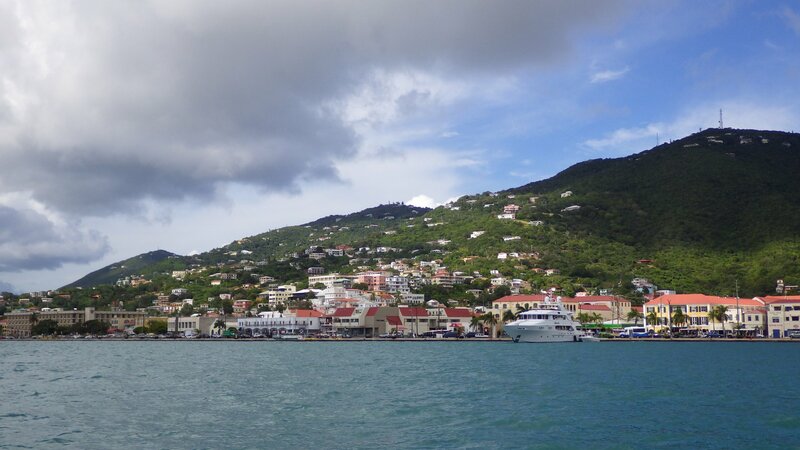 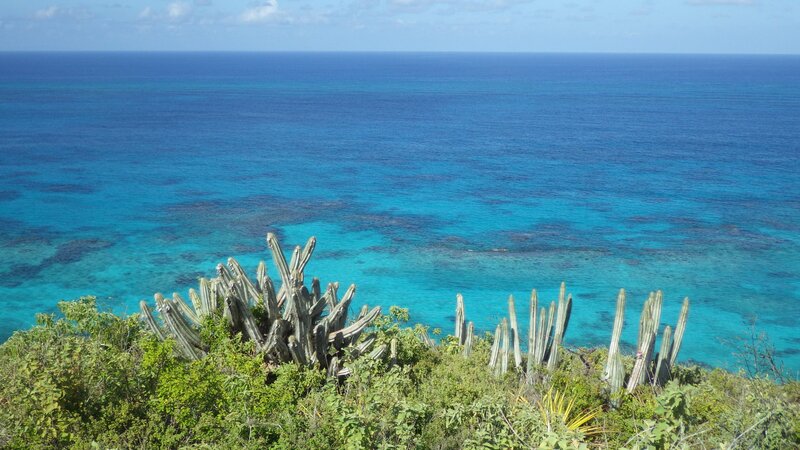 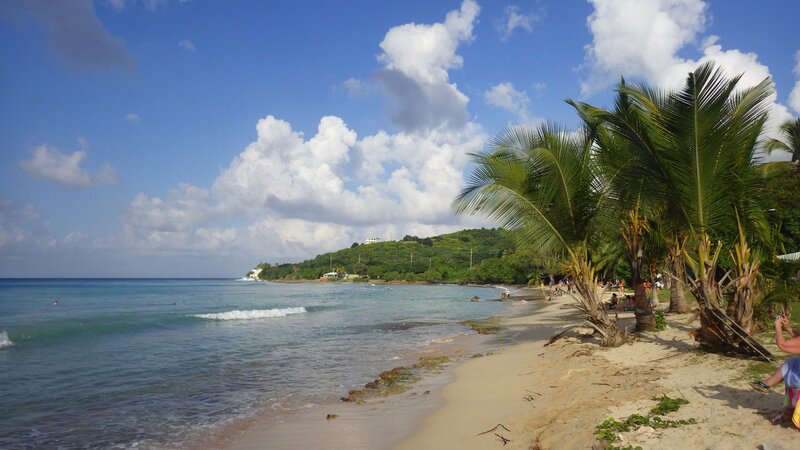 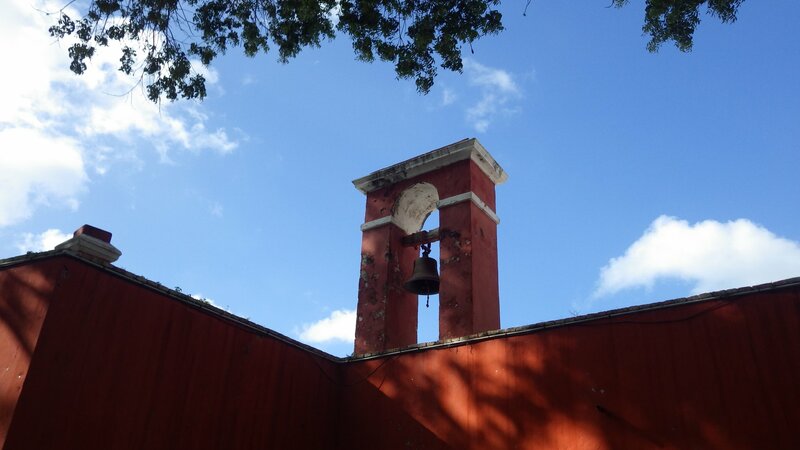 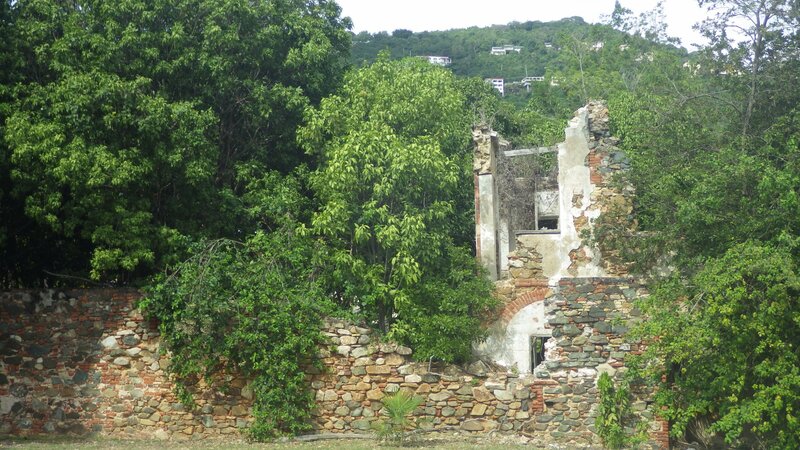 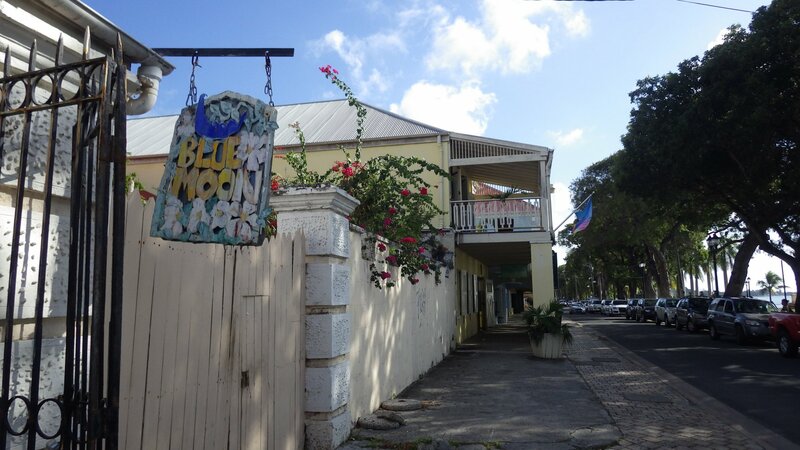 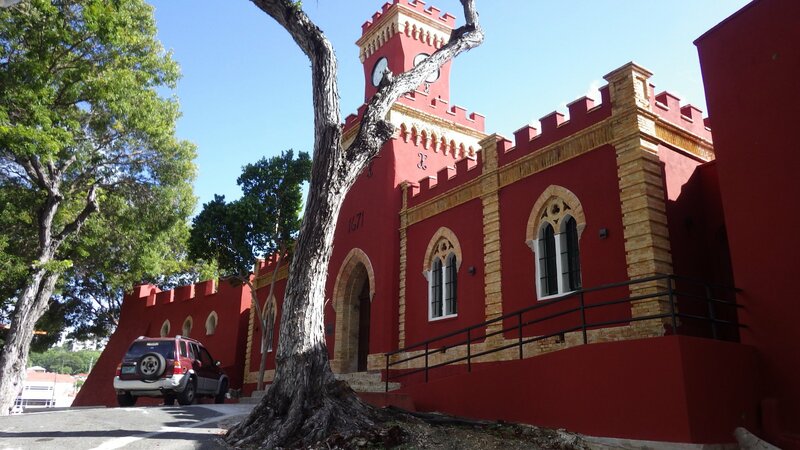 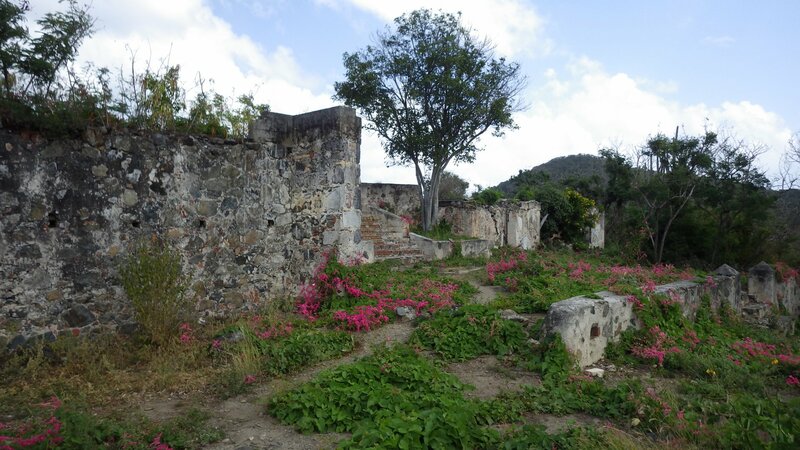 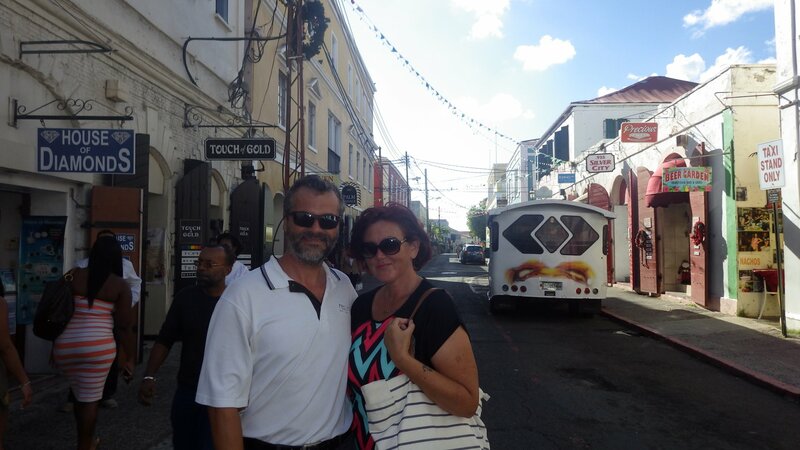 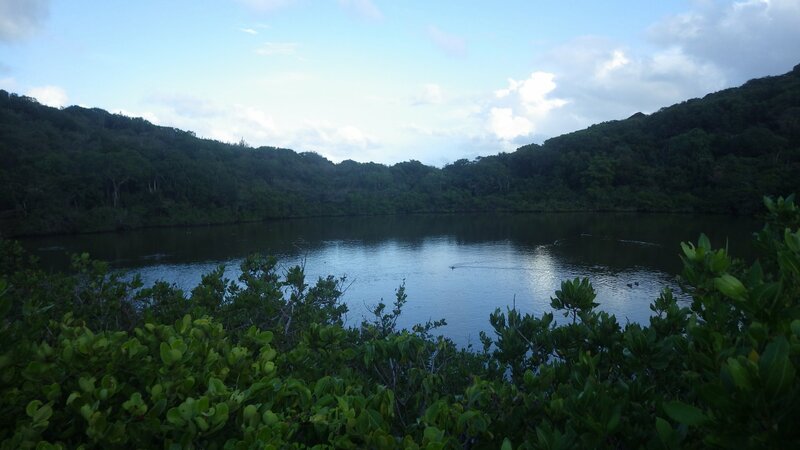 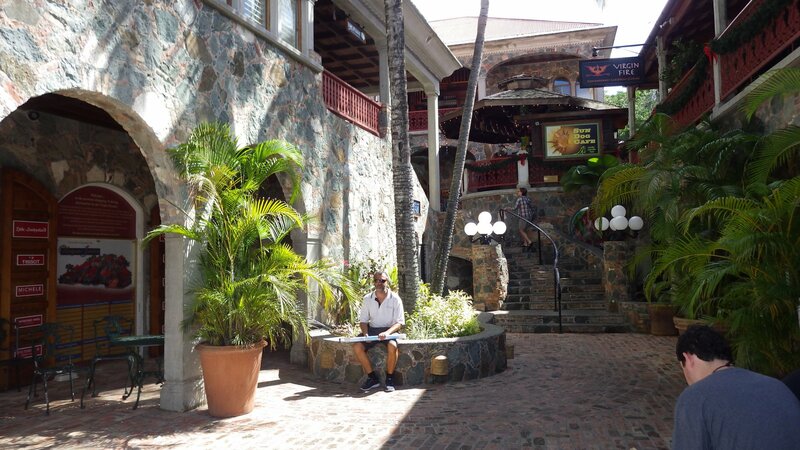 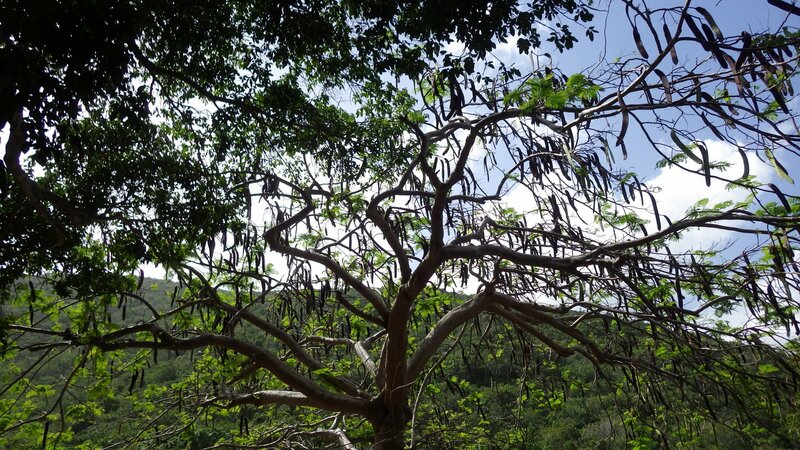 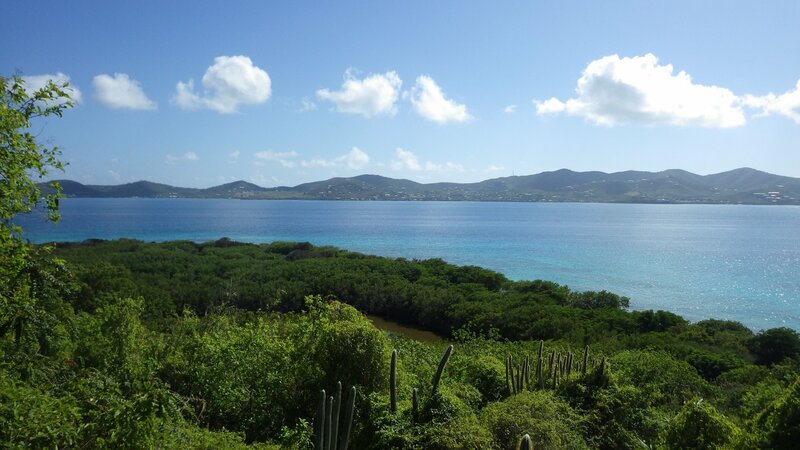 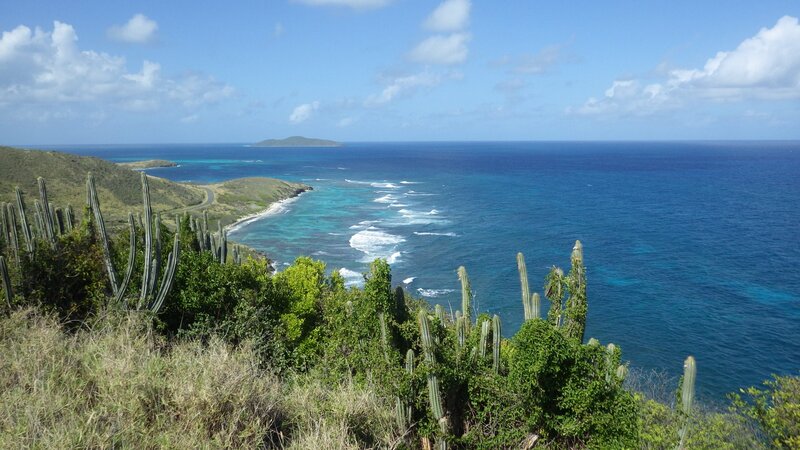 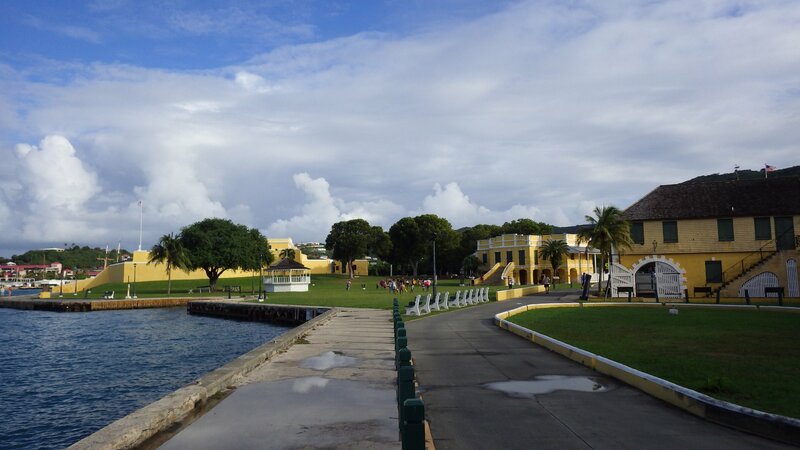 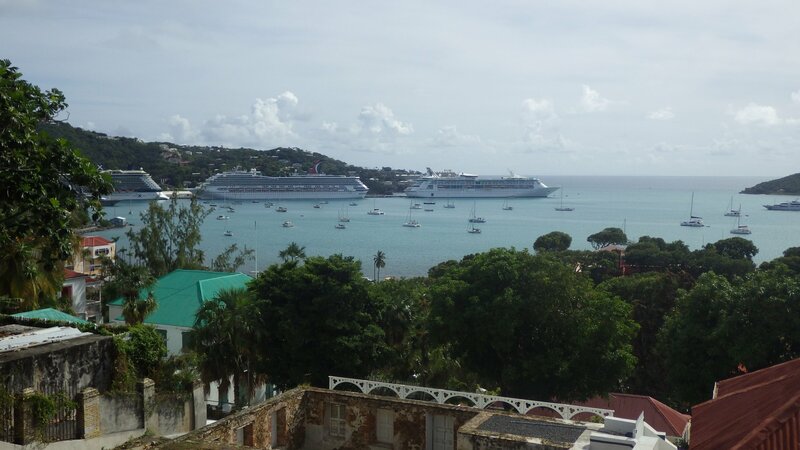 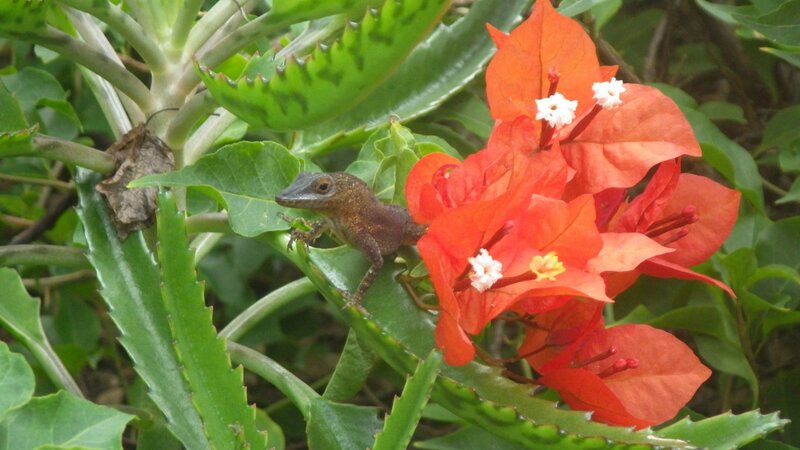 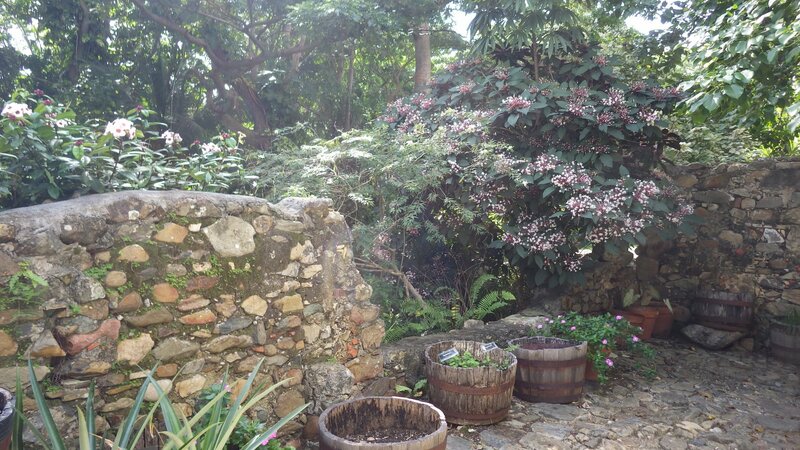 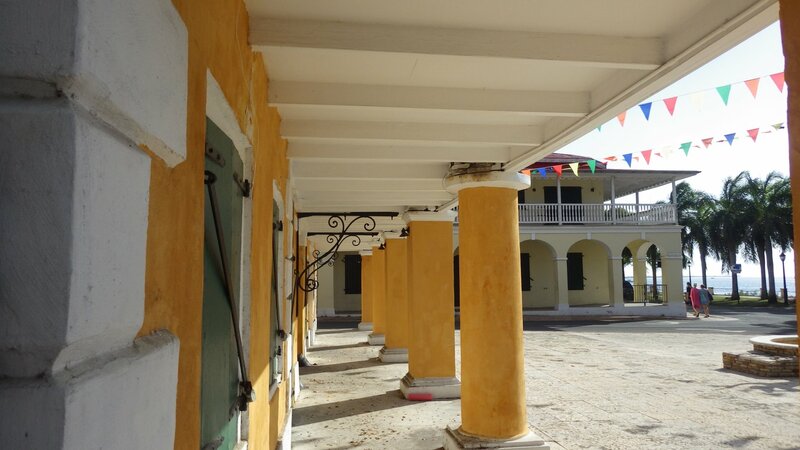 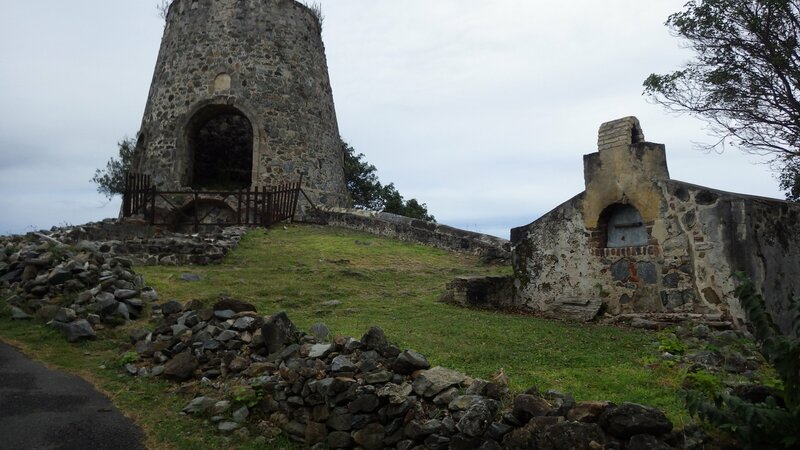 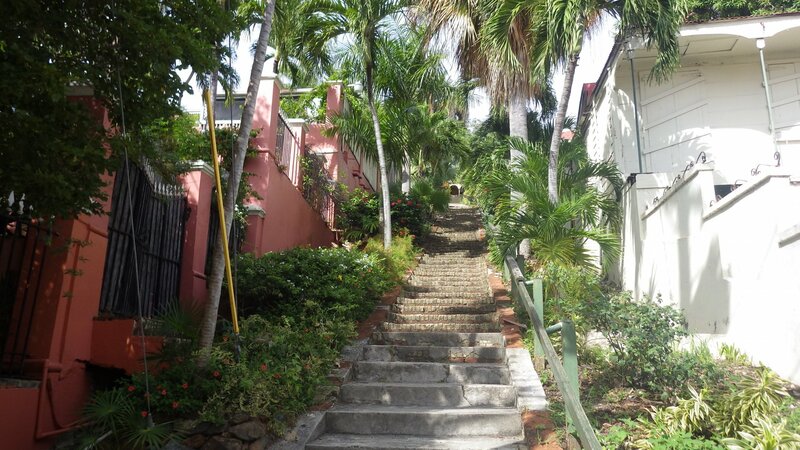 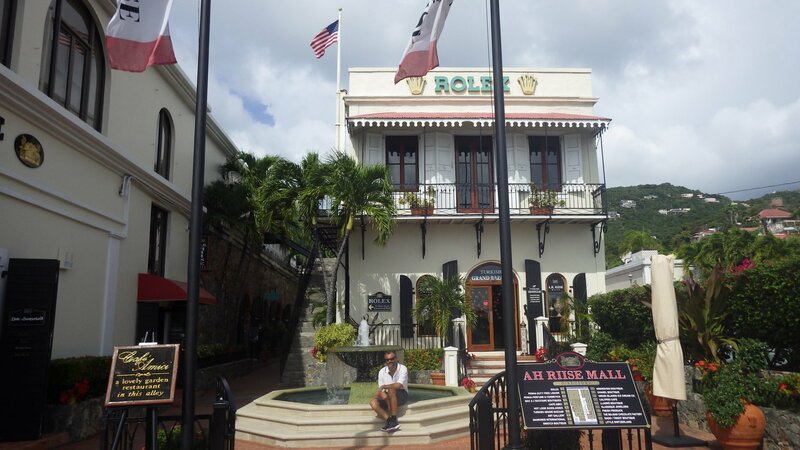 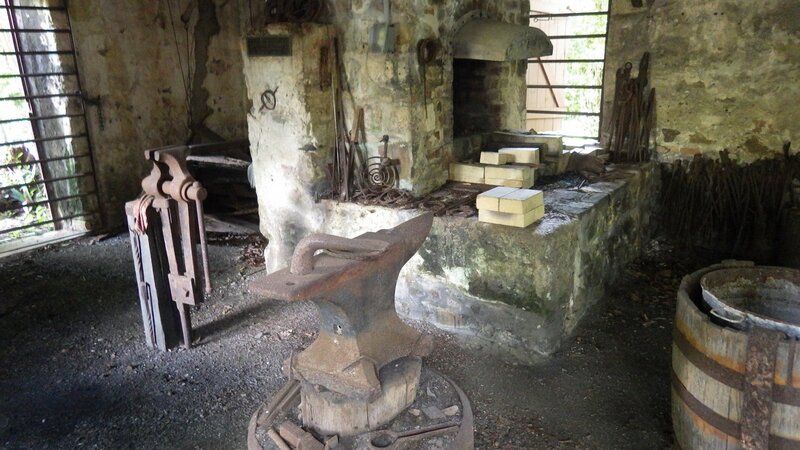 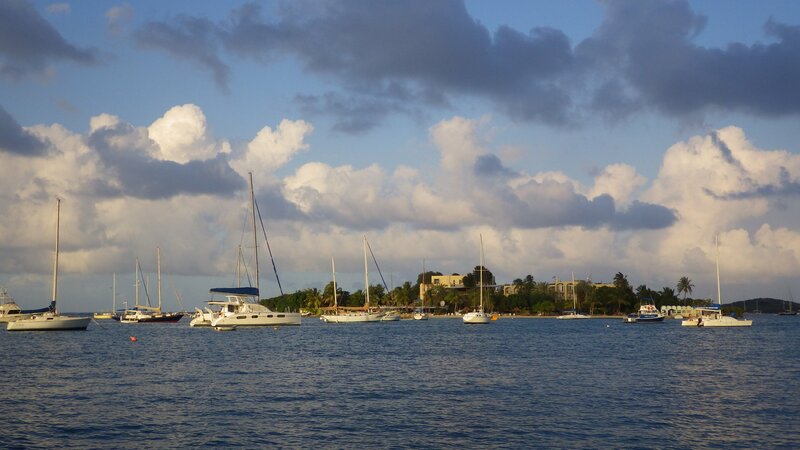 The town of Chrisiansted, St Croix is fairly pretty � in the tourist area. 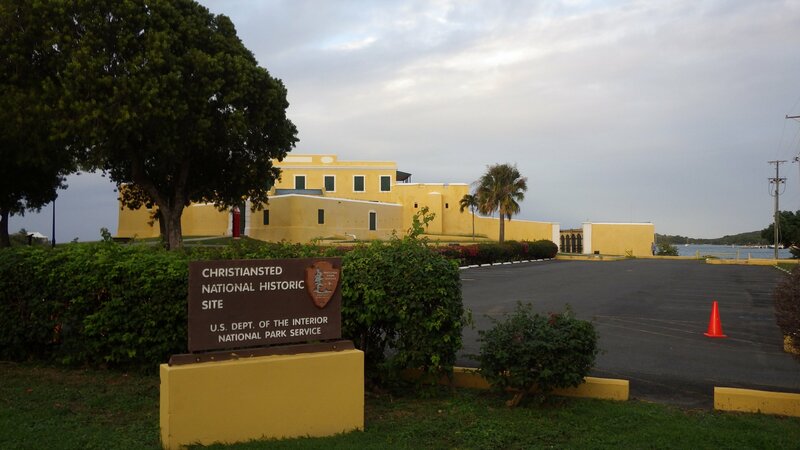 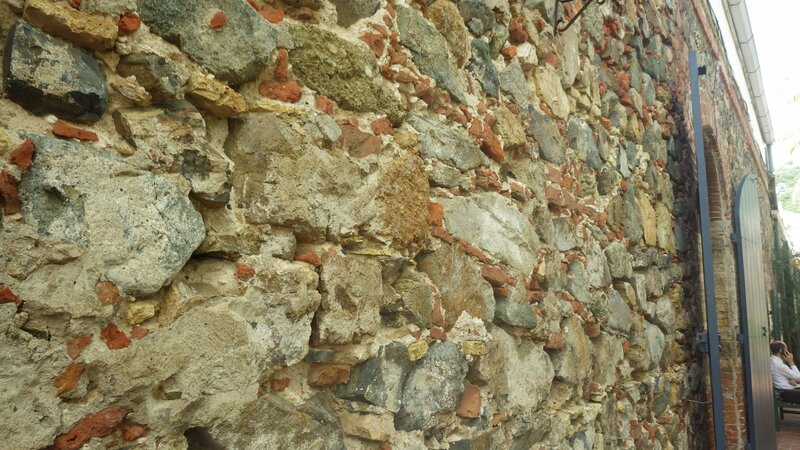 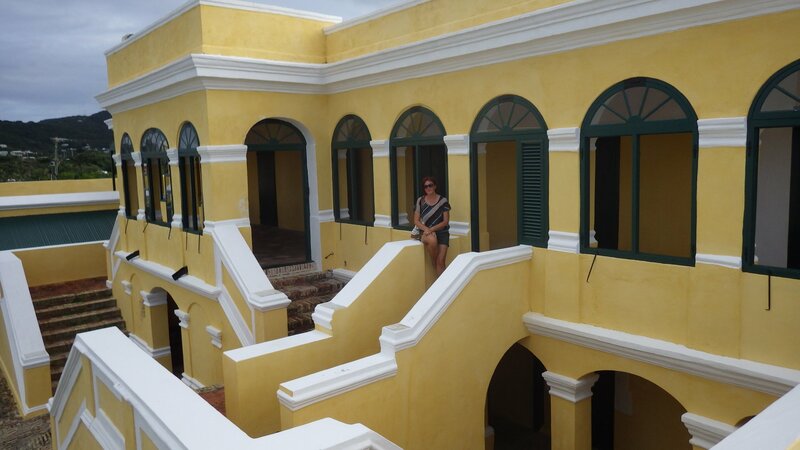 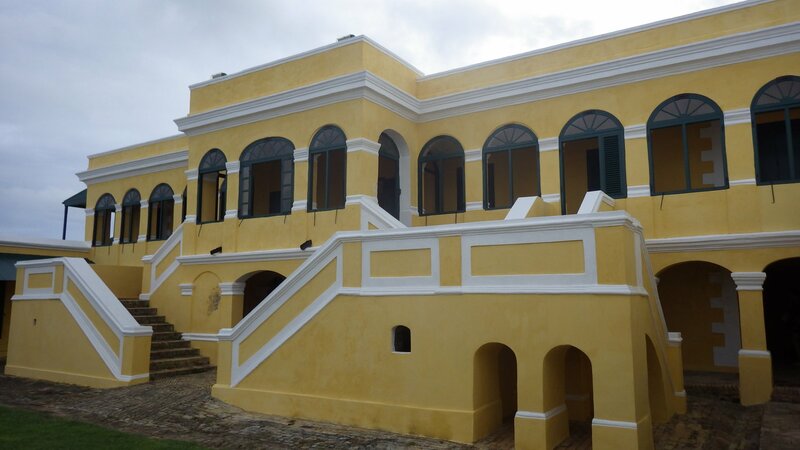 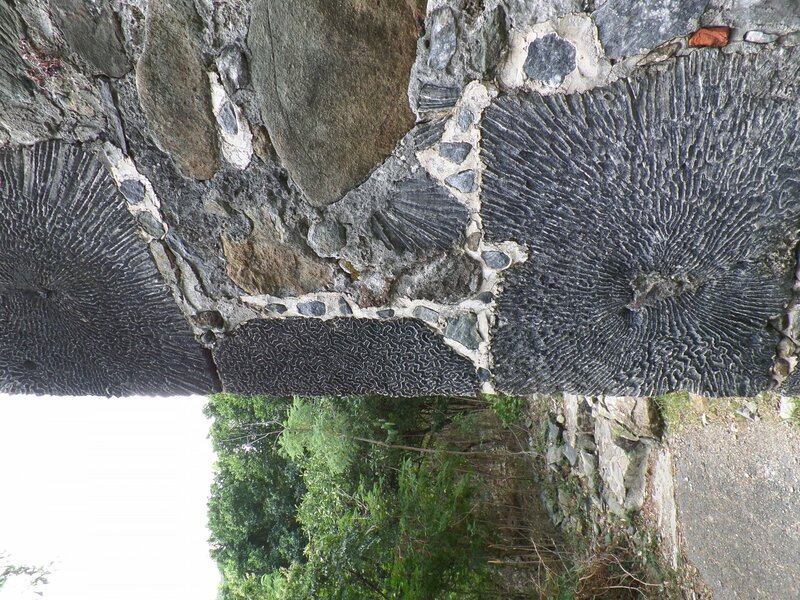 Restored old Dutch colonial architecture, inviting boardwalk, many historical places, including Fort Christiansvaern. 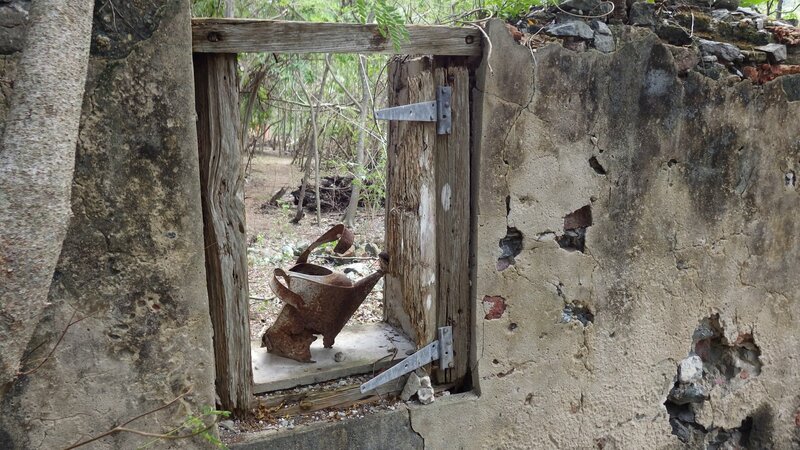 Although the town is a bit rough on the outskirts. 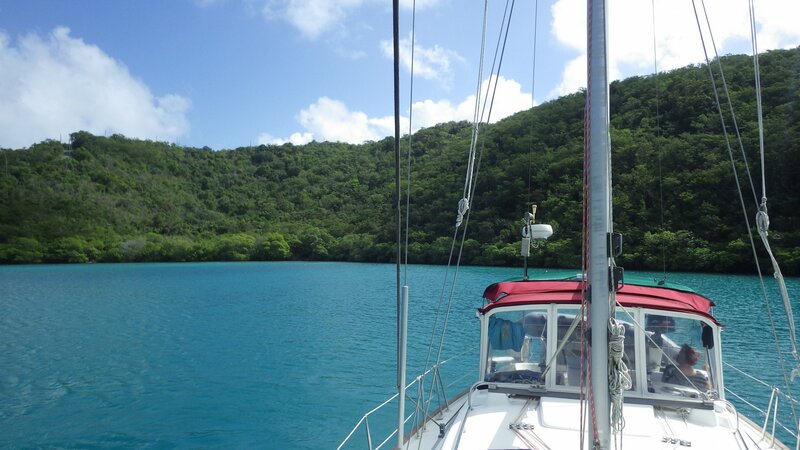 We anchored in the main harbour, close to where all the action is. 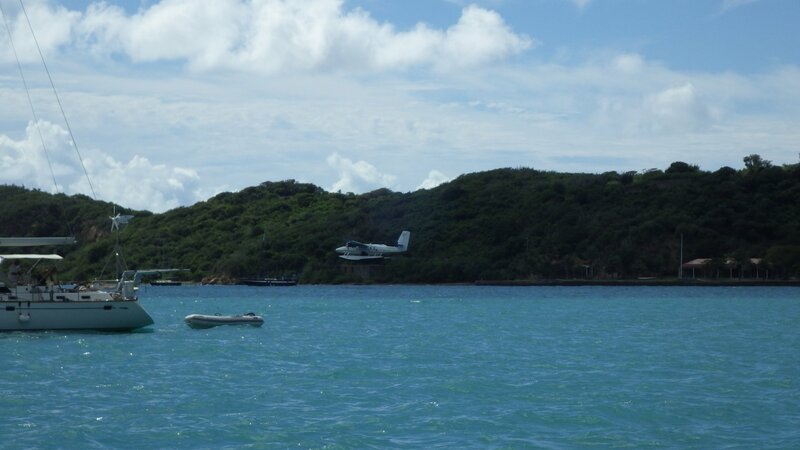 The anchorage is quite crowded, and noise from frequent seaplane take off and landing was bothering at times. 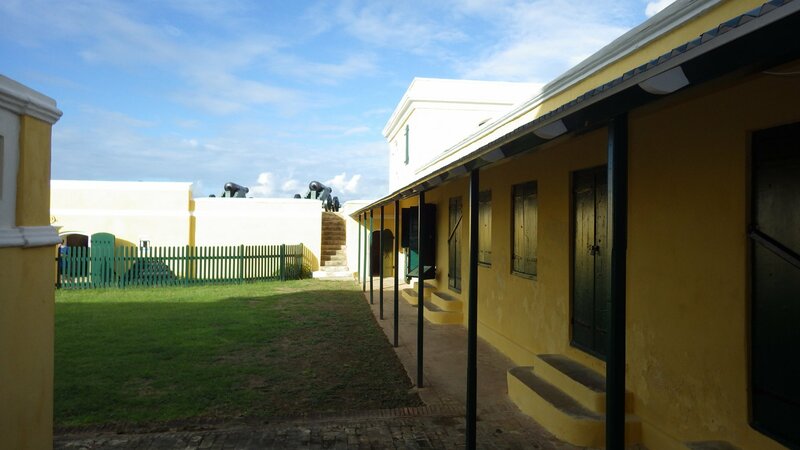 We stayed quite some time here � enjoying the waterfront, exploring, occasional eating out, visiting the Fort, replenishing our supplies, worked on boat (sealing toe rail), etc. 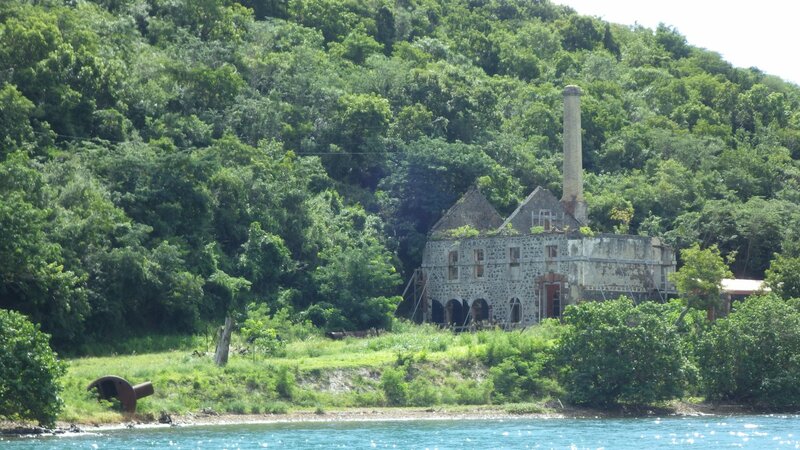 Also rented a car for a road trip around St. Croix Island, and Day sailed to Buck Island. 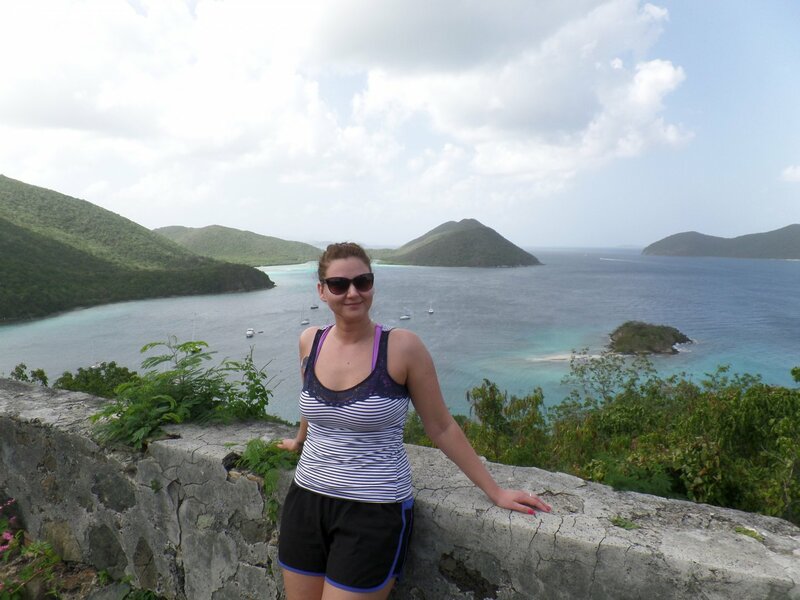 While staying in Christinasted, we rented a car and took a day road trip around St. Croix Island. 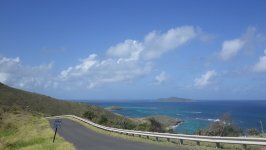 Drove in a loop, from east end to west. 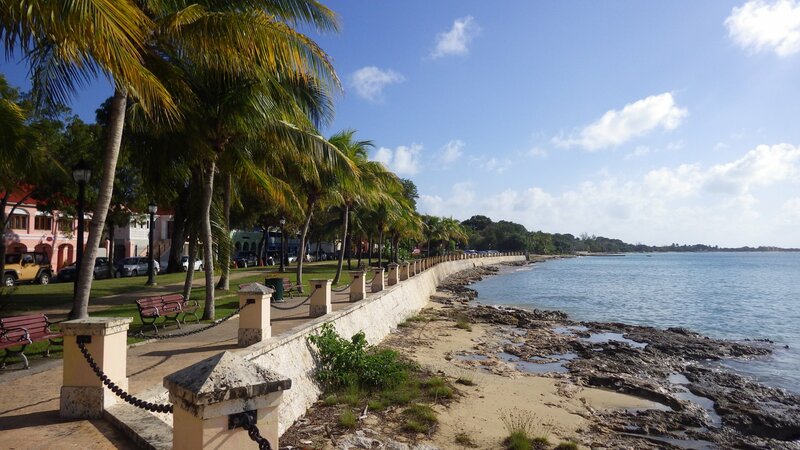 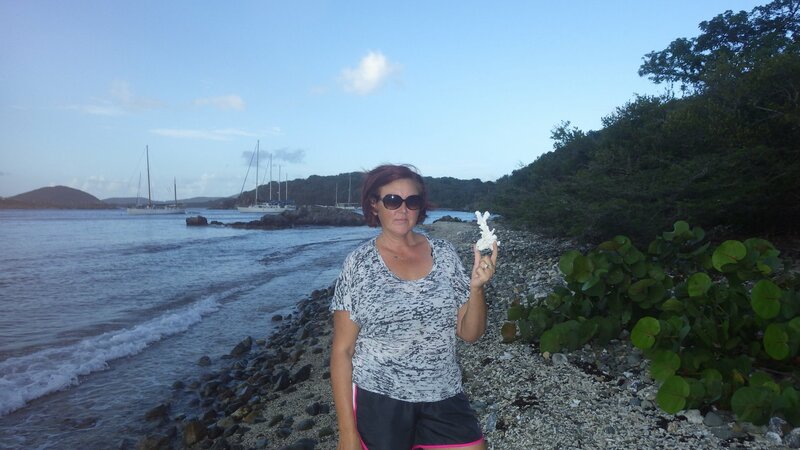 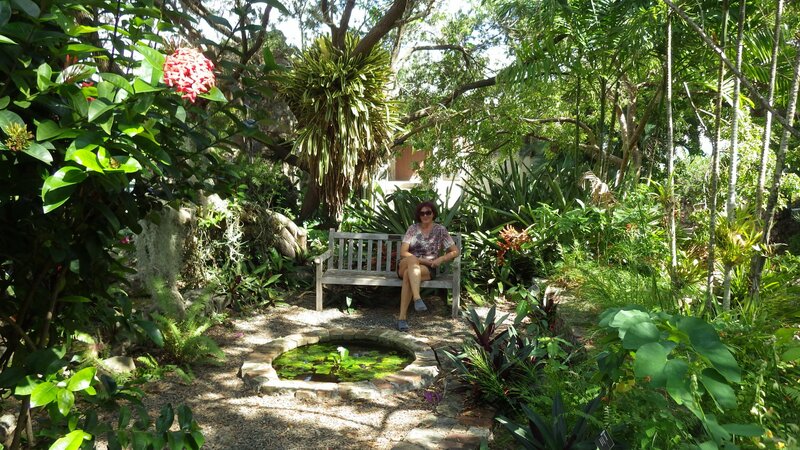 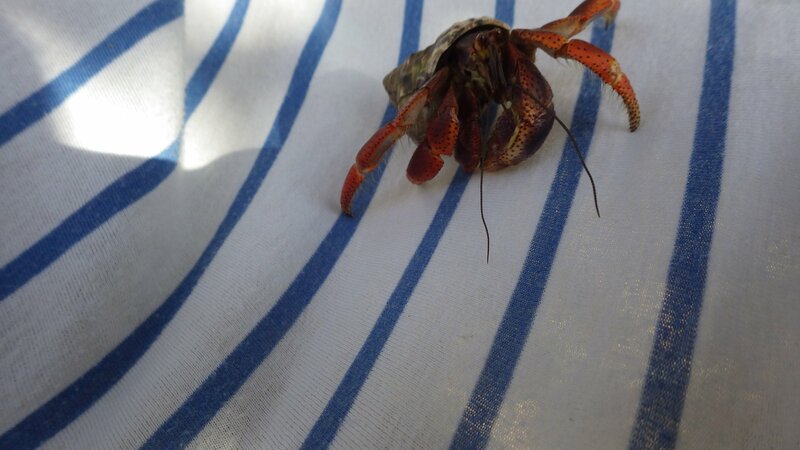 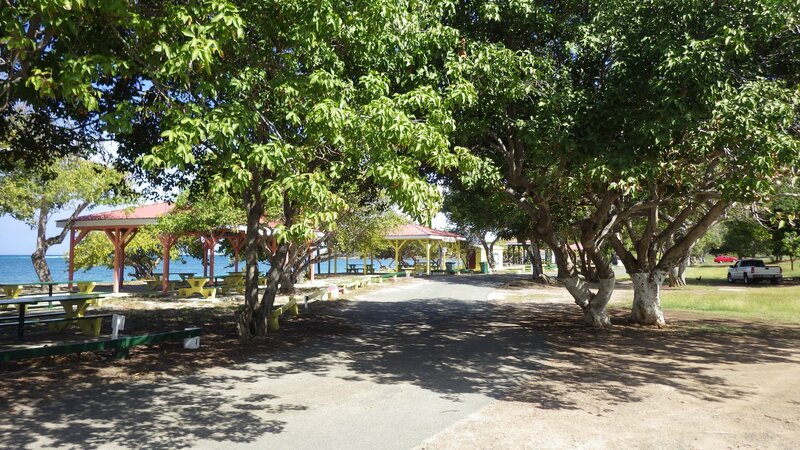 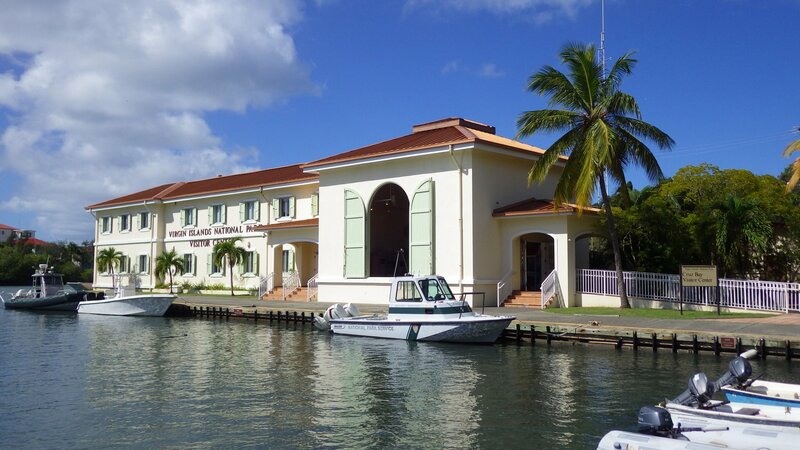 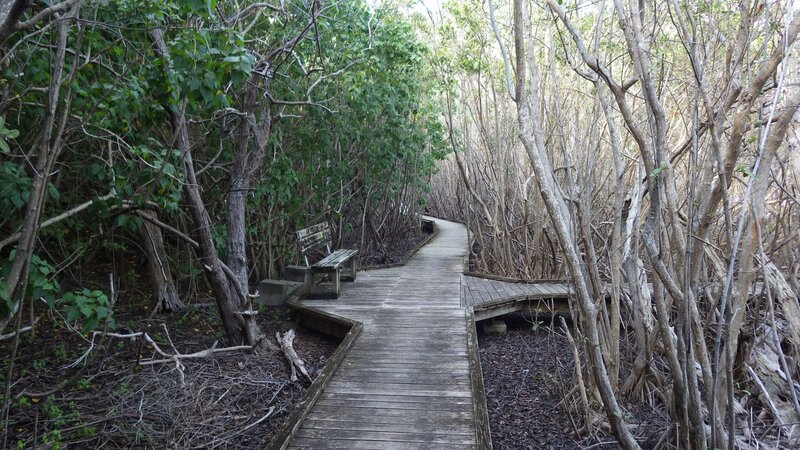 Stopped at many interesting places, including Cramer Park Beach, Point Udall, St. George Botanical Gardens, quaint town of Frederiksted, Cane Bay Beach and Salt River. 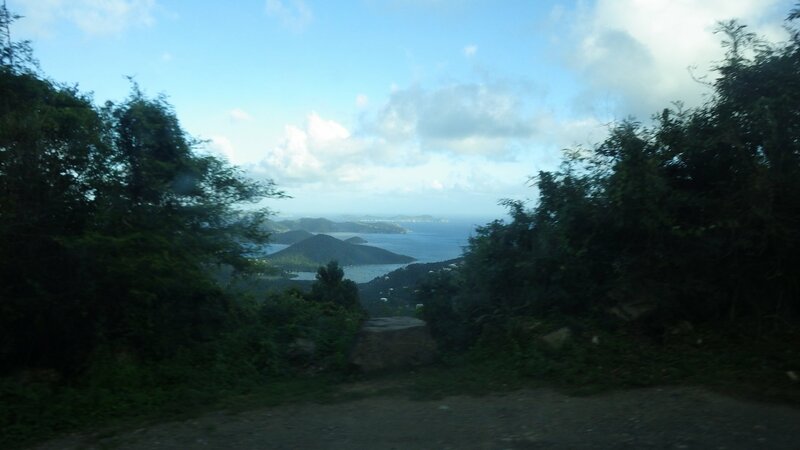 Driving along the narrow road thought the jungle portion was quite unusual. 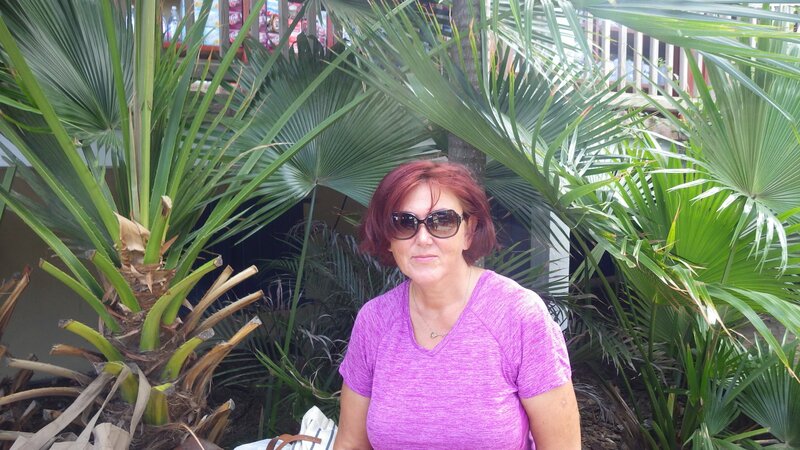 Also had time to visit local Kmart and fill our propane tank. BTW, driving in US Virgin Islands is in the left side. 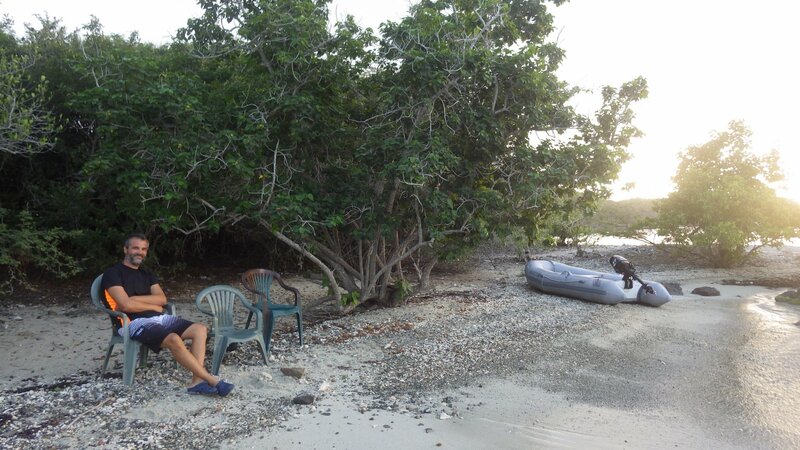 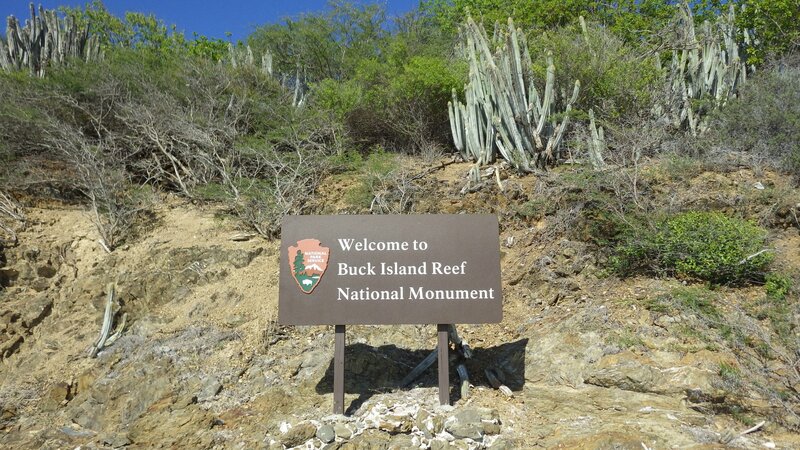 Also while staying in Christinasted we had a day of very quiet weather and decided to visit Buck Island, St. Croix's special attraction. 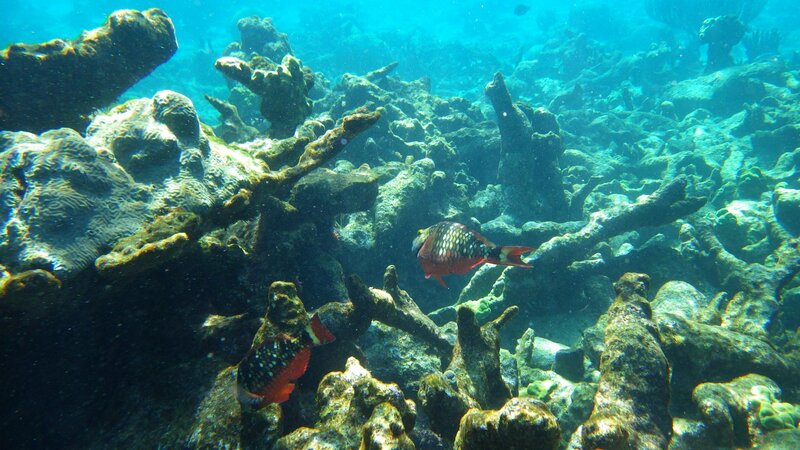 The reef life there supposedly one of the best � "magnificent array of corals, sponges, see fans and fish". 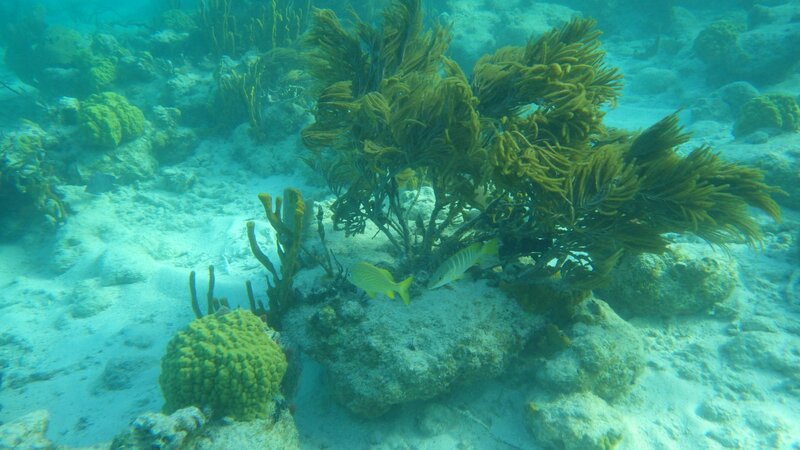 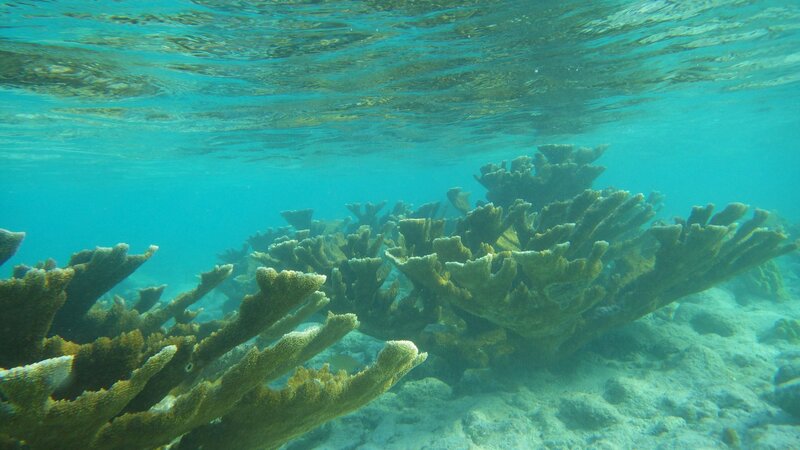 The area declared as a Reef National Monument after all, so I decided to check it out and snorkel it. 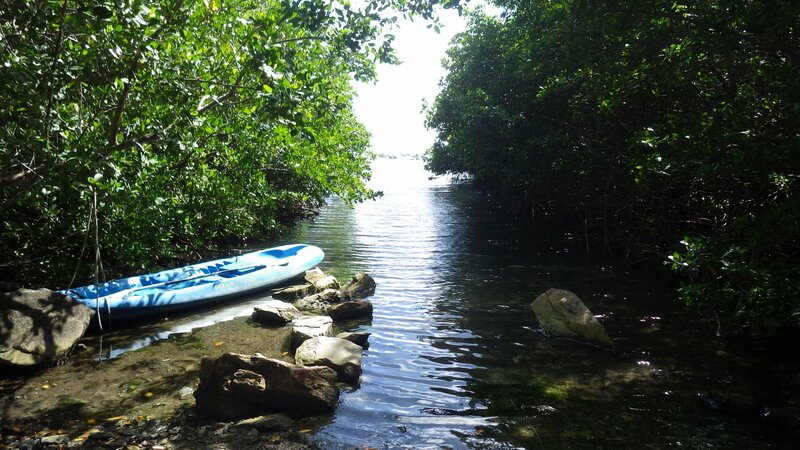 We took a dinghy to another side of the island where there is a Marine Garden and a unique marked underwater trail. 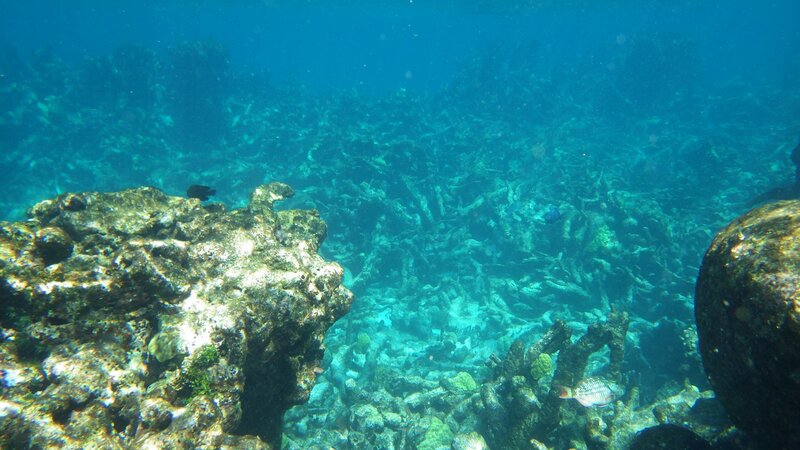 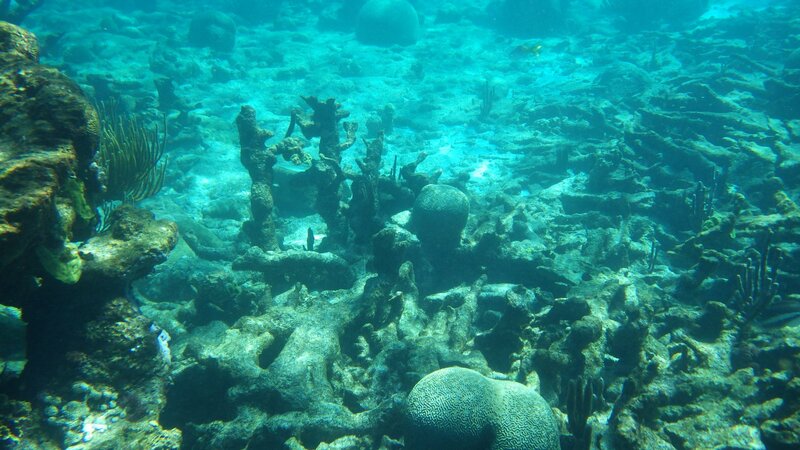 Unfortunately, I have found mostly dead coral and fish is not plenty either. 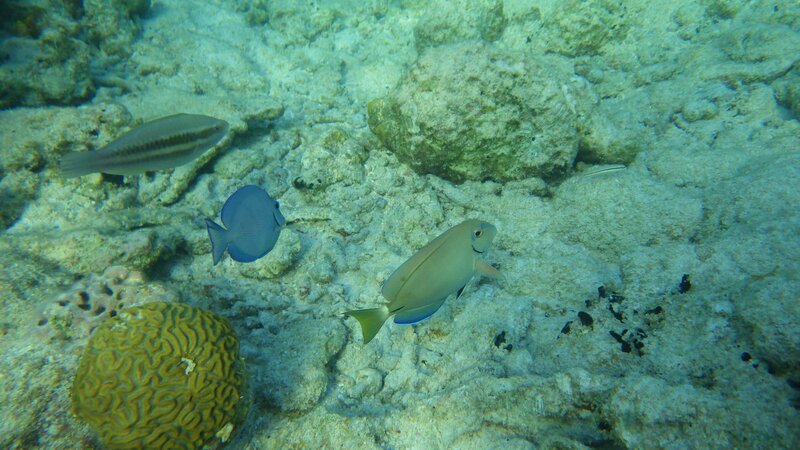 The reef life now is definitely not as it used to be. 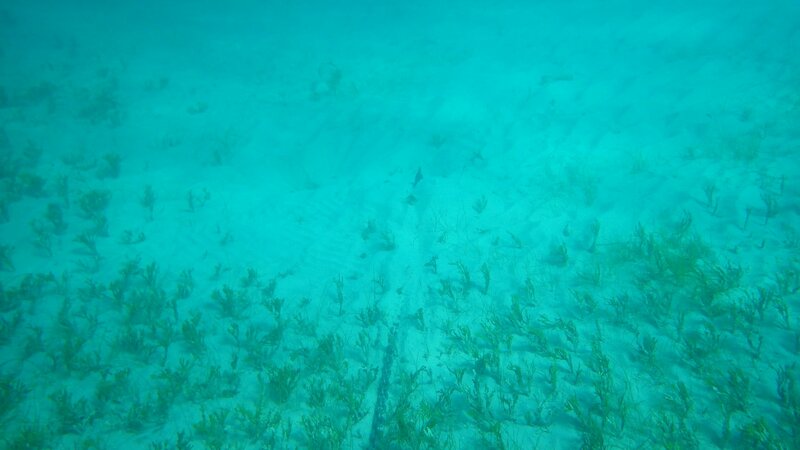 Came across a school of barracudas waiting for their prey. 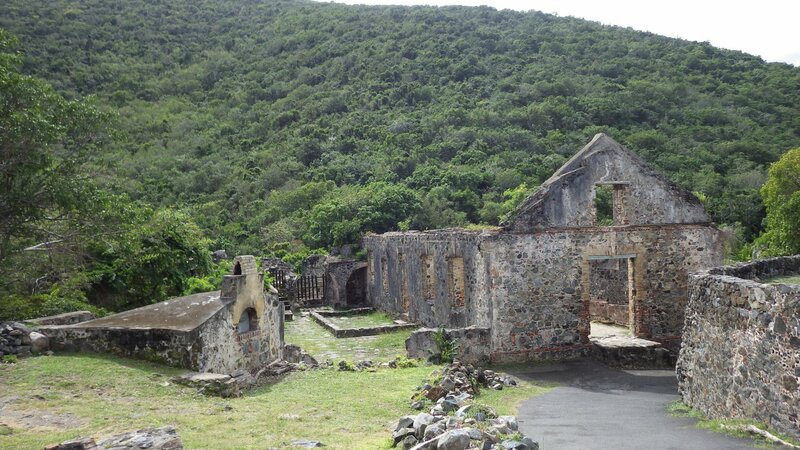 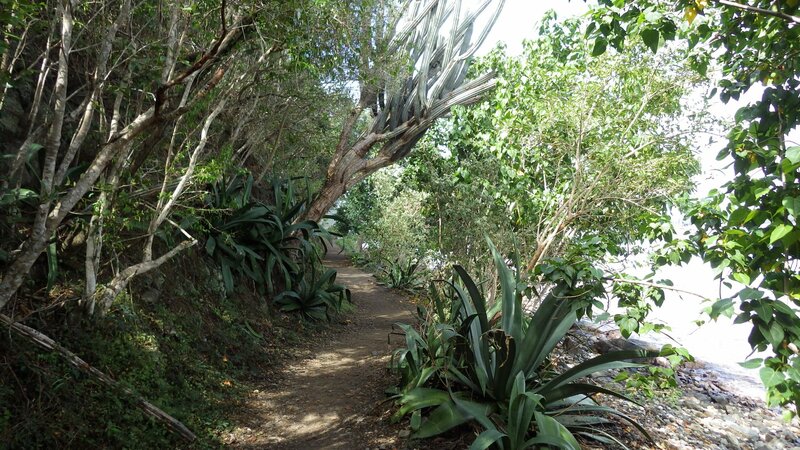 Then we had a hike up the hill, through bushy interior to the top of the island. 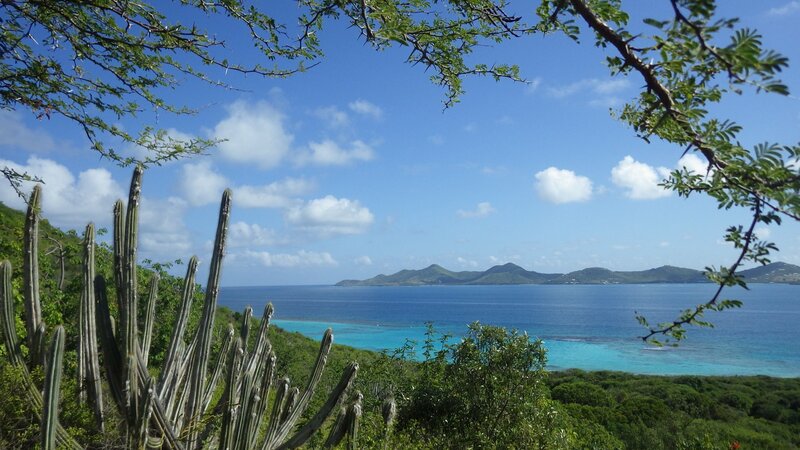 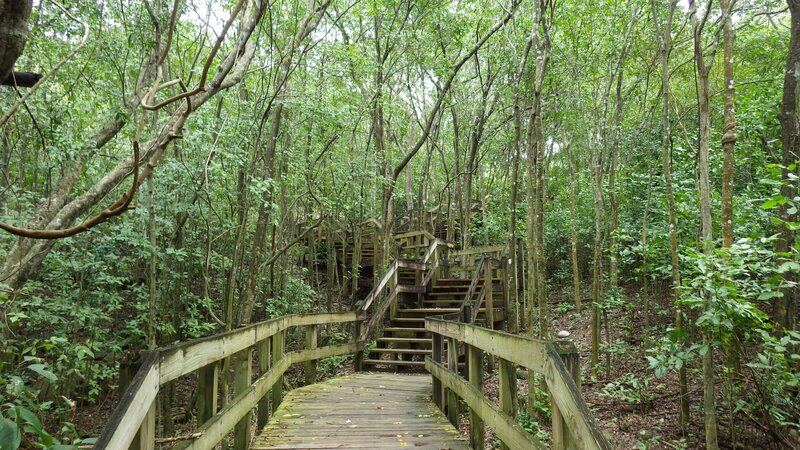 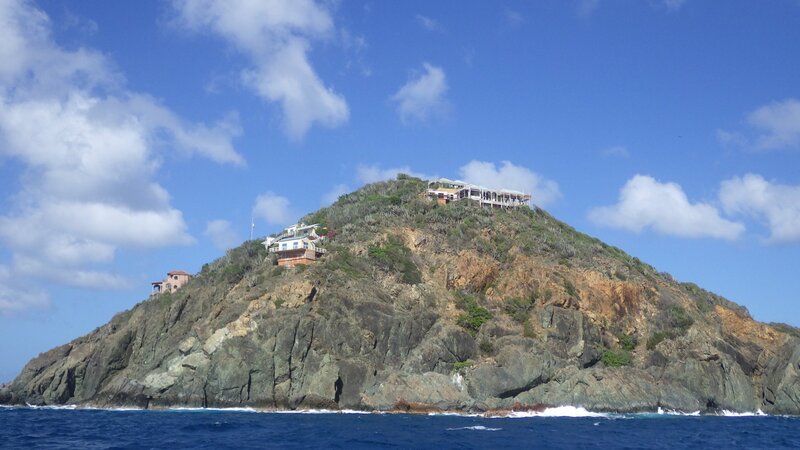 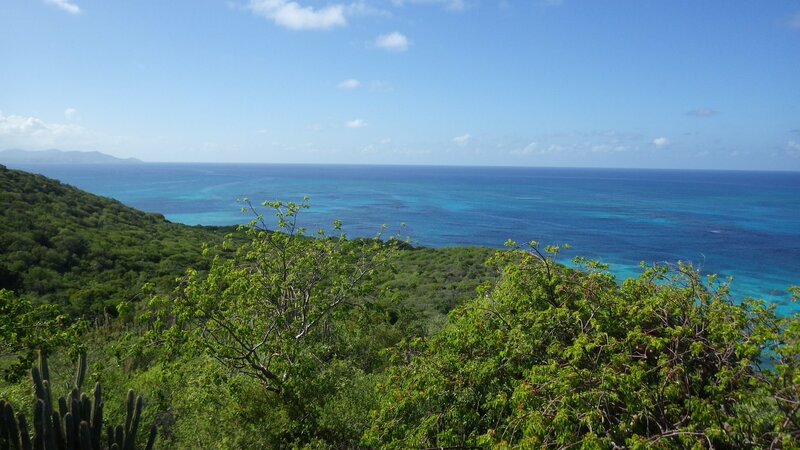 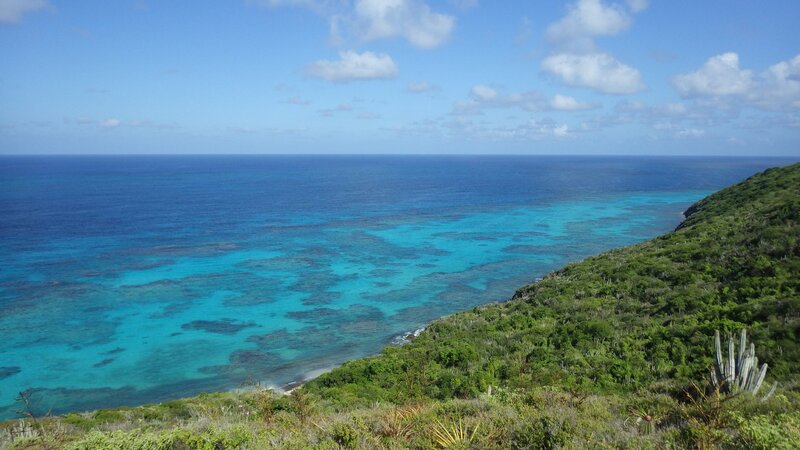 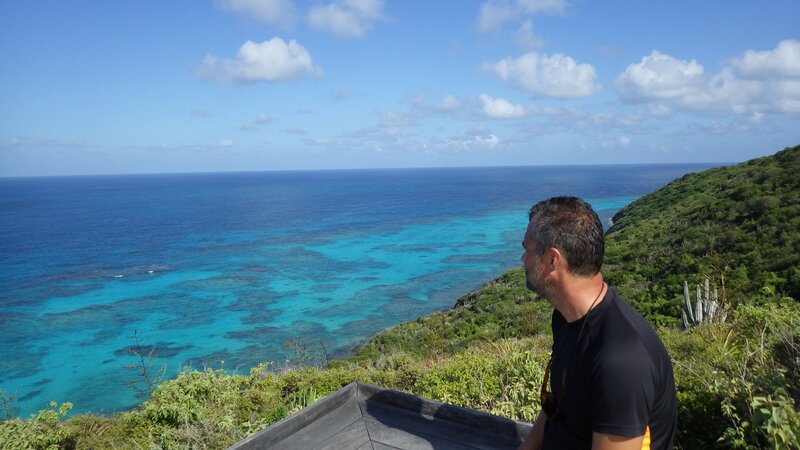 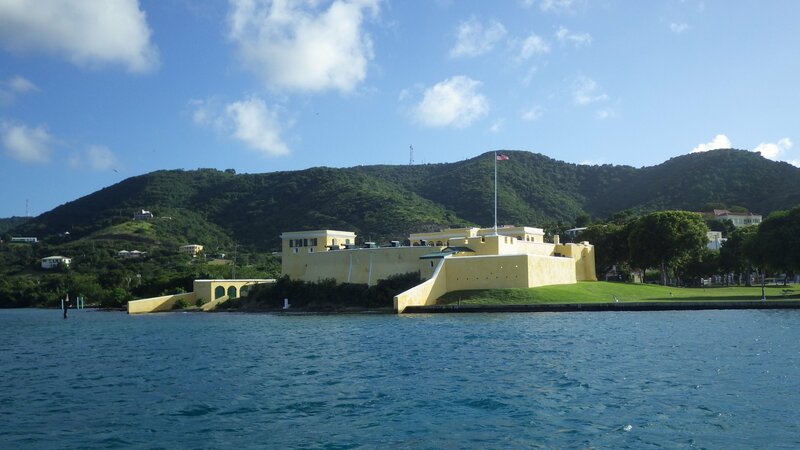 The observation deck there provides spectacular views of surrounding waters, coral formations and St. Croix � well worth the hot weather hike. 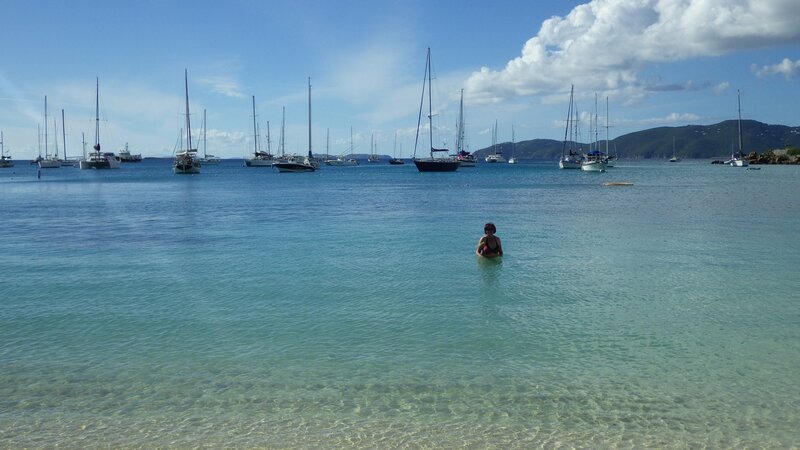 Before leaving the island we had a cooling swim at its beach. 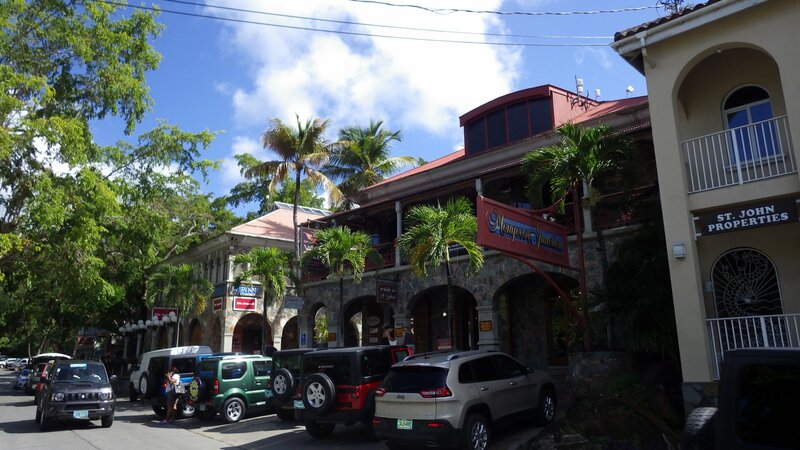 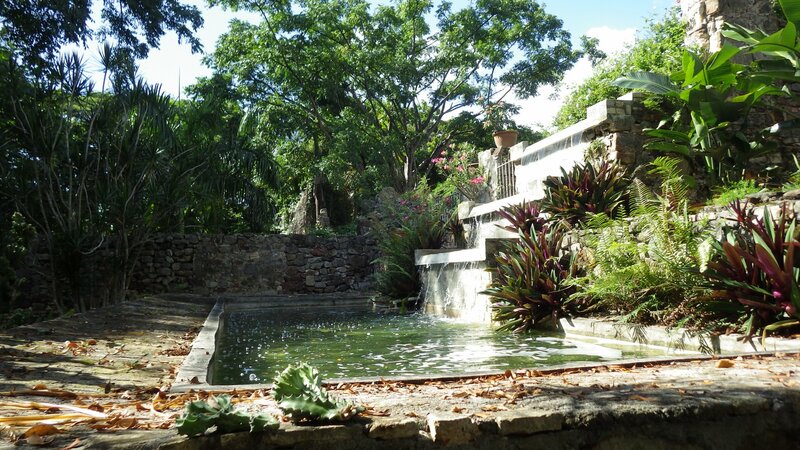 It is rated among the Caribbean's top 10. 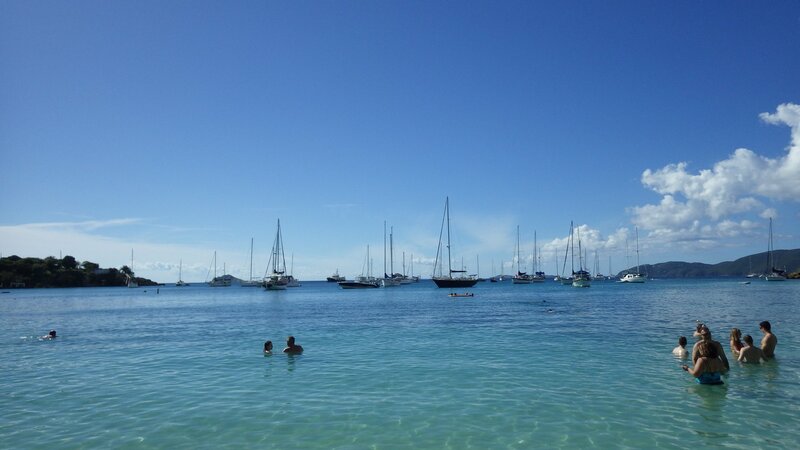 We found it crowded, noisy (it was weekend) and not that impressing. 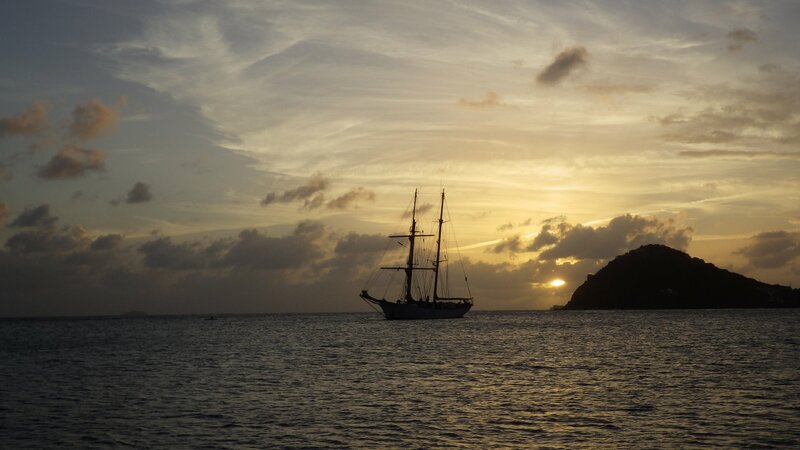 We finished the day by a really nice sail into the sunset with a dinner. 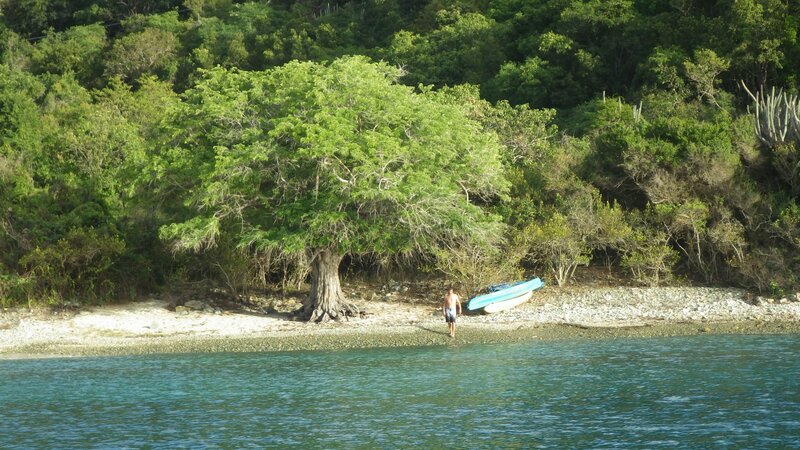 From Cr. 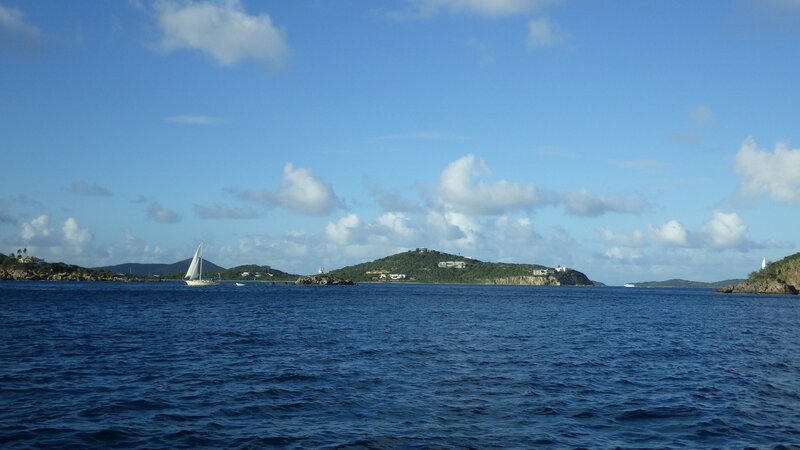 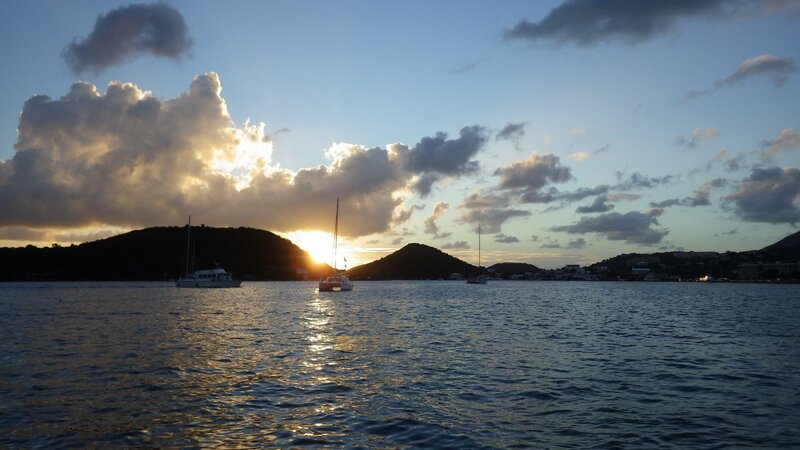 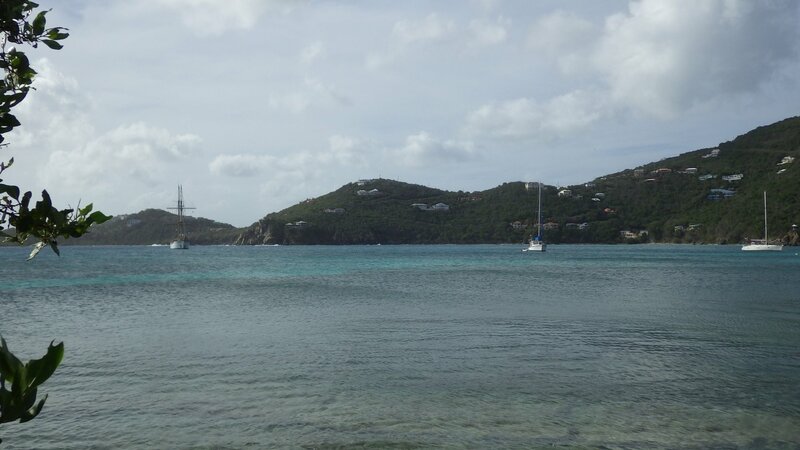 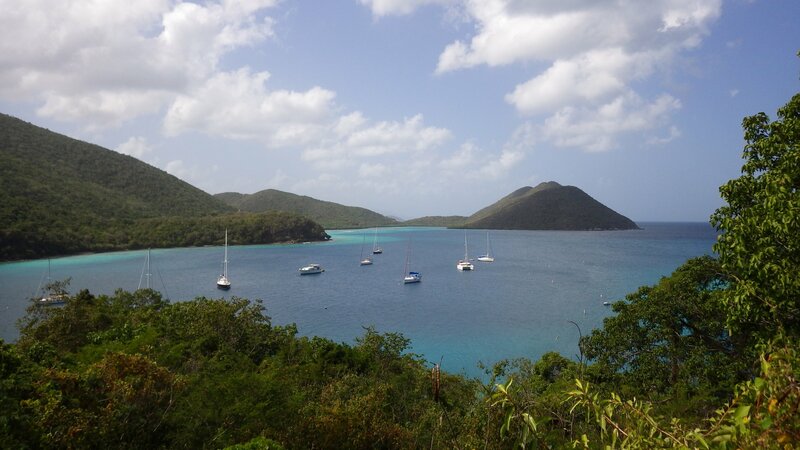 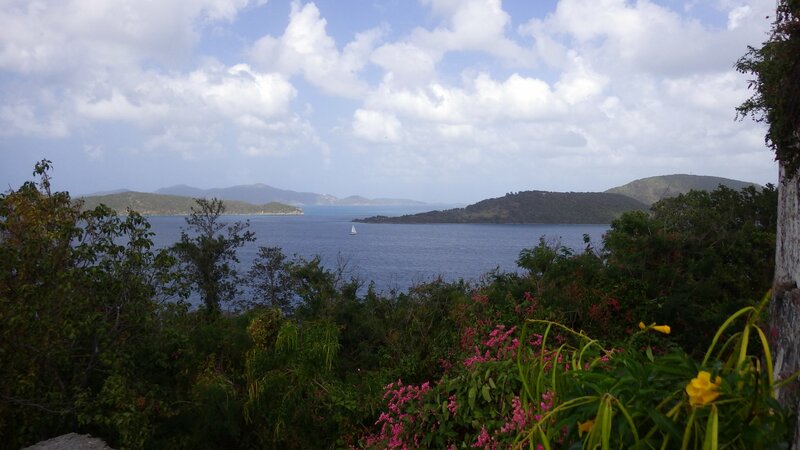 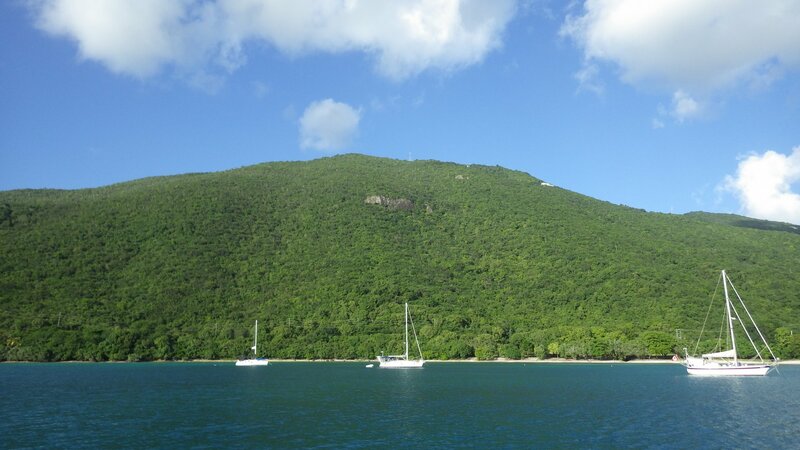 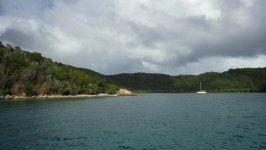 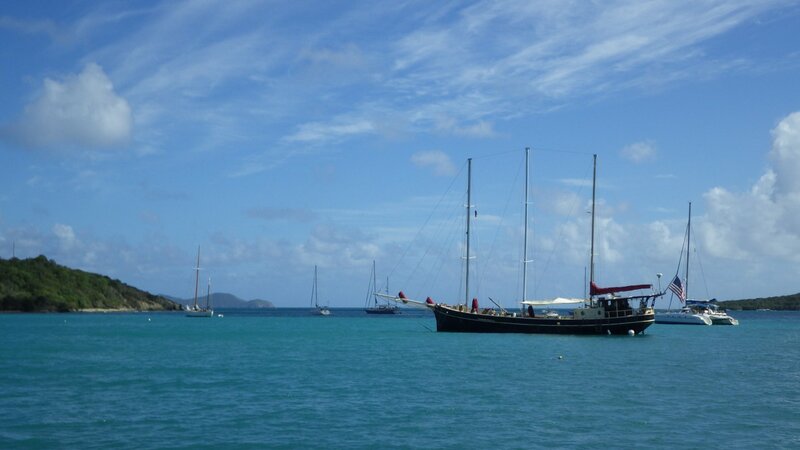 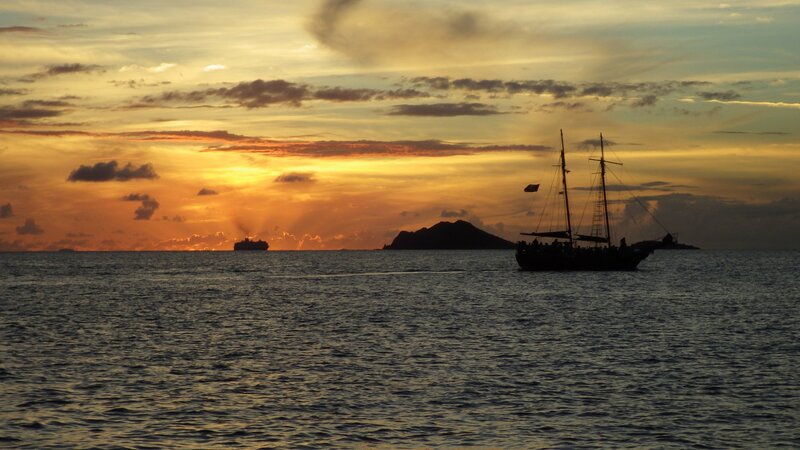 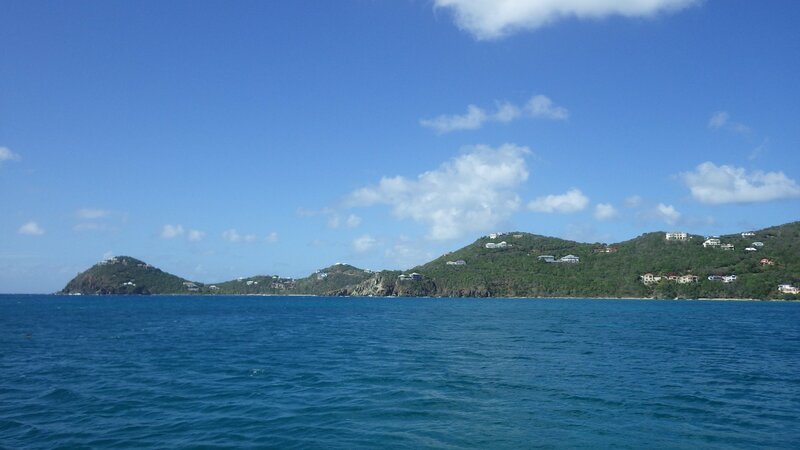 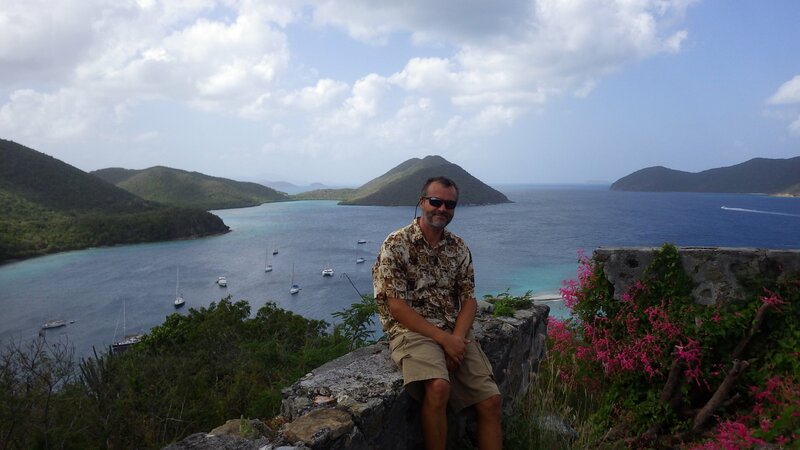 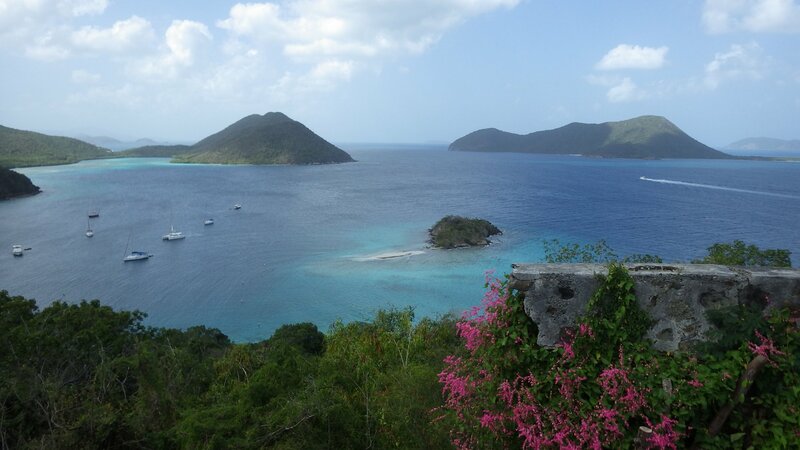 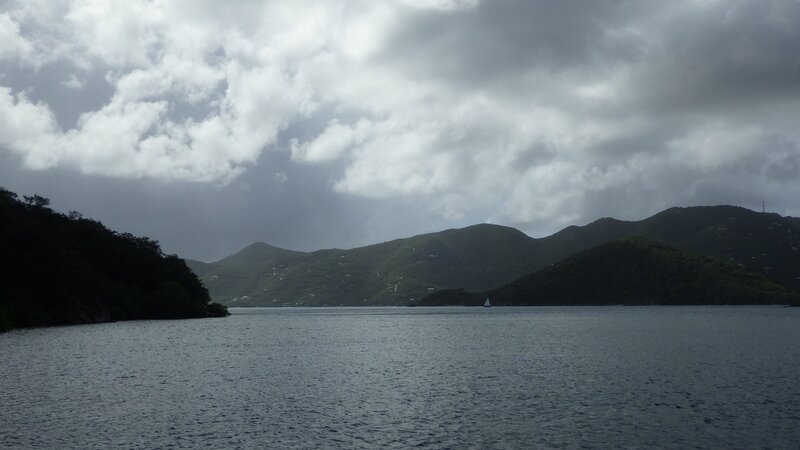 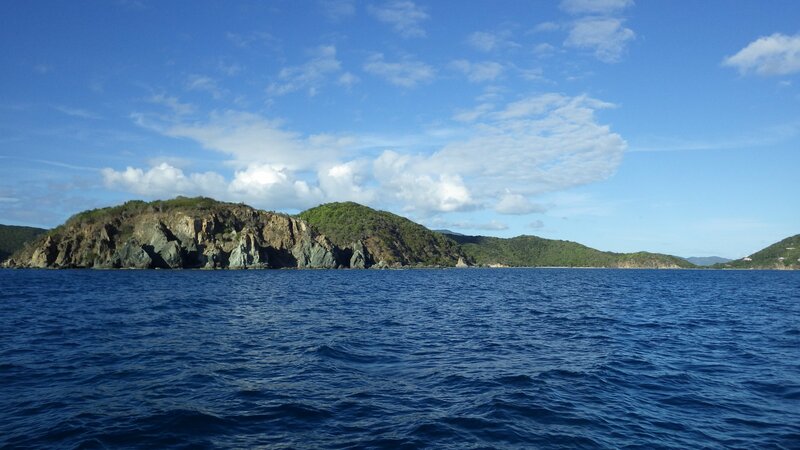 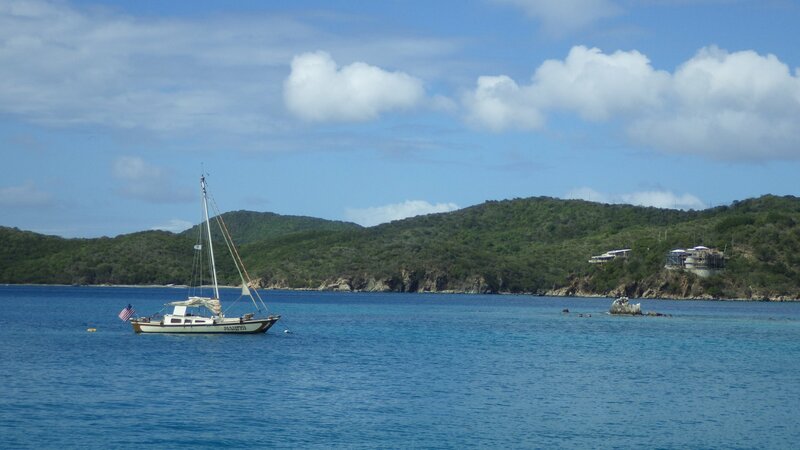 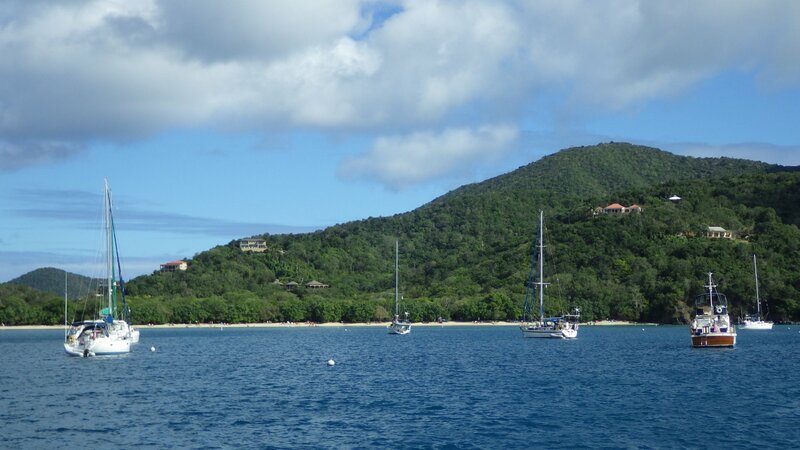 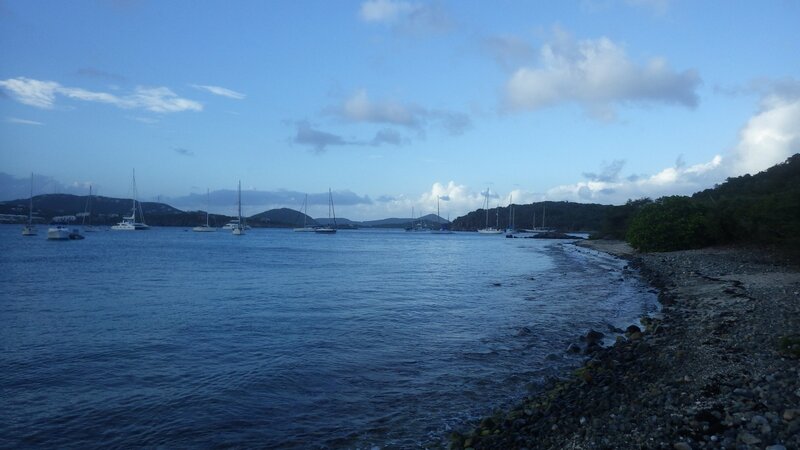 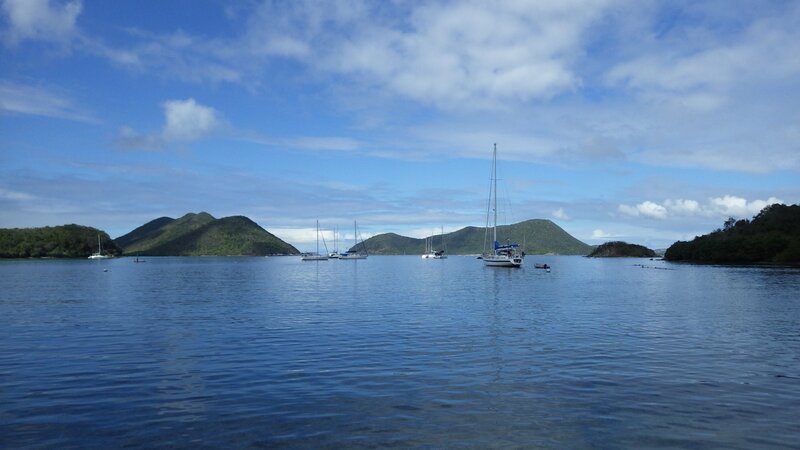 Croix, we sailed back to St. John Island. 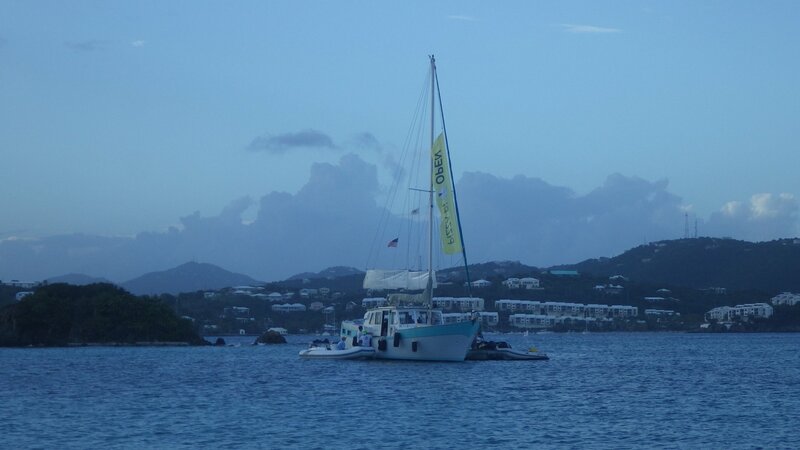 A replacement for our old ripped mailsail was ordered and due to arrive in several weeks in British Virgin Islands, so we sailed out of St. Croix on one sail. 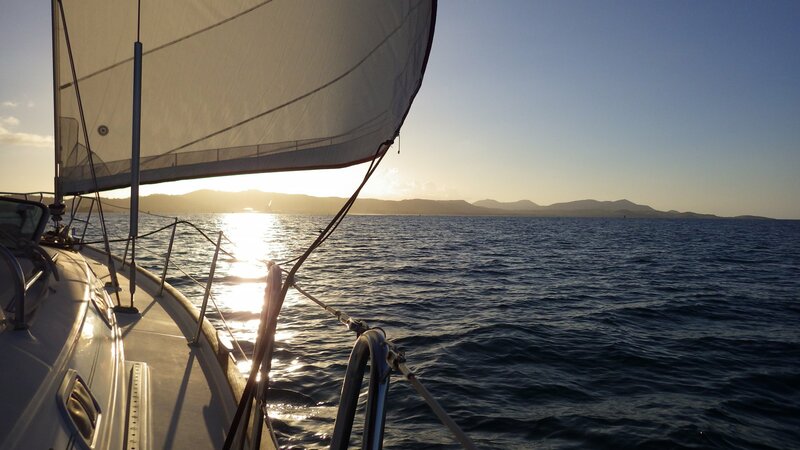 As always in cruising, timing is crucial � picking the right weather window with winds just right from the direction you want is the game. 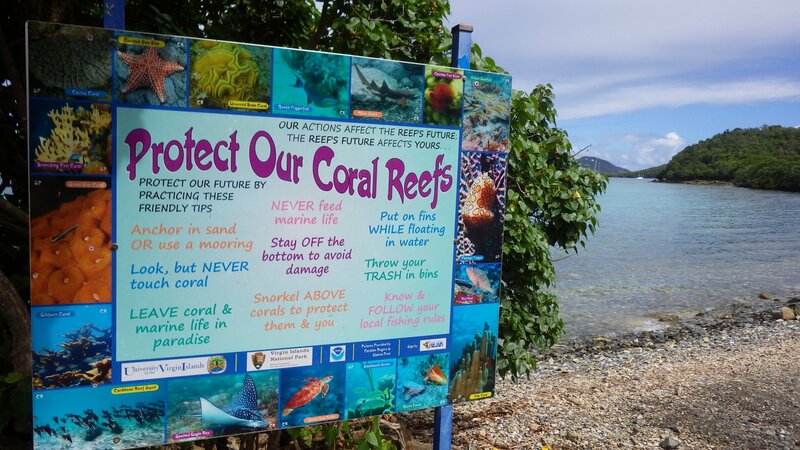 Had quick stops in earlier visited places - first at Princess Bay / Hurricane Hole to have clean water swim, and then in Coral Harbour town to get some internet/phone access and pickup groceries. 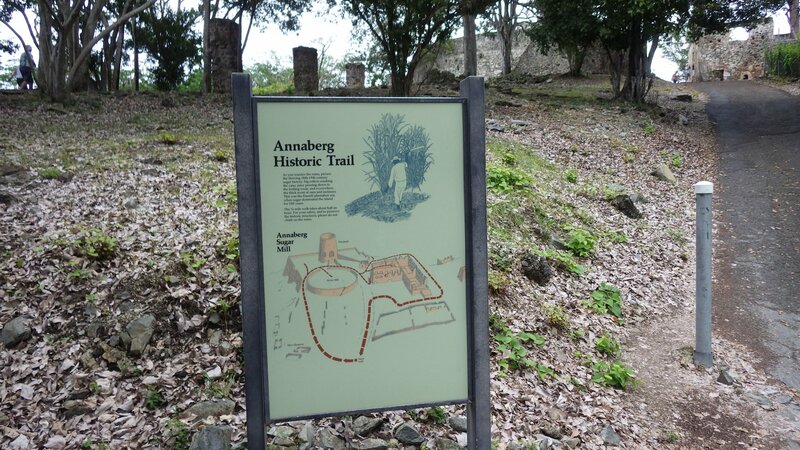 It's interesting to come back to places visited before � almost like getting back home. 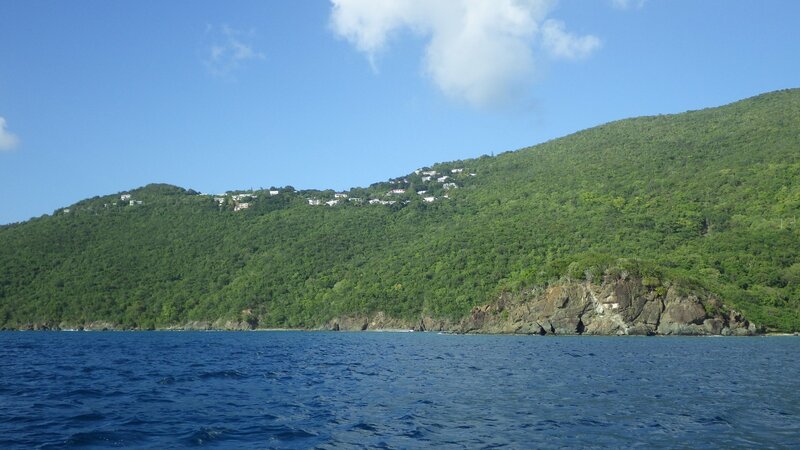 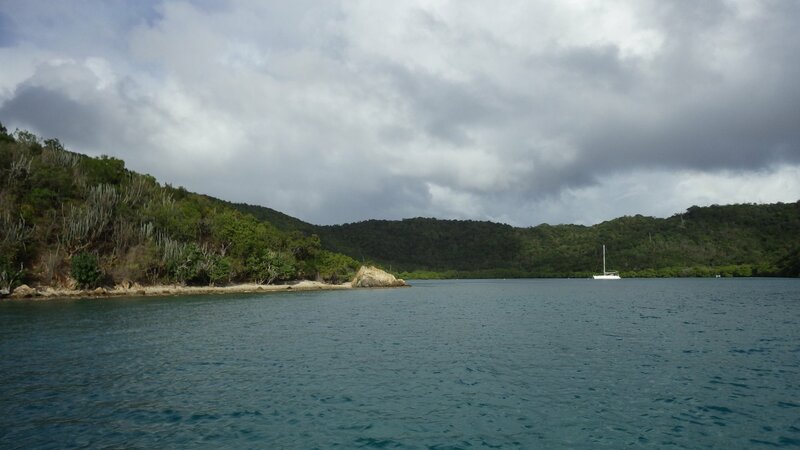 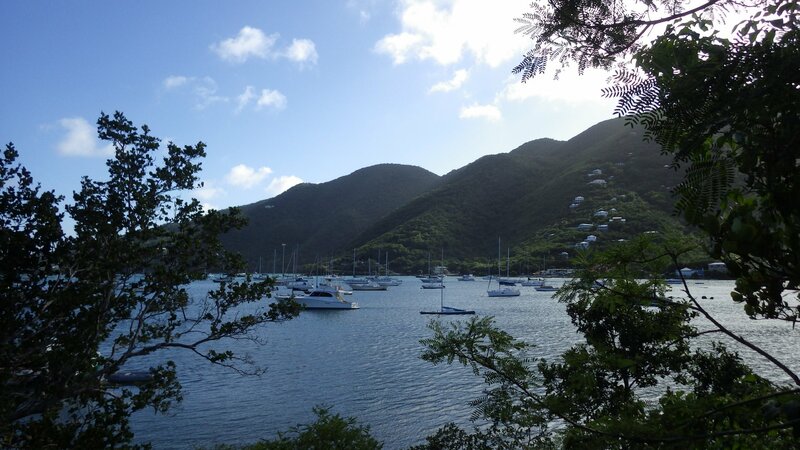 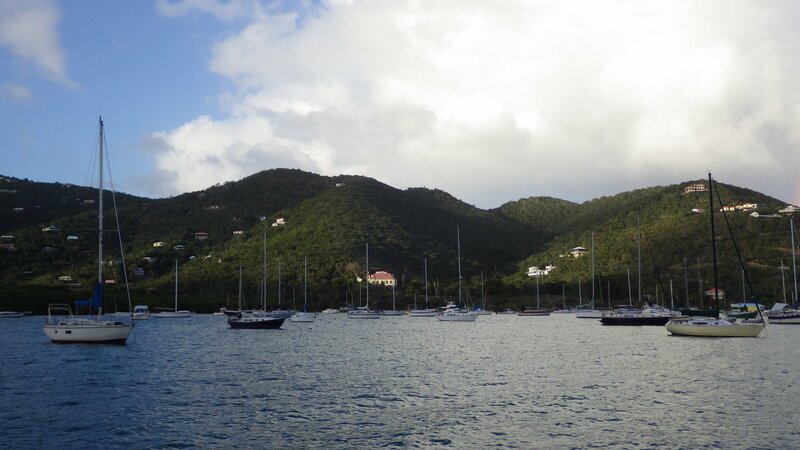 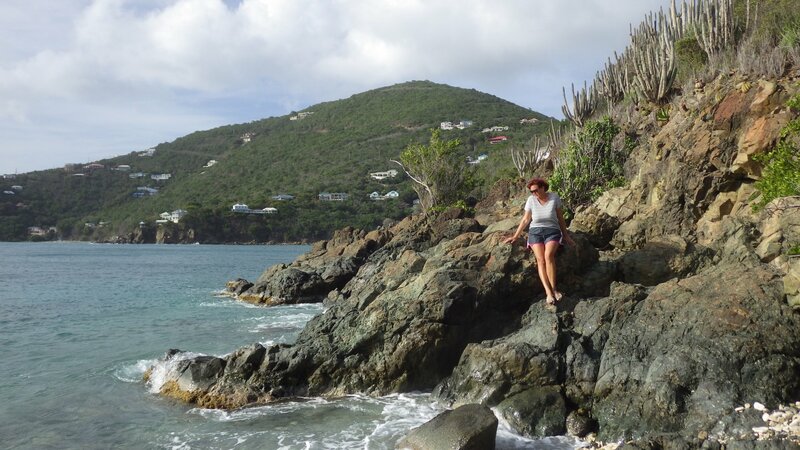 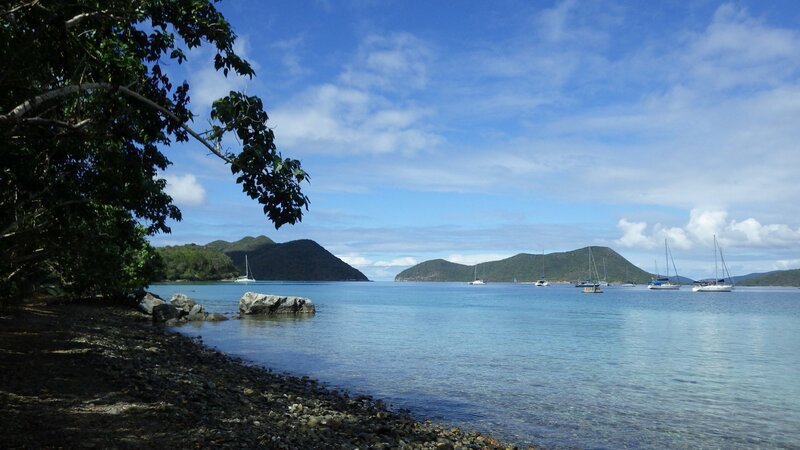 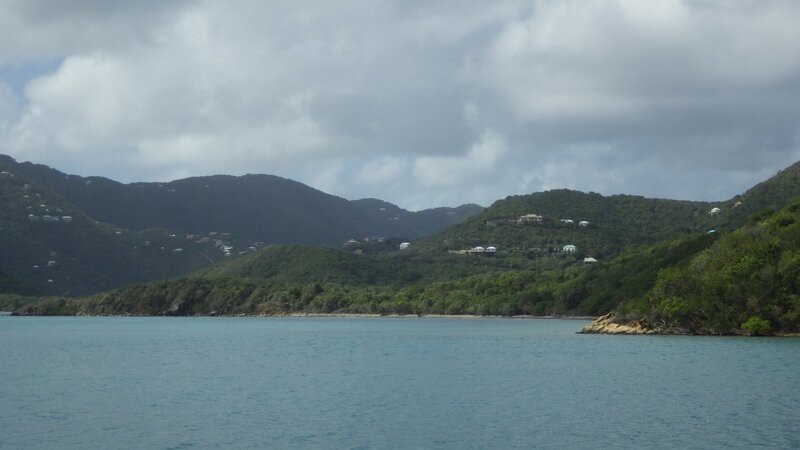 Our next stop was Francis Bay on the north shore of St. John. 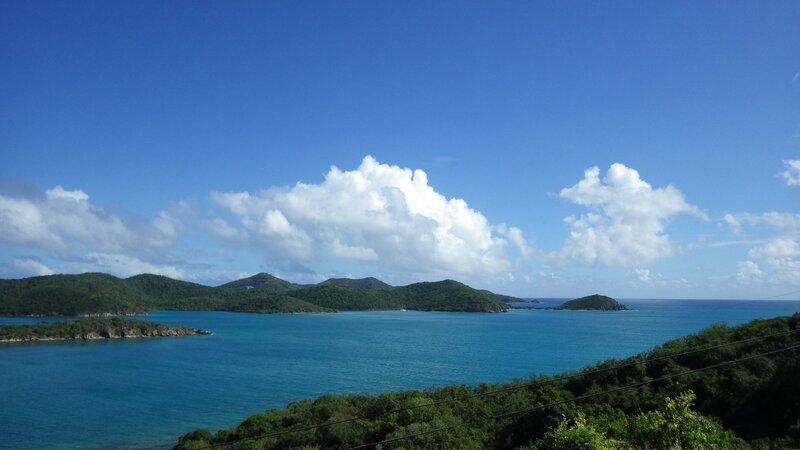 I have read about it as the best bay on the island. 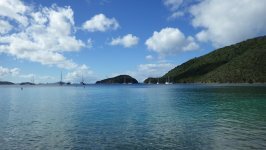 It is pretty, no doubt � beautiful and protected bay surrounded by tall lush mountains, calm blue water, and lovely beach � although quite crowded. 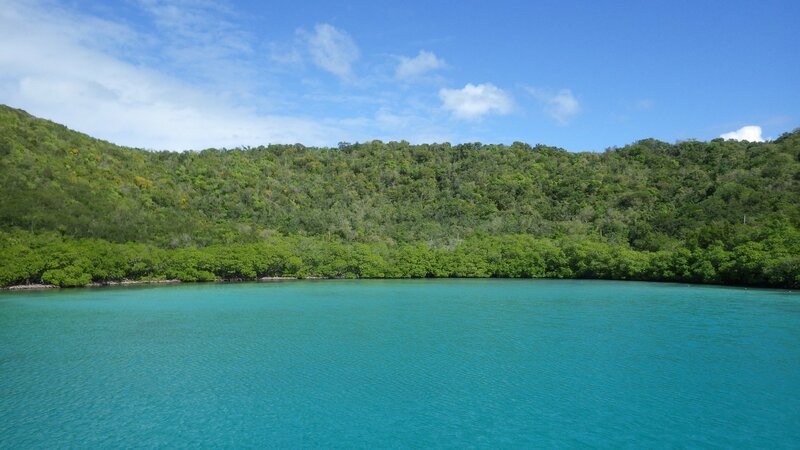 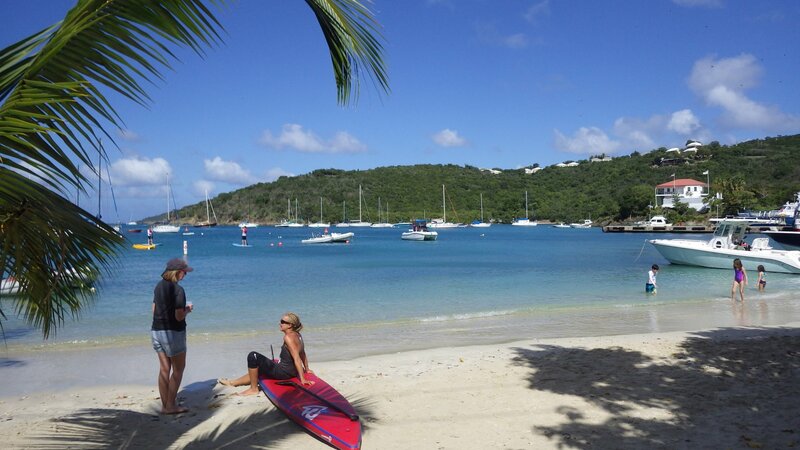 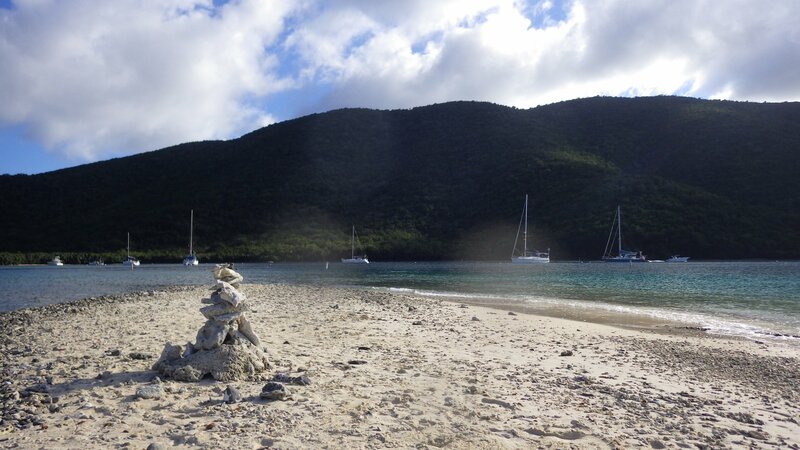 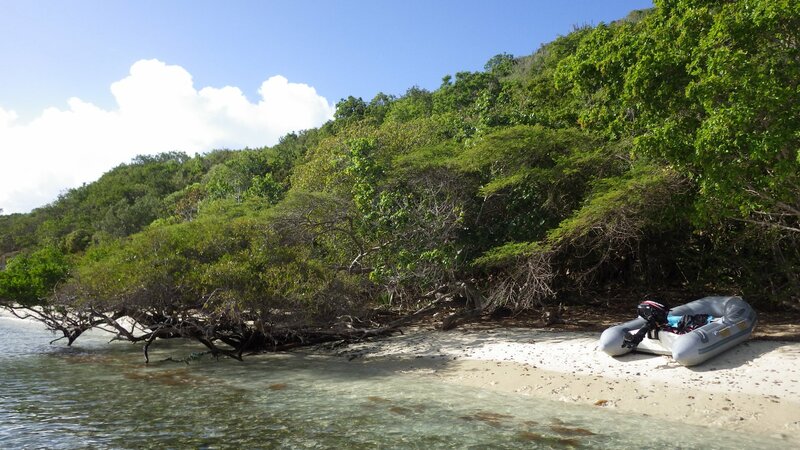 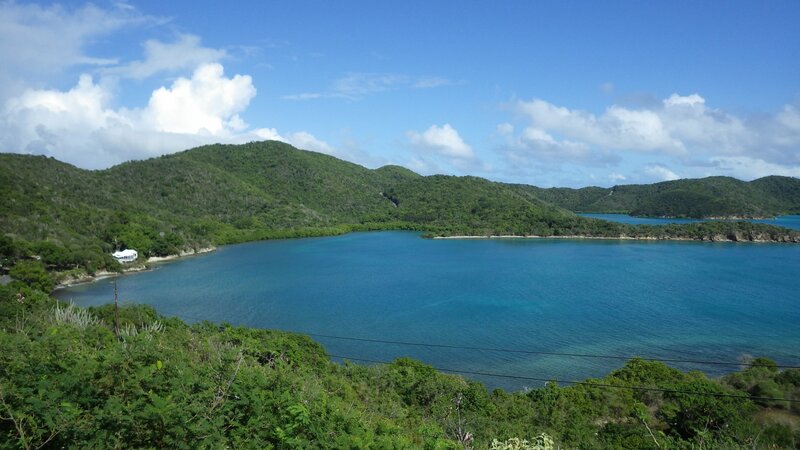 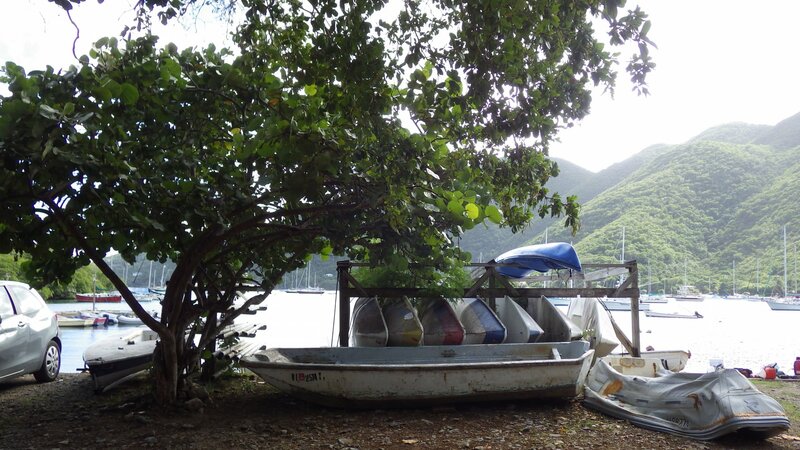 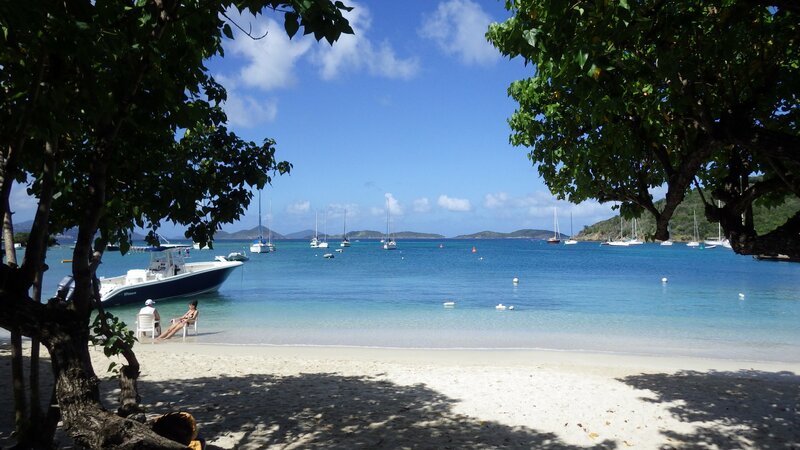 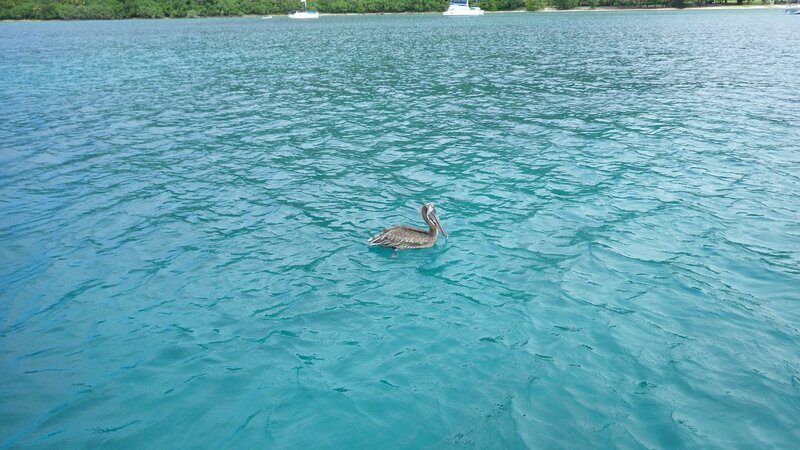 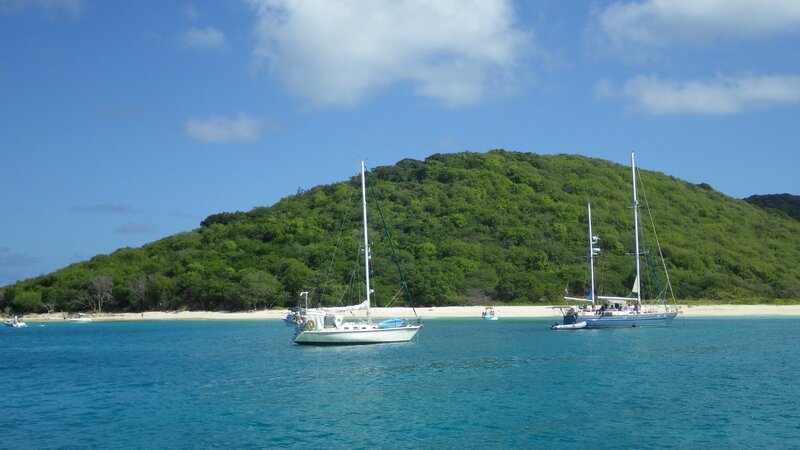 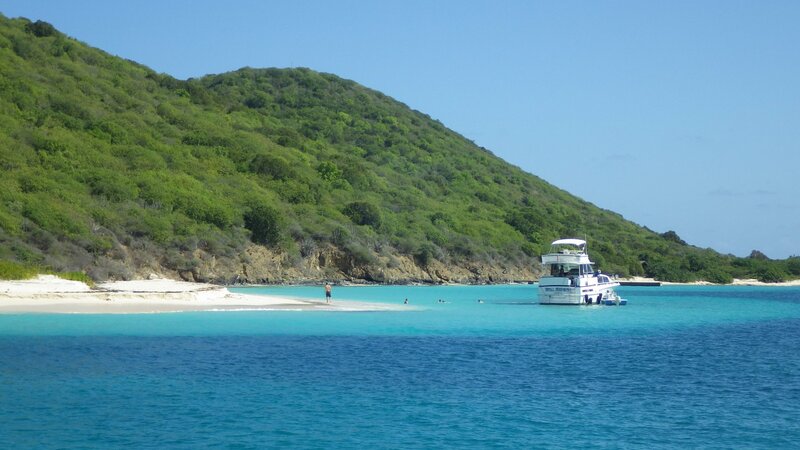 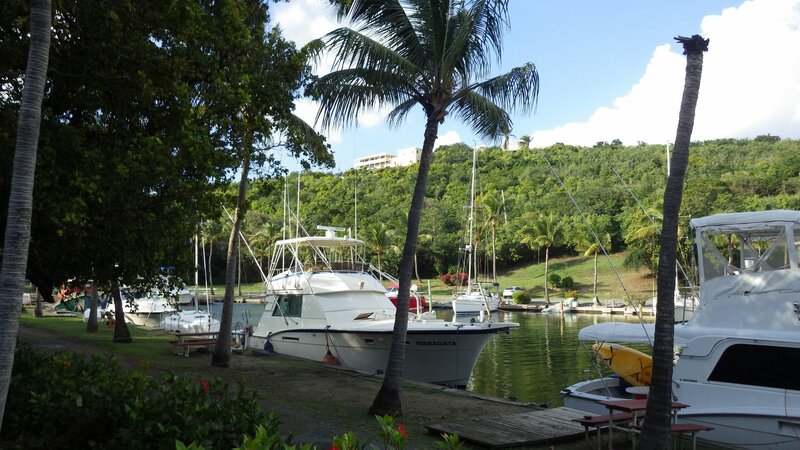 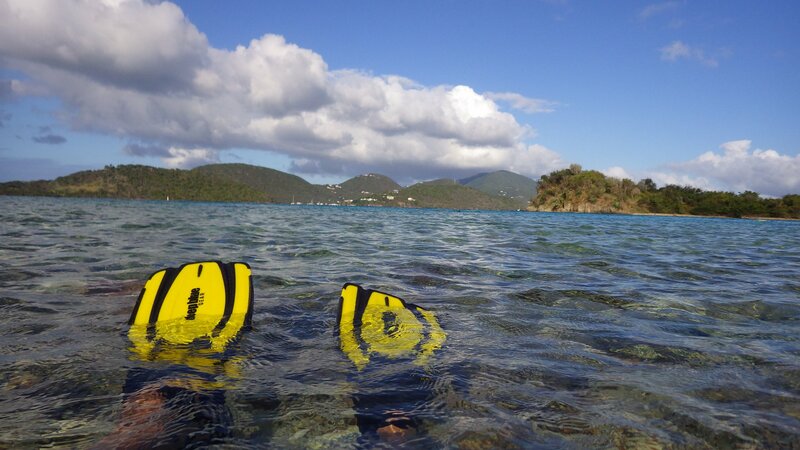 As with all places in St. John Natural Park, no anchoring allowed for the protection of seabed � you have to pick up and pay for a mooring ball. 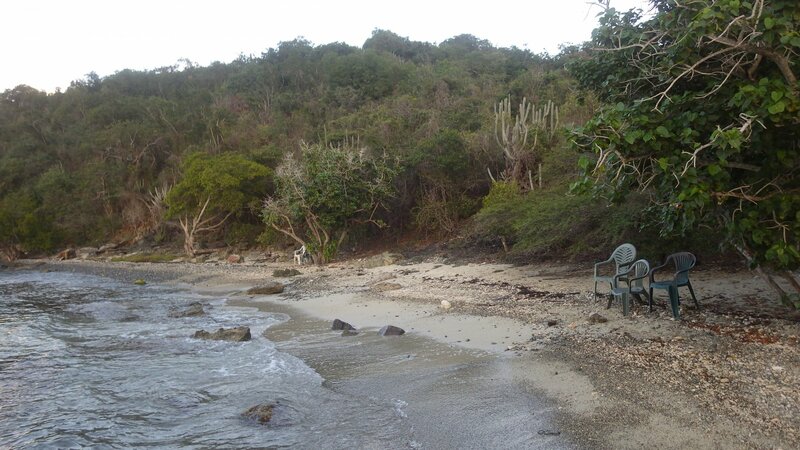 So much for the "free" park as it was originally established by Rockefeller... 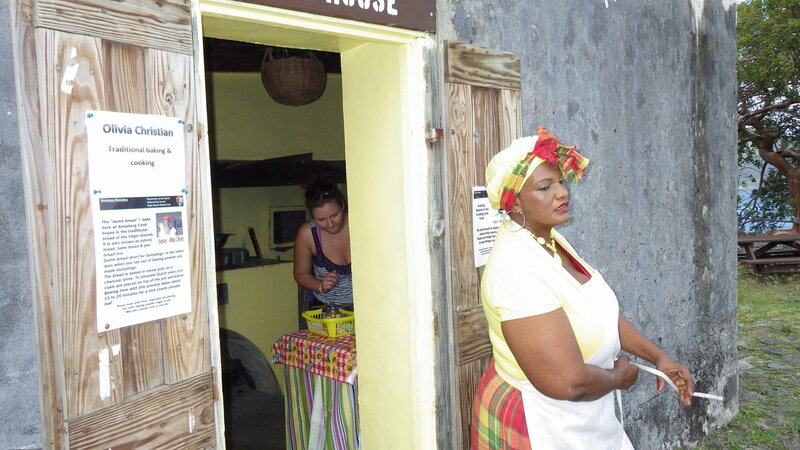 Right at the entry, we met with a fairly aggressive self-appointed "volunteer" telling us all about rules etc. 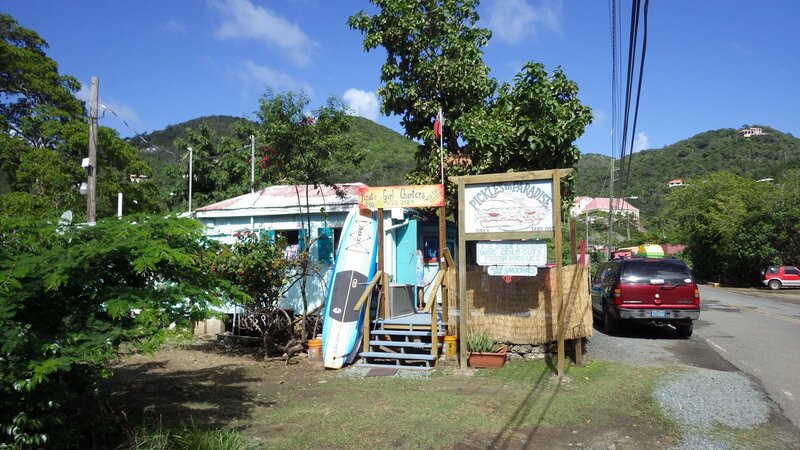 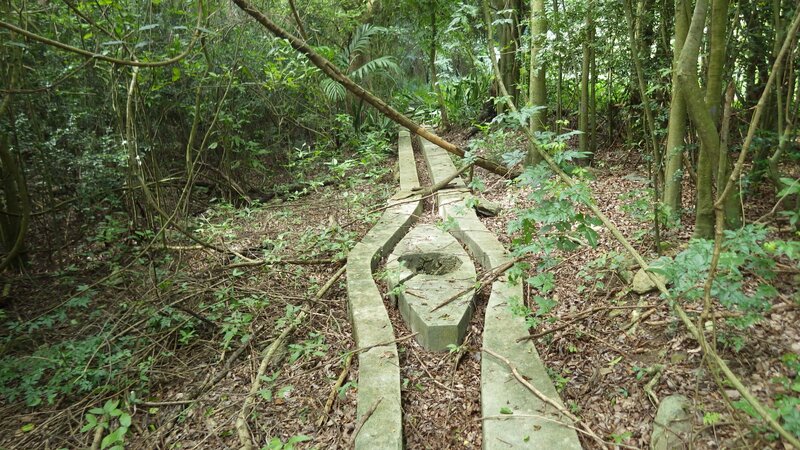 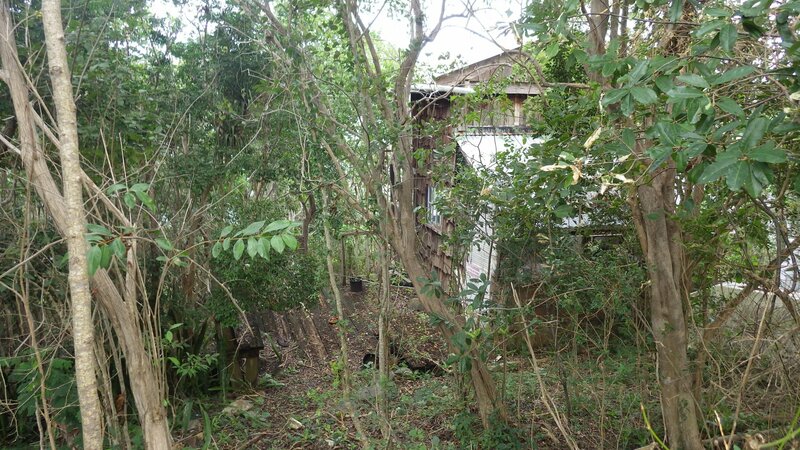 Stayed here one night � swimming at the beach, hiking some trails... - but for some reason the place it didn't feel right. 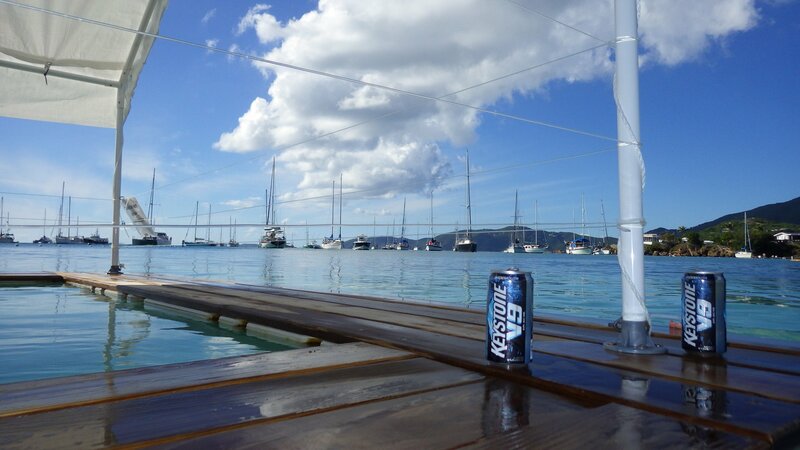 So next morning we left. 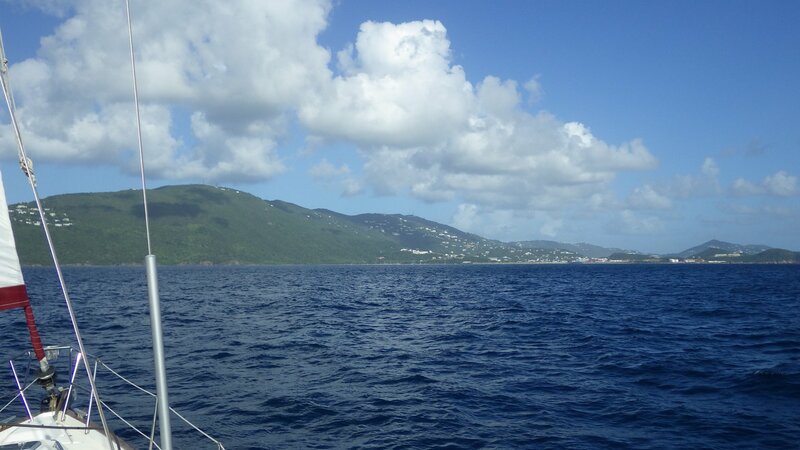 While motoring against winds, waves and current to our next stop, I noticed a black smoke coming out of the exhaust pipe. 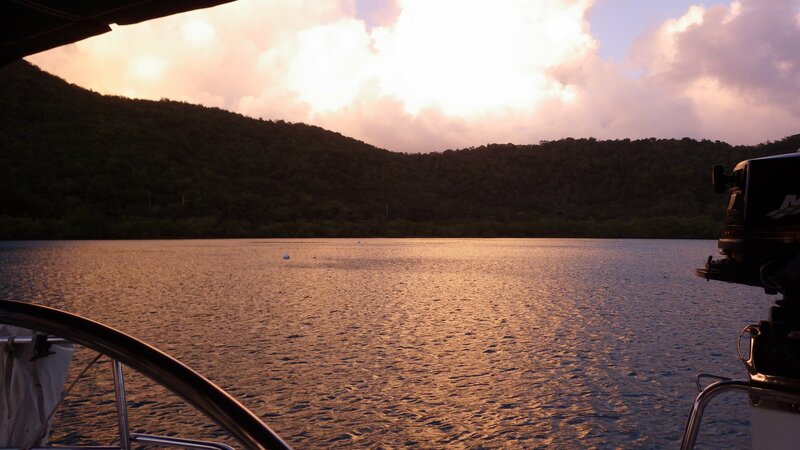 As soon as we arrived at Leinster Bay, I opened my toolbox, engine manuals and books looking for the problem. 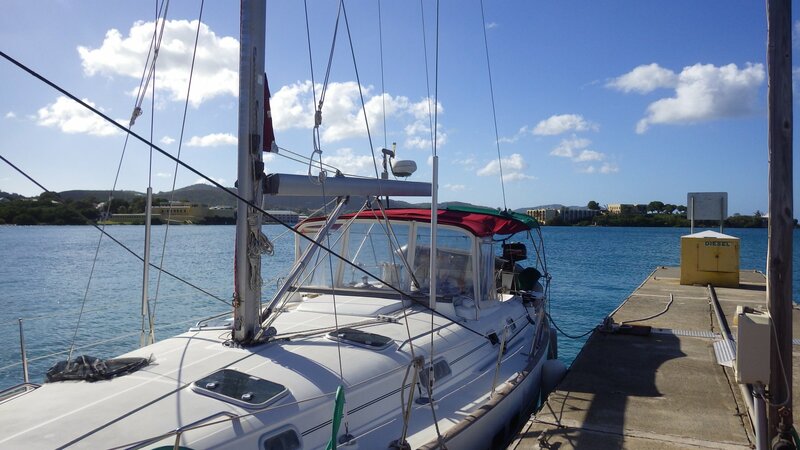 It turned out that engine's water pump impeller was broken and engine was overheating. 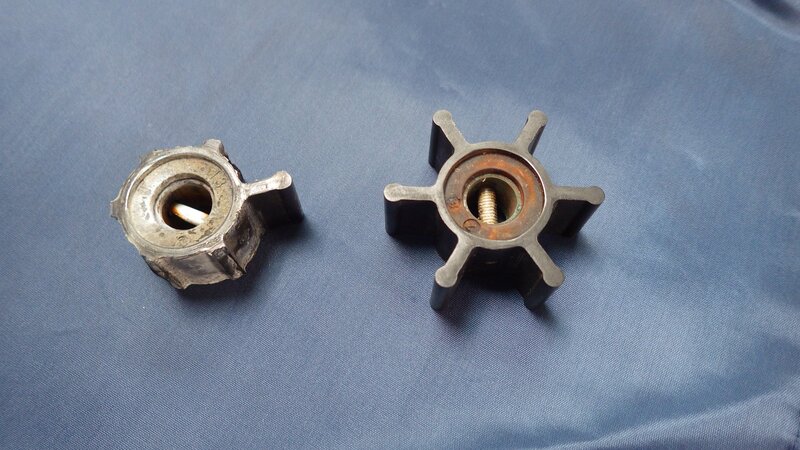 It is not uncommon occurrence and prudent cruiser always caries as spare impeller, as I did. 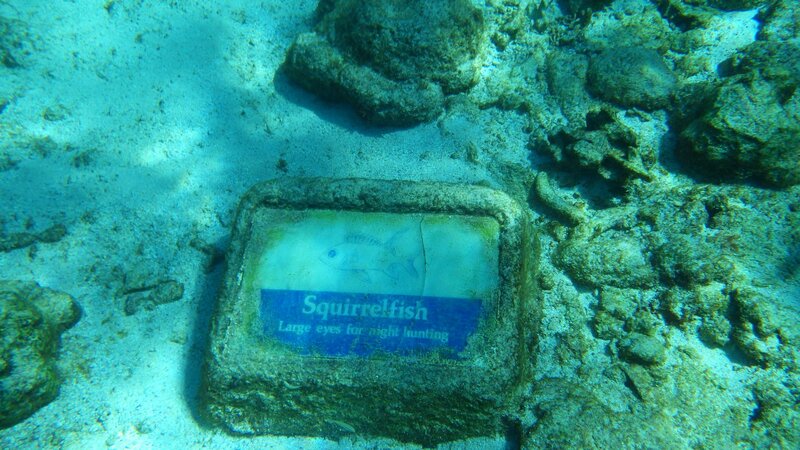 Replacing it fixed the problem. 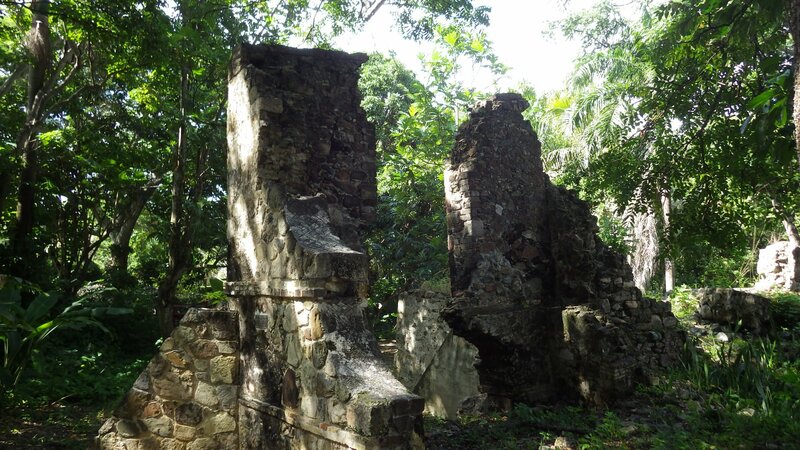 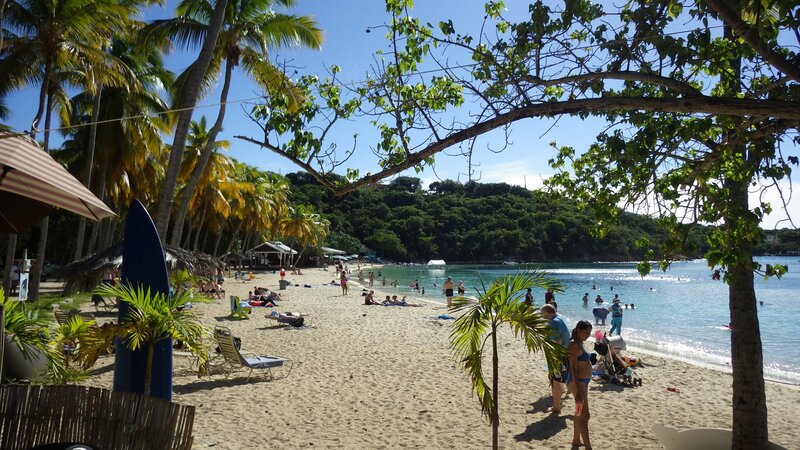 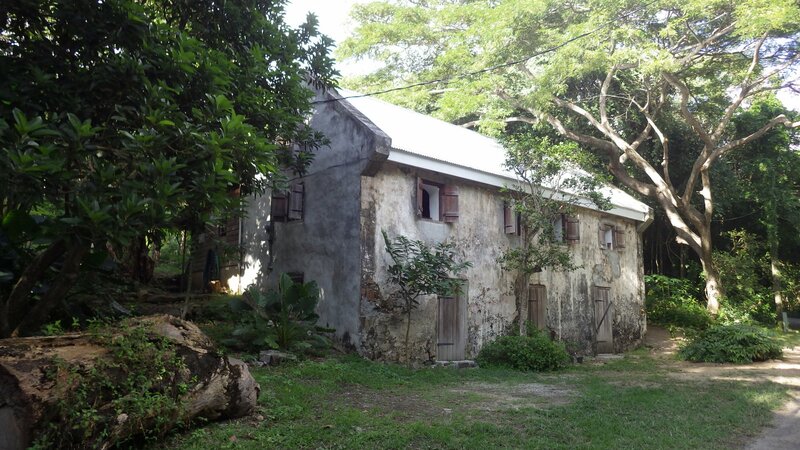 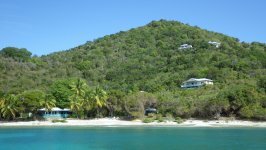 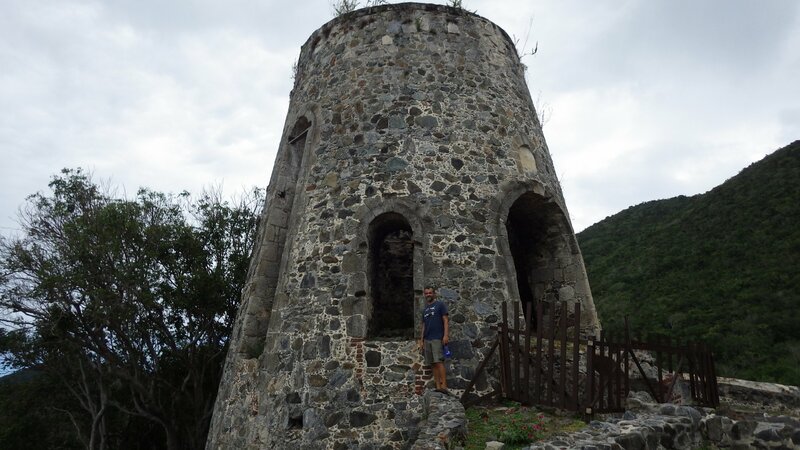 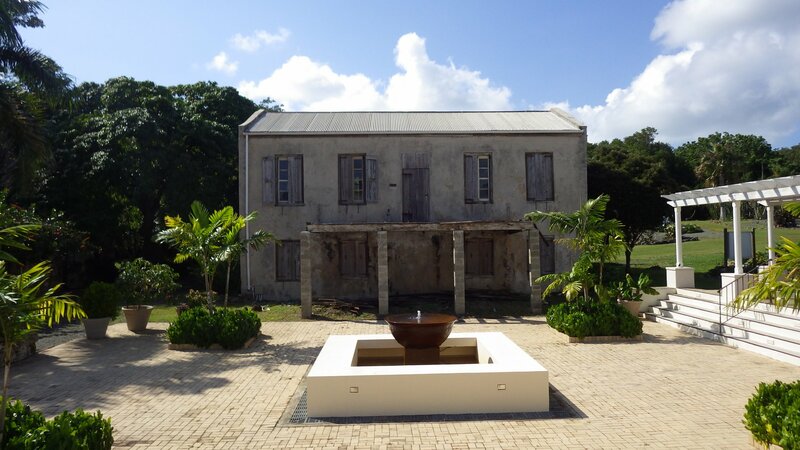 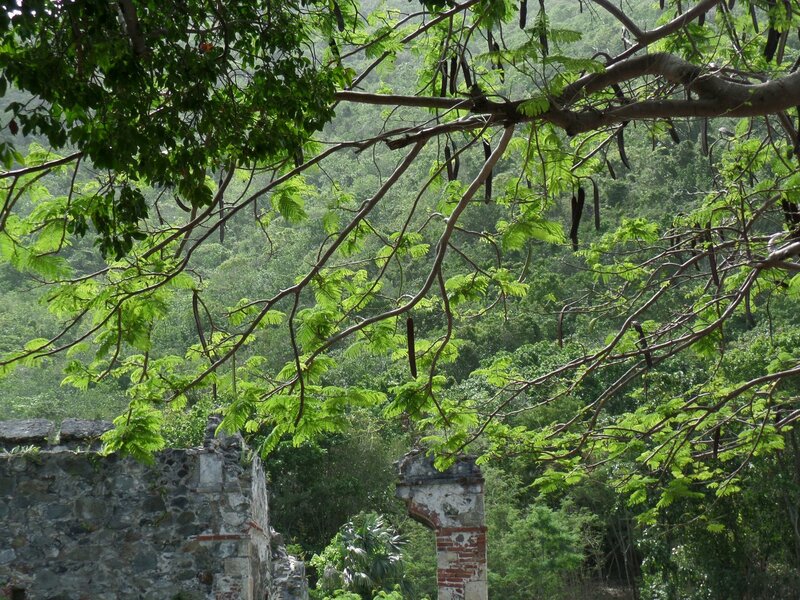 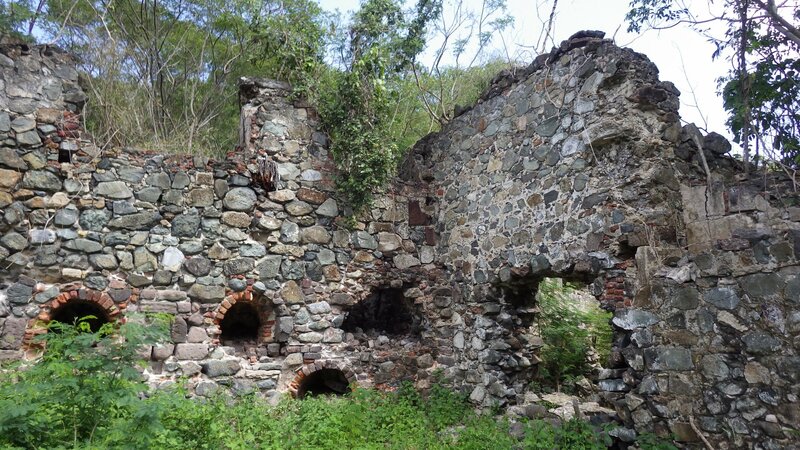 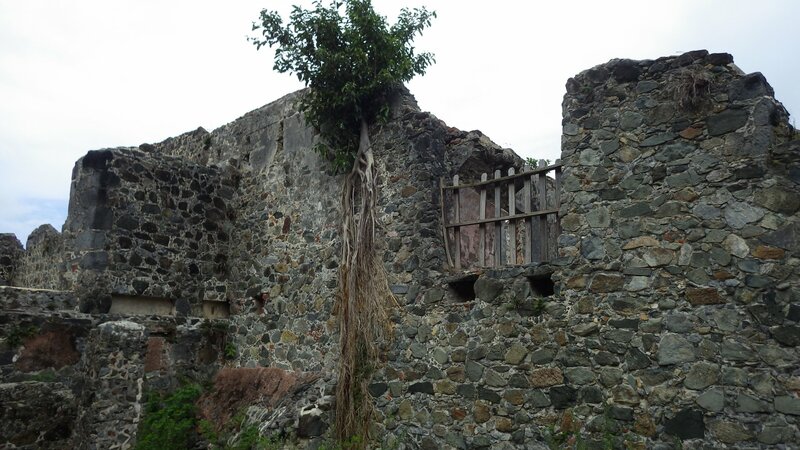 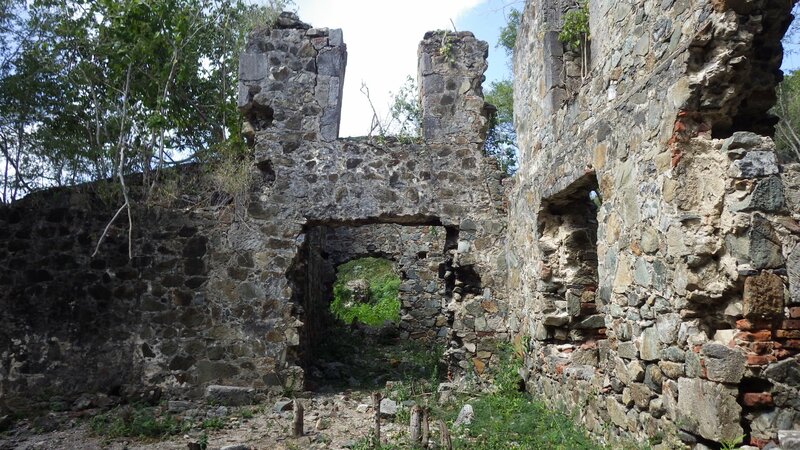 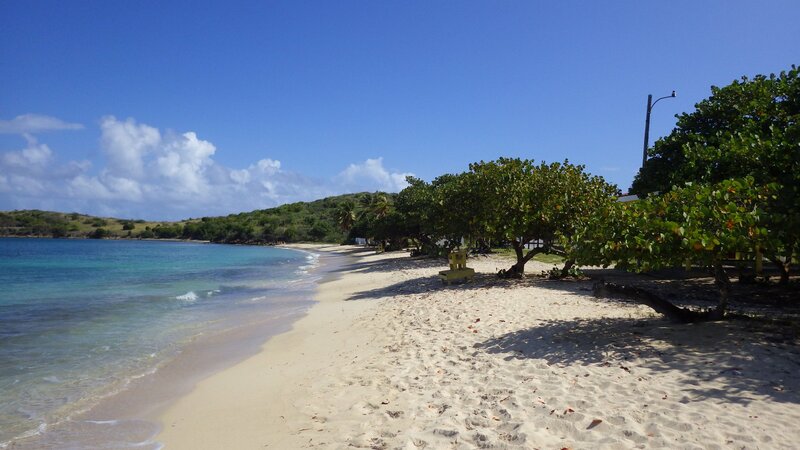 We stayed couple days in the Leinster Bay � swimming on the beach, snorkeling at the Waterlemon Cay and visiting nearby sugar plantation ruins. 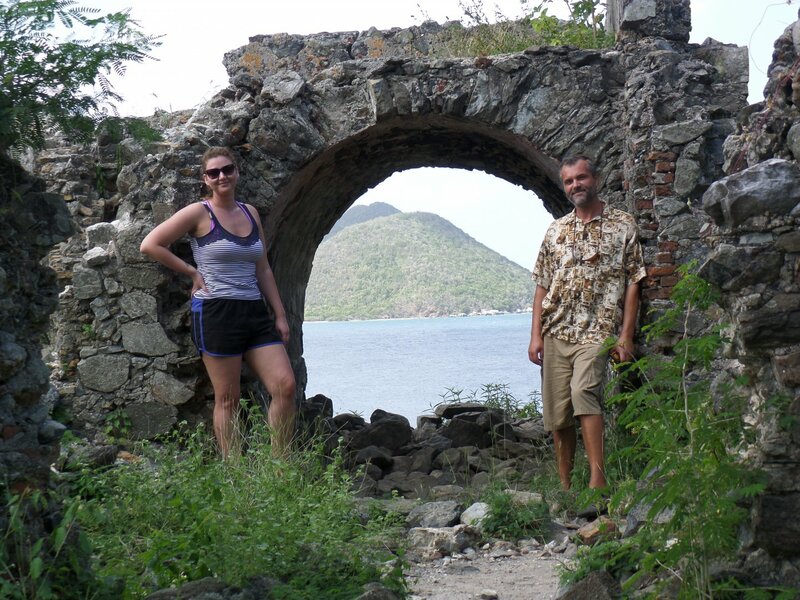 We also visited this place second time couple weeks later when our daughter had joined us.